Every day, I get around fifteen mails offering me wine for sale. My passion is bulimic, I struggle to buy as little as possible. But the emails propose wines that will tempt me, as the salesmen know my wishes. 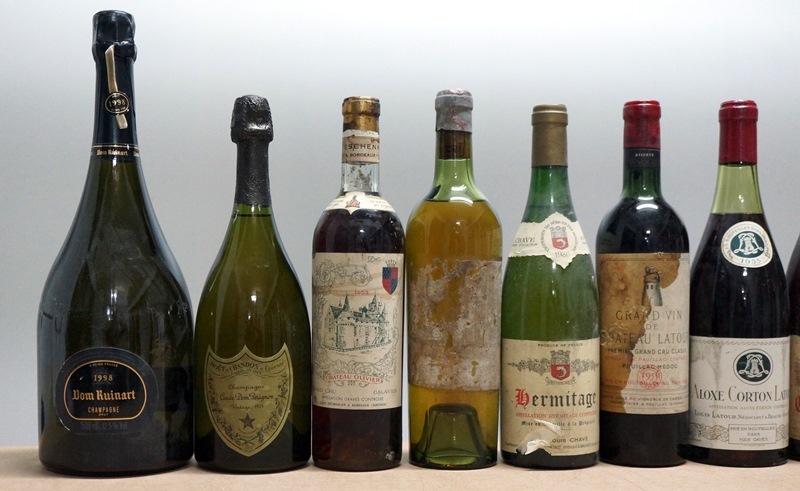 One mail offers two legendary wines: Dom Perignon 1934 and 1948 Salon. 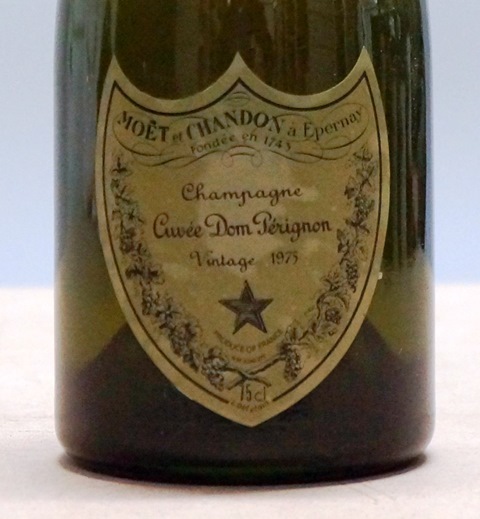 Dom Perignon of the thirties are virtually never on sale, and the 1948 Salon is of one year for which I have never seen any offer. 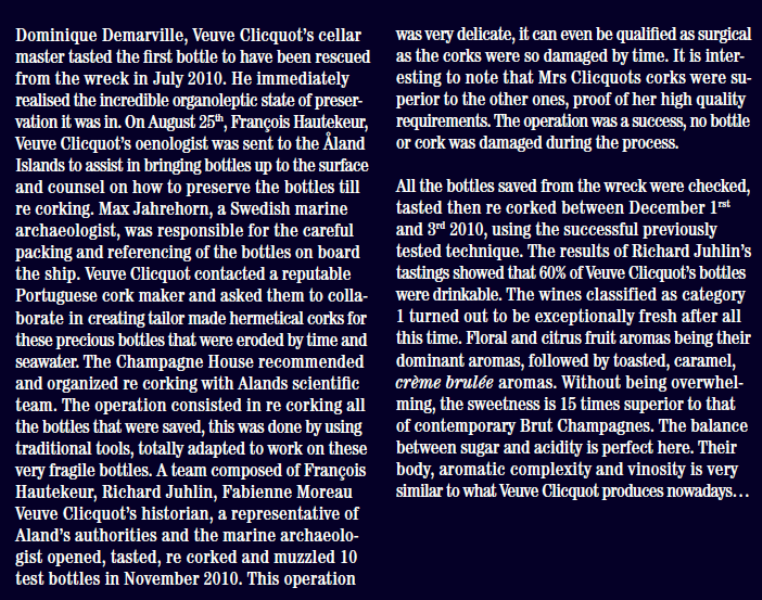 In the email, the prices offered place these champagnes tariff at the level of Romanée Conti of average years. 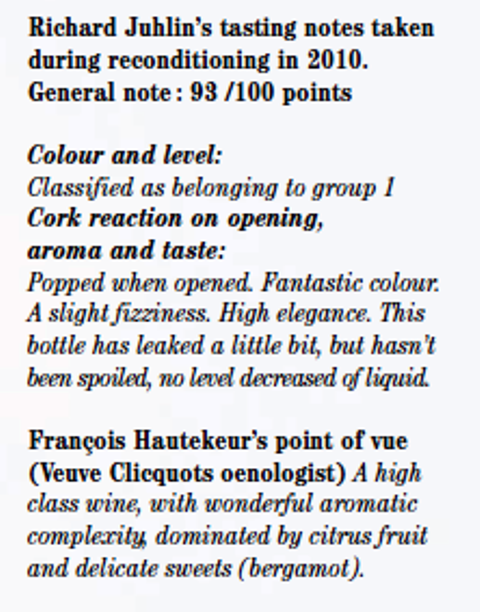 Since ancient champagnes have a large uncertainty factor, these prices are unacceptable to me. But to let those bottles whose photos are beautiful, it would be a mistake. I call my friend Tomo and I propose that we buy the two bottles together with the idea that we have dinner the two of us to share them. Tomo accepts. 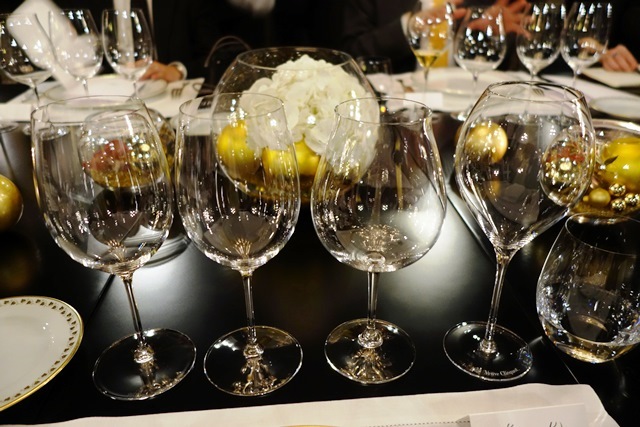 Time passes and, remembering the meal with Les Gaudichots 1929 Domaine de la Romanee Conti where we invited Aubert de Villaine, the very natural idea is to ask Richard Geoffroy of Dom Perignon and Didier Depond of Champagnes Salon Delamotte to join us. A date is found suitable for these two characters with overloaded agendas. 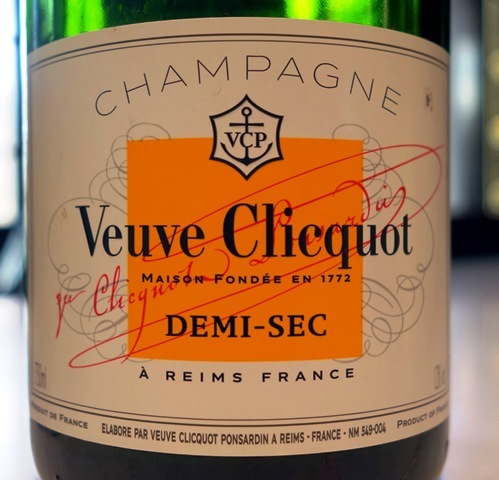 Peter, a Scottish friend who could not come to the 196th dinner at the Veuve Clicquot location in Rheims wanted to see me to share great champagnes and Florent, a Lyon friend would also like to share great wines. 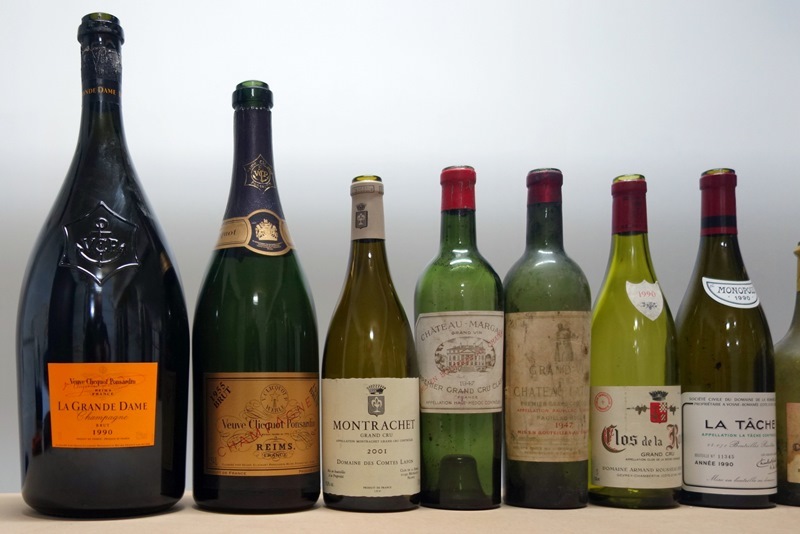 Our group of six forms, and as often happens, generosity turns to excess to the point that we will have nine bottles plus three magnums making an equivalent of 15 bottles for 6, which means 2.5 bottles per guest. It is anything but rational, but how could I refuse? 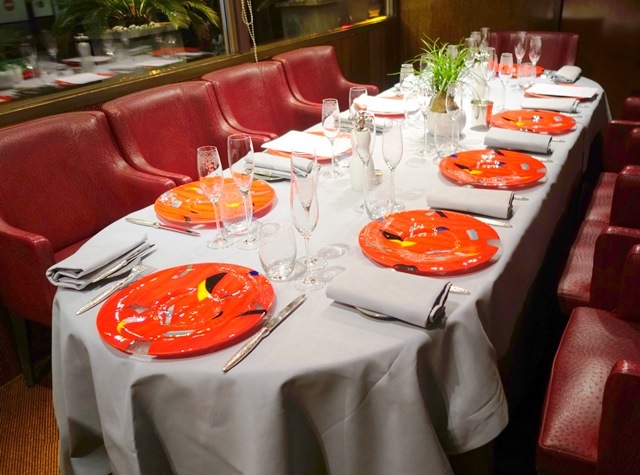 Deliberately I reduce the list that I submit to Jean-Marie Ancher of Taillevent restaurant where dinner will be held in the exquisite Chinese salon. 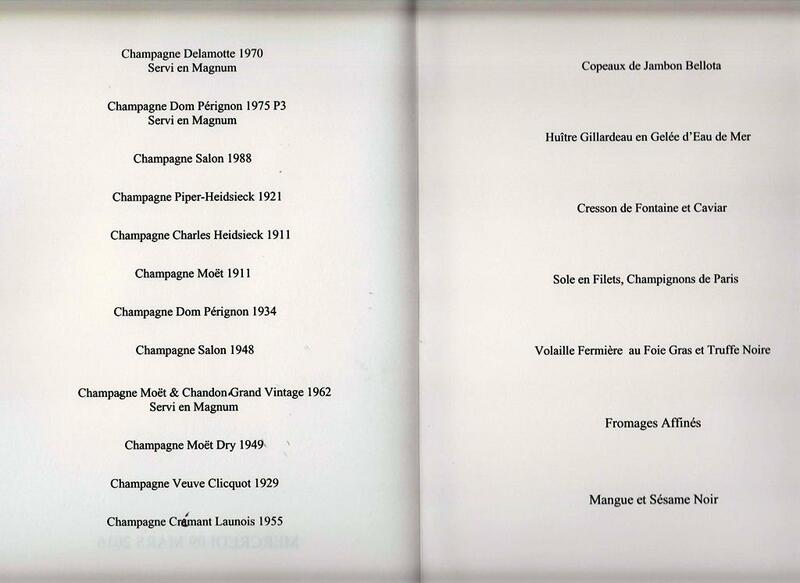 Make a menu for a champagne dinner is not easy thing, and make a consistent service order is not simple. The result will prove convincing. The first three champagnes are quite young (relatively) because we will have an oyster and caviar, who get along better with young champagnes. 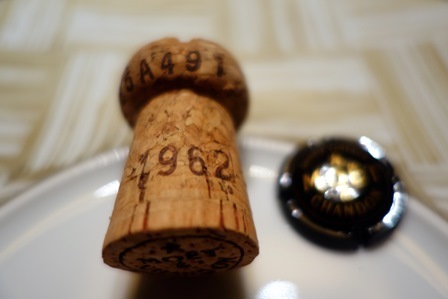 On the sole fish, we have the oldest champagnes. 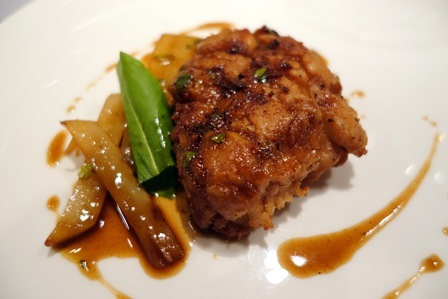 On poultry the two stars that are causing the dinner will be served. And the meal will continue with other additions. 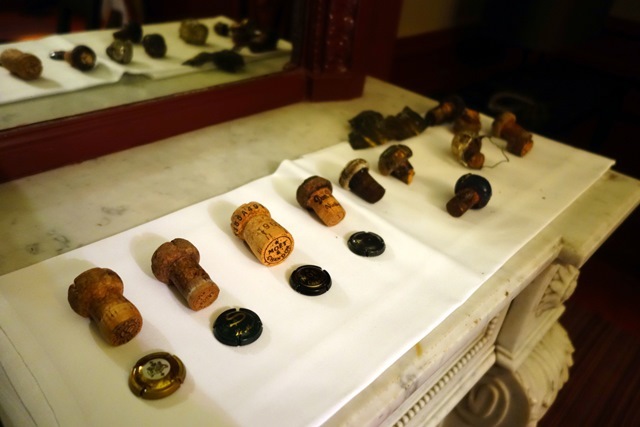 The first three champagnes are opened at 18:30 and the others are opened at the time of service. A student and railway workers strike makes us fear defections, but an angel is watching over this meal. 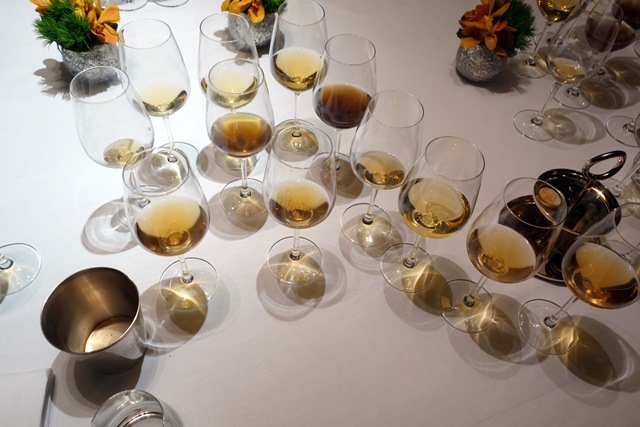 The six are present and all bottles are served at the perfect temperature. 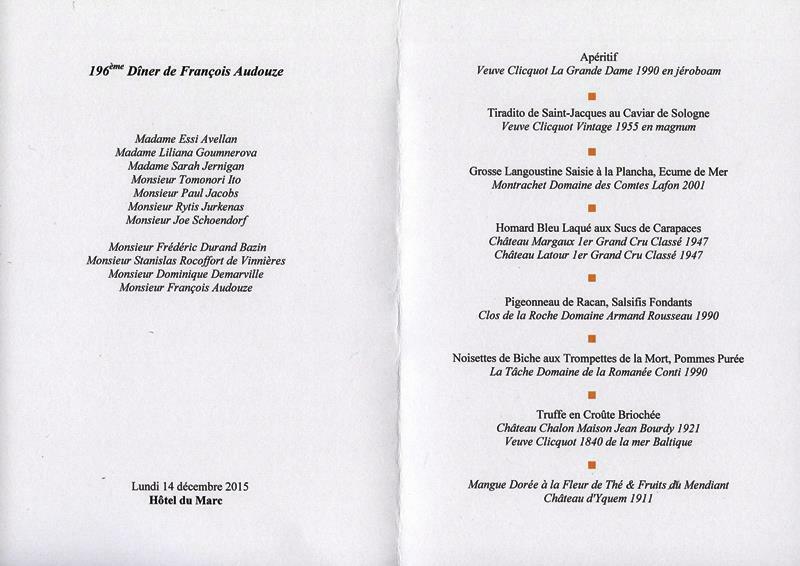 The menu composed by Alain Solivérès and Jean-Marie Ancher is: Bellota ham shavings / appetizers: Gillardeau oyster jelly seawater / watercress cream and caviar / sole fillets, Paris mushrooms / farm poultry liver fat and black truffle / Chaource, Brie de Meaux, Coulommiers / mango and black sesame. 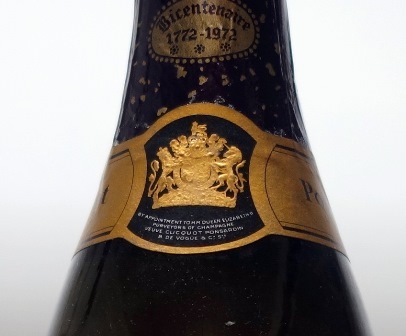 We are already three at 7 pm also cede us the temptation of Champagne Delamotte Magnum Collection 1970. 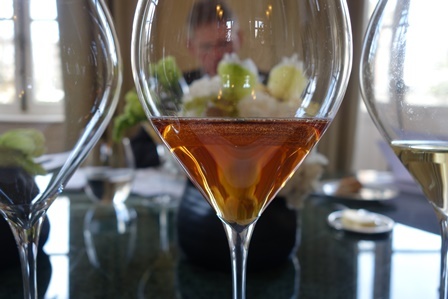 Its color is slightly amber, the nose is discreet but beautiful promise. I love the image of Didier Depond who says this wine evokes the summer corn, crushed by the sun. This wine is made of 50% Chardonnay and 50% Pinot. 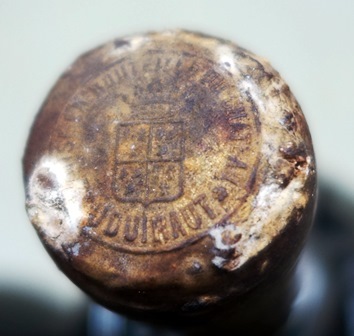 It has already passed the barrier of young wines, shows a nice patina of wine « old ». It is pleasantly fine. 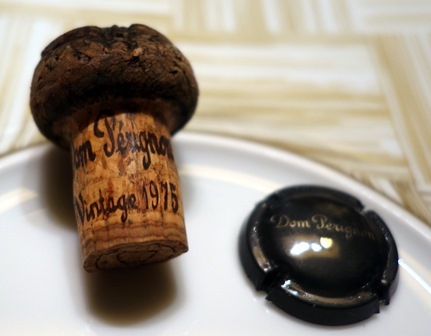 Champagne Dom Perignon magnum P3 1975 has a thunderous nose, so young it smells of sulfur! This toddler forty years is a misspent youth. 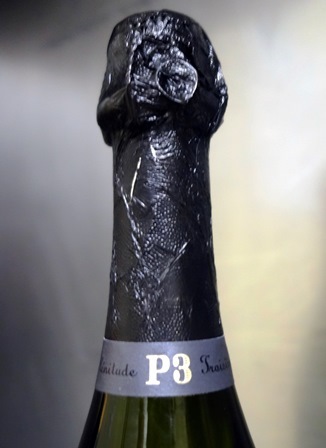 Unlike P3 (code meaning fullness – plénitude) 1982 we drank recently, there is no mark left by the dosage and I found with an infinite pleasure that P3 is able, too, to offer the romantic charm of a Dom Pérignon. We are fully facing a beautiful Dom Perignon. It is charming, a little too dosé but significantly without trace. It’s good. 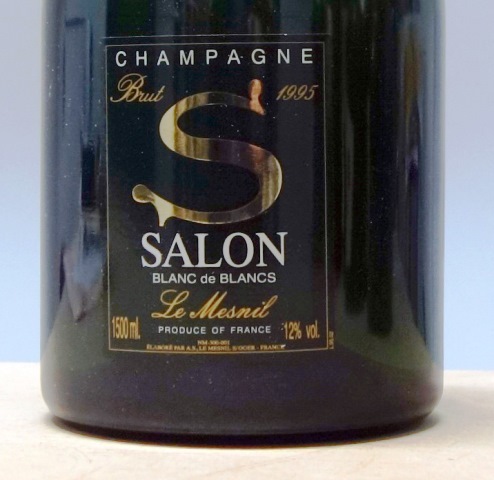 Champagne Salon 1988 offers us largeness, power and precision. It is slightly amber with only traces of sensitive evolution. This wine is a warrior and is located opposite the Dom Perignon. Which is the preferred one? You must love both. This Salon, is part of my memory among the greatest Salon 1988 I’ve drunk, coming directly from the cellar of Salon. 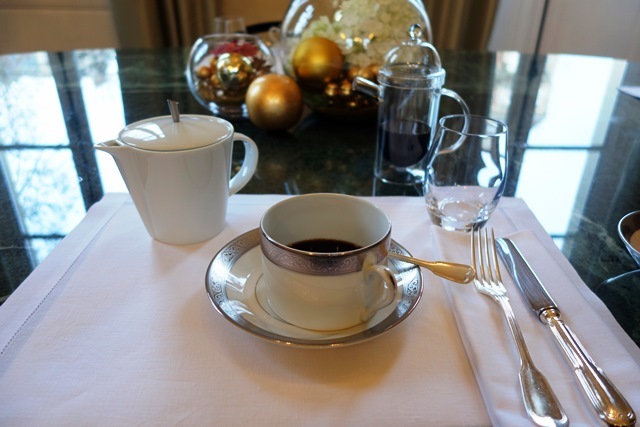 Tastes and preferences differ around table. 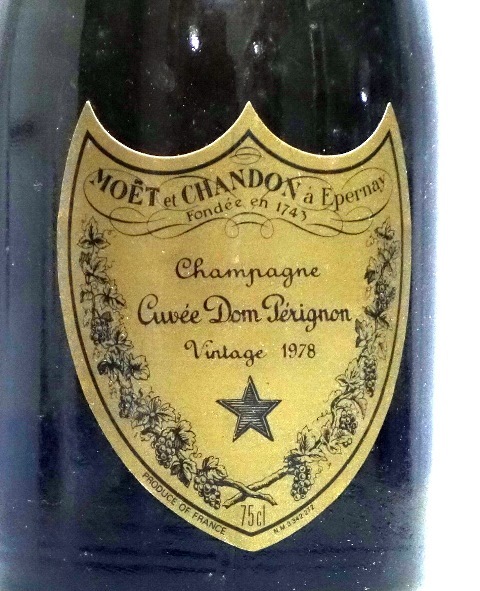 For me the 1988 Salon creates the best vibration with delicious oysters, the jelly creating the link, and it is the Dom Perignon that fits better with Bulgarian high quality caviar. 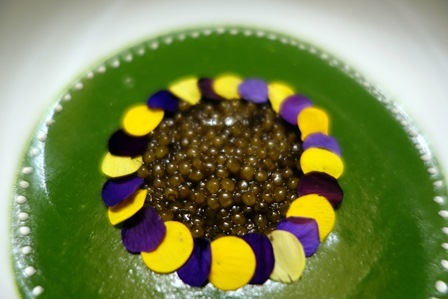 If the watercress cream is delicious, it tends to stifle the caviar if used too much. 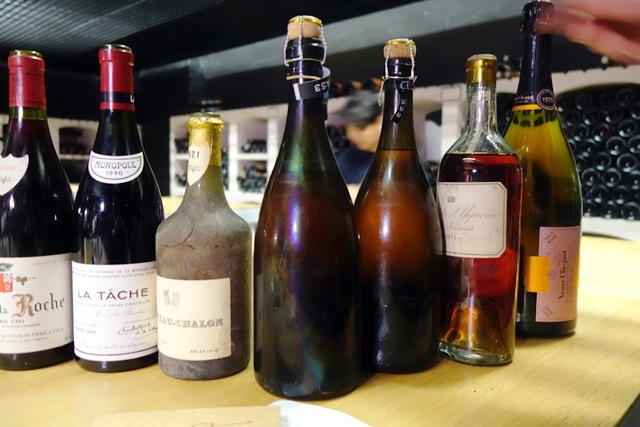 The three oldest wines are served together. 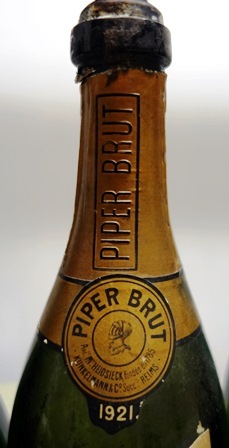 The Piper-Heidsieck Brut Champagne Piper 1921 has a much too dark and earthy color. If we only had it to drink, we would look at her messages that exist. But the program is so heavy that we do not dwell us. 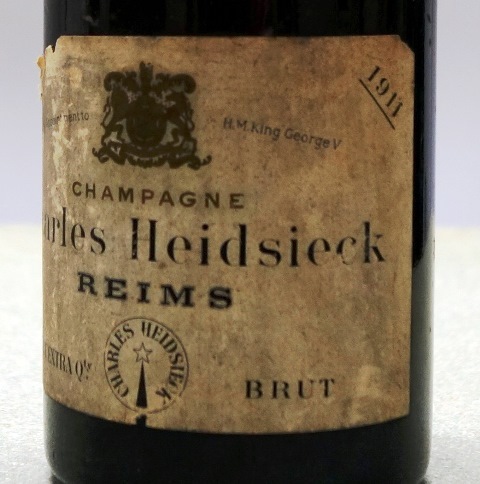 Champagne Charles Heidsieck 1911 also has a dark color but slightly less than that of 1921. And unlike the previous wine, the message is more joyful. I see evocations of very nice citrus. Of course wine is tired but pleasant. 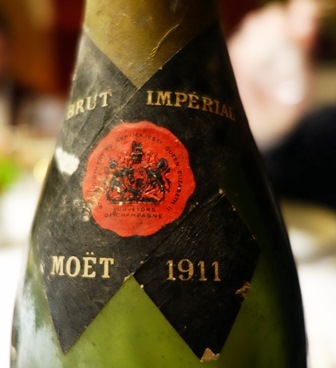 Our smiles broaden as soon as we see the color of Champagne Moët 1911 poured into our glasses. It is as clear as that of a young wine. 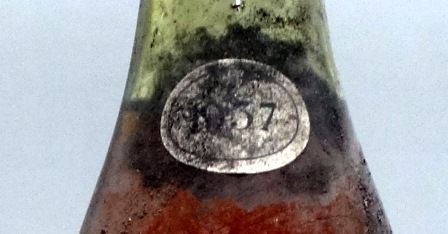 The labeling of the bottle gives the impression of having been made in the 40ies. 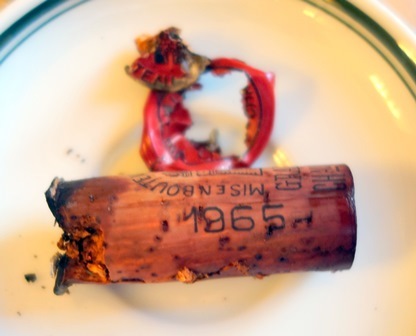 So it would not be an original disgorging unless the dressing was done without changing the cork. The fragrance is beautiful and elegant and the wine is simply divine. It is a marvel of achievement as if all the complexities were assembled by miracle. This is a John Wayne, confident, serene, playing with ease. 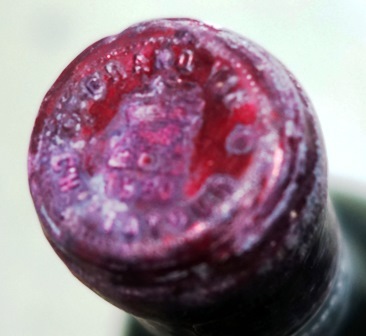 This wine is an obvious miracle, with endless aftertaste. Now come together the two starting points for this dinner. 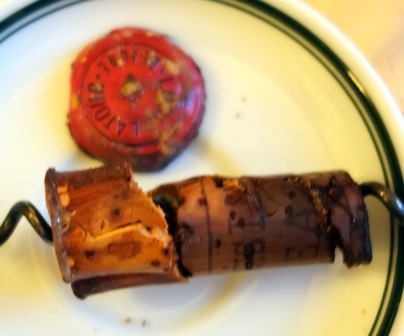 Richard Geoffroy notes that the cloak that covers the cork of a plastic shot, is consistent with this vintage. 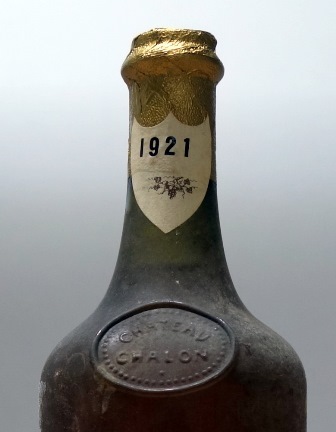 Champagne Dom Perignon 1934 is incredibly young to the point that Peter doubt of its authenticity. 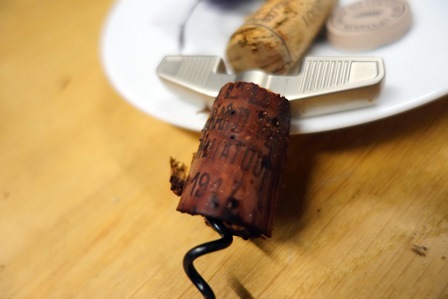 Just show him the cork so that he finds it impossible to have built a fake with such a cork that really ages 80 years. 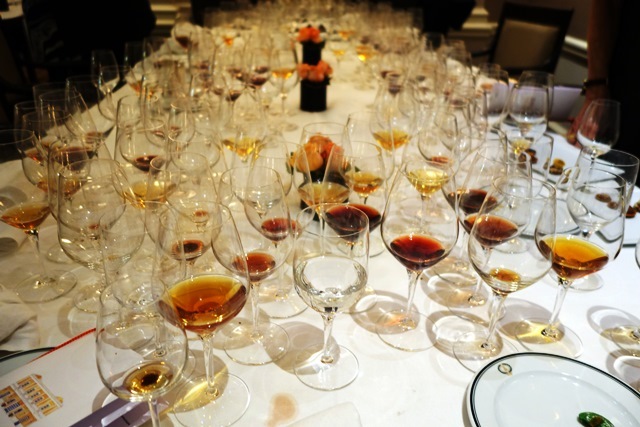 And Richard, humorous said, « it’s curious that when wine is perfect, we say that it is a fake. 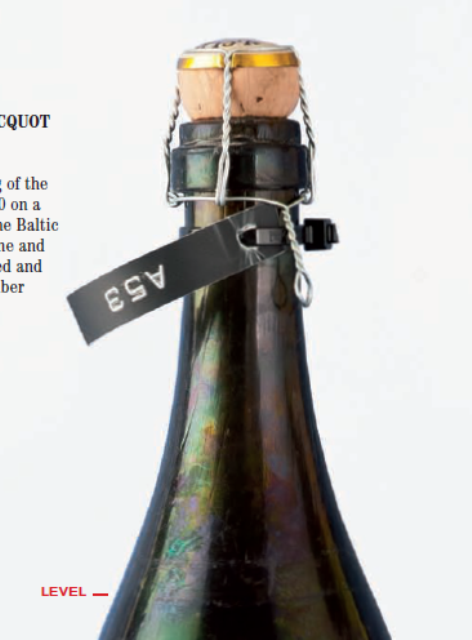 » The Dom Pérignon has it all, charm, complexity and floral or fruity notes that go in all directions. 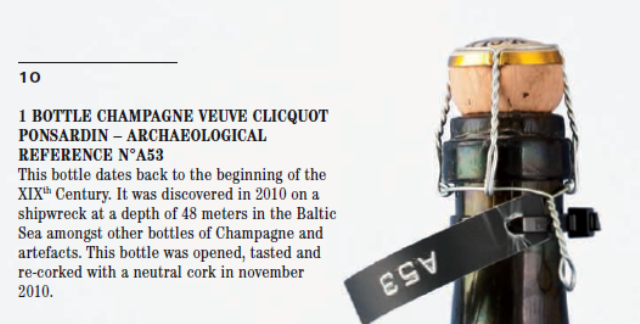 This incredible wine reinforces my preference for champagne with original disgorging, which I find much more holders of emotion than recently disgorged, brighter and different. 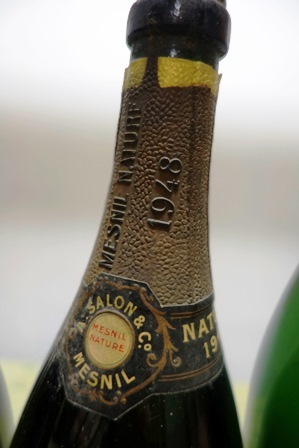 Didier Depond raves at the beauty of the bottle of Champagne Salon 1948. It has no label, but the circular ring around the bottom of the cape gives useful indications. The year is embossed on the cape with golden colors which became gray with time. 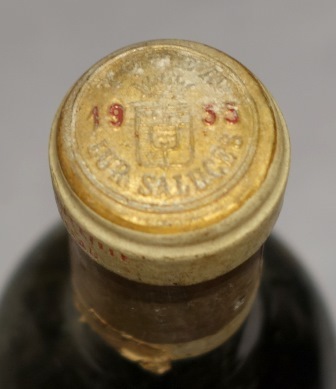 Didier has never seen such a bottle and never drank Salon 1948. And now comes an incredible surprise. The color of the wine is very clear, like the Dom Perignon confirming that Tomo and I made a good purchase. 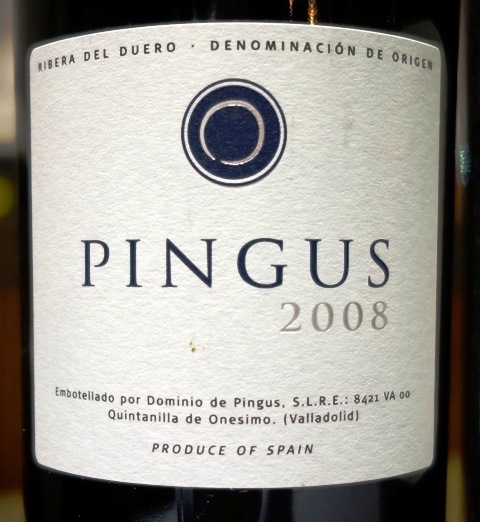 But this wine has incredible tension and strength including alcoholic strength. 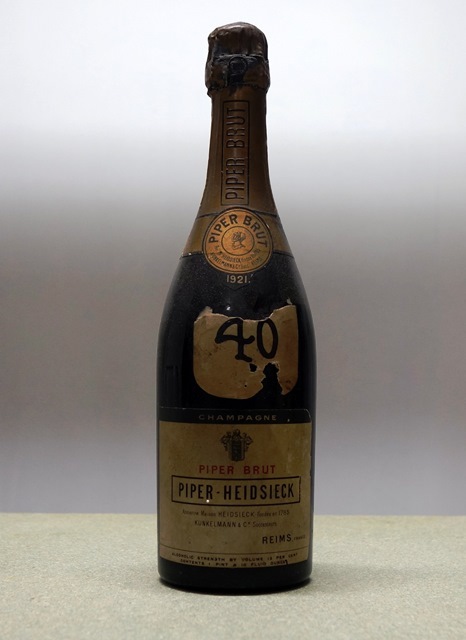 As it is impossible that this bottle is false, Peter can see that despite the age of over 65, retirement age, champagnes can have an exceptional vivacity. But where is the surprise? The surprise is that the 1948 is much more powerful than the 1988 Salon from a warrior year. 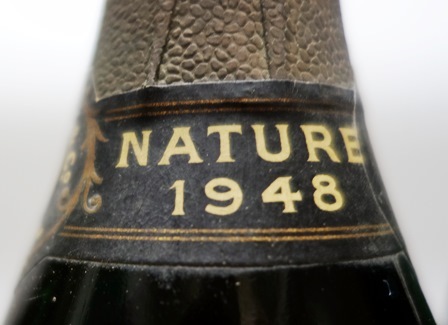 So we are stunned, especially since 1948 did not leave a major mark in the history of champagne. 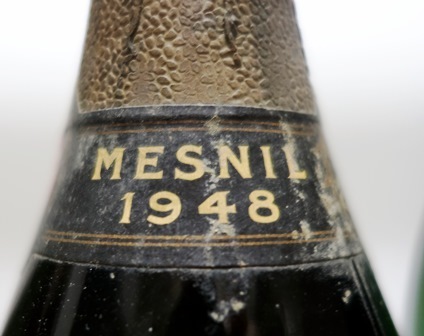 This explains why Salon, which millésimait only exceptional years, chose against all odds to make this dazzling 1948. 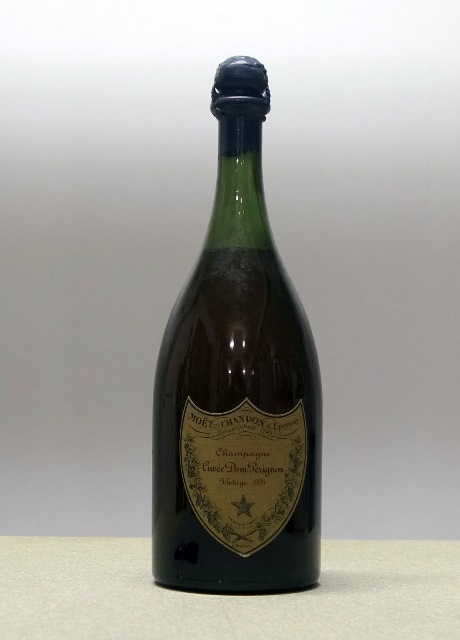 So a nice purchase with a Dom Pérignon 1934 in the charm and complexity and a 1948 Salon in the brilliant strength, wealth and exceptional power. This dinner is blessed by the gods. 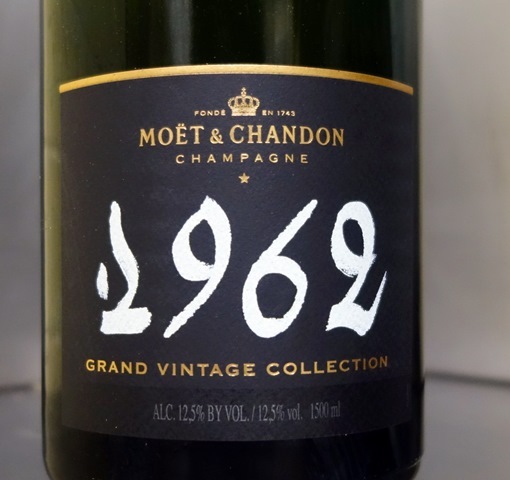 Champagne Moët & Chandon Grand Vintage Collection 1962 magnum, contrary to what I just said above, gives fully justified late disgorging. 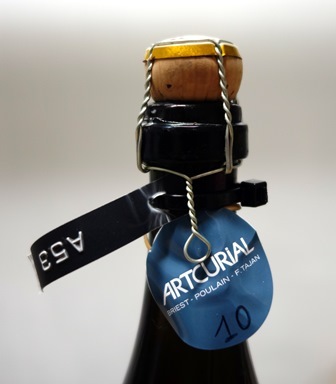 For this disgorged wine there has less than two months of disgorgement has a misspent youth. I’ve always loved this year for Moët that I consider one of the greatest. 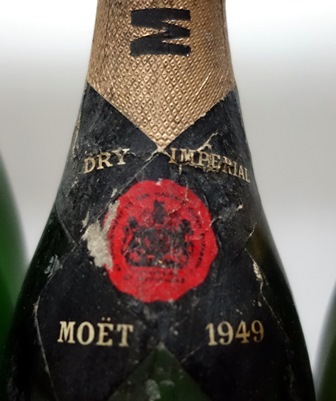 And this bottle directly from the cellars of Moët is the ideal of what Moët can offer: a very drinkable wine, smooth, young, incredibly young and fun. It is even particularly joyful. From now on, we will off-track from the program I had developed with Jean-Marie Ancher, for serving wine added by crazy generosity. 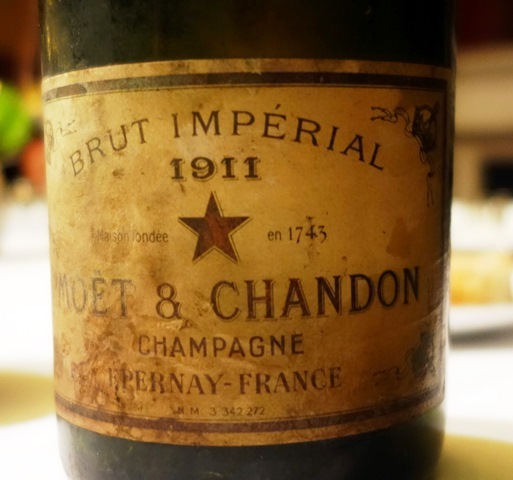 Champagne Moët & Chandon Dry 1949 is a marvel. It is of course very dosé, but it does not feel. This wine is pleasure. He made us feel at what point 1949 is a great year. 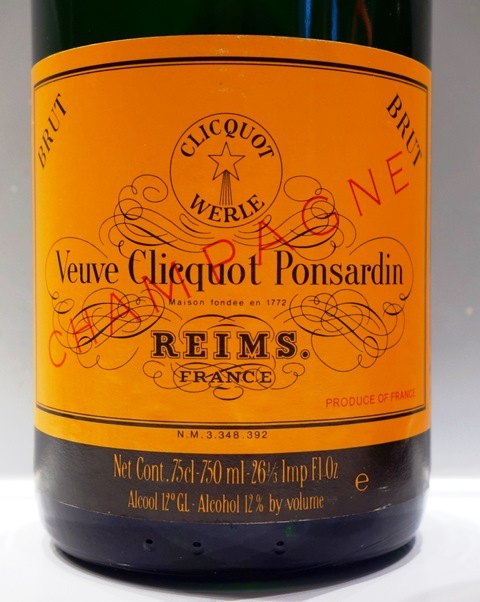 Champagne Veuve Clicquot Ponsardin Brut 1929 is a recent labelling with against-label indicating that the wine was disgorged specially for a designated and named person, but without the date. Particularly felt dosage of this pretty wine very sweet, graceful, which like the previous wine shows and let us feel the nobility of its year. With these two very dosed wines, we are on Olympus of champagne. 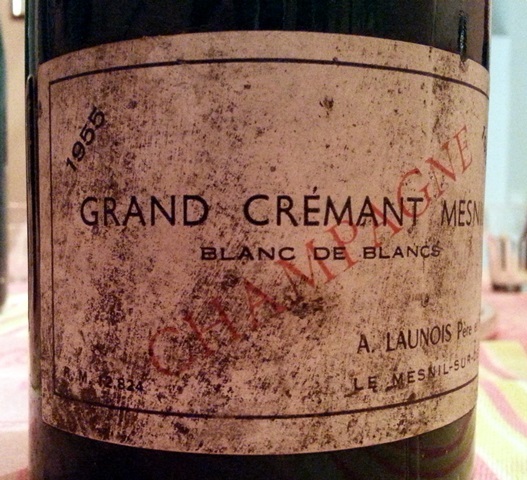 The Grand Mesnil Crémant blanc de blancs A. Launois Père & Fils 1955 has a name that was completely unknown to me. 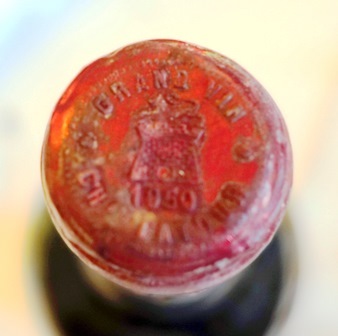 What is a ‘Grand Crémant « ? 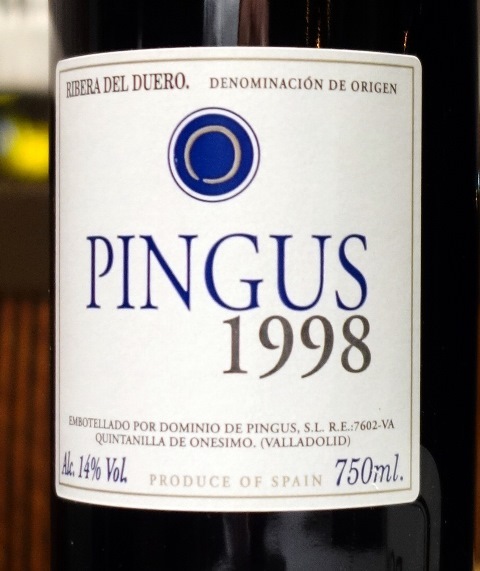 I’m pretty overwhelmed by the incredible liveliness and character of this unusual wine. It is elegant and speaks like a lash. I did not make him the honors it deserves because it is already very late. What of this madness? 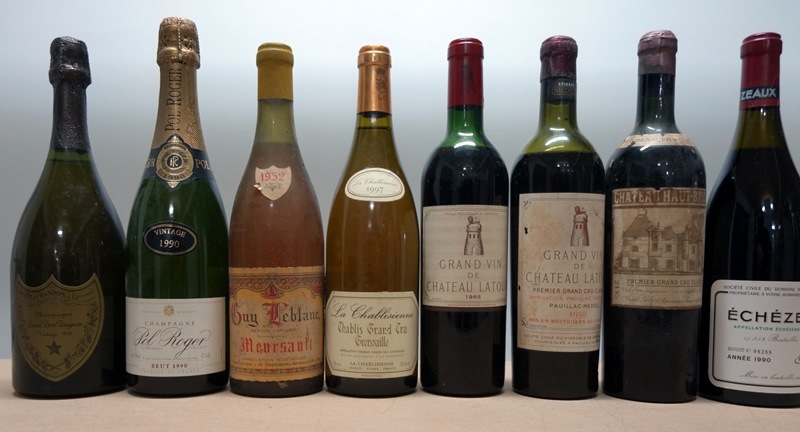 The first point is the outstanding quality of the wines that we shared because apart from the Piper 1921 and the small weakness of Charles Heidsieck 1911 all others are at the top of their game. 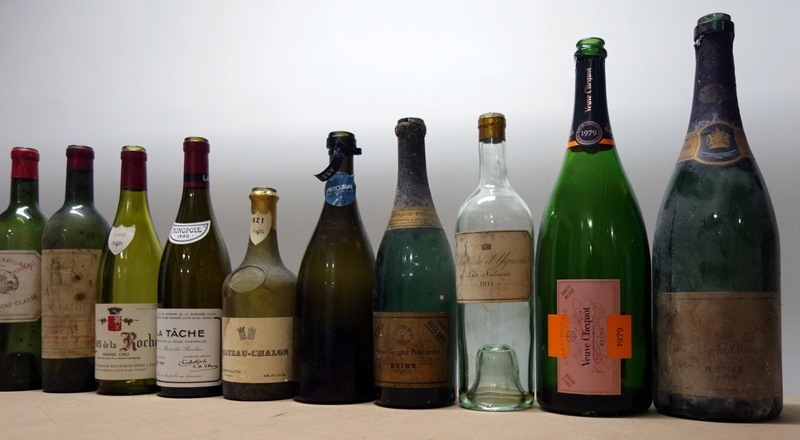 If I had to do a ranking would be: 1 – Moët 1911, 2 – Dom Perignon 1934 tied with Salon 1948, 4 – Moët 1962, 5 – Moët Dry 1949, 6 – Grand Cramant Launois 1955, 7 – Veuve Clicquot 1929. 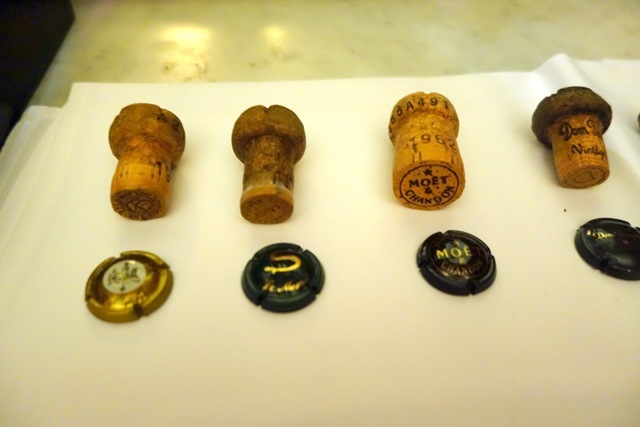 The first four are at the top of the hierarchy of champagnes. 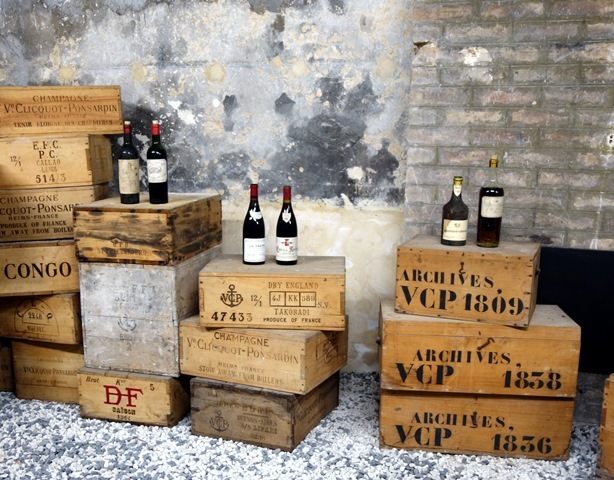 Both winemakers, Didier and Richard, were impressed by the beauty of the bottles and it makes them think about the fact that the current design of the bottles no longer has the same elegance as before. The menu was beautifully adapted. 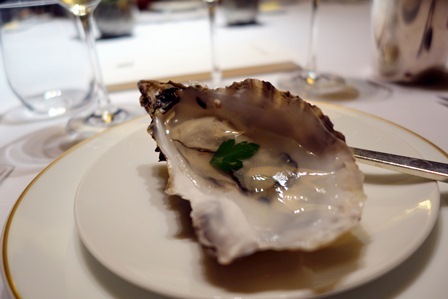 The oyster and caviar were ideal for younger, sole perfect for older. Taillevent’s service is outstanding. 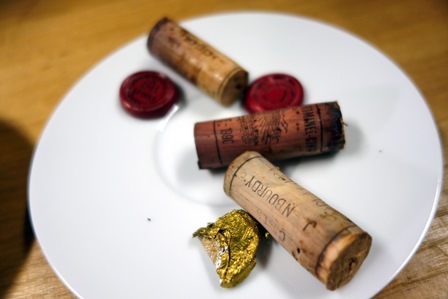 We were accompanied throughout the meal by an impeccable service of wines. 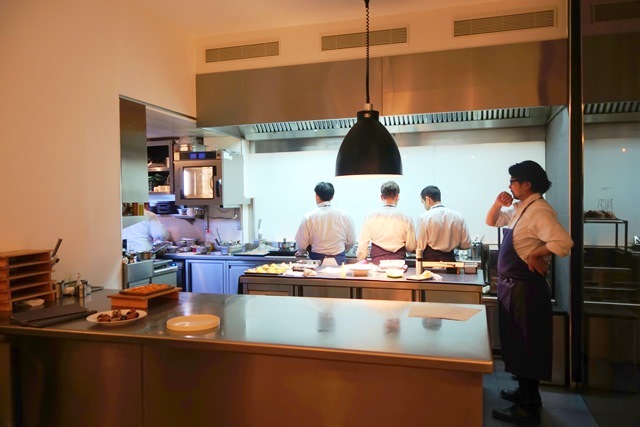 In order to make such complex dinners Taillevent is right and the one. At the end of the meal, we were all under the shock of this rare event, where all champagnes gave what one could expect better. It was the Salon in 1948 that pushed me to realize its purchase with Tomo. 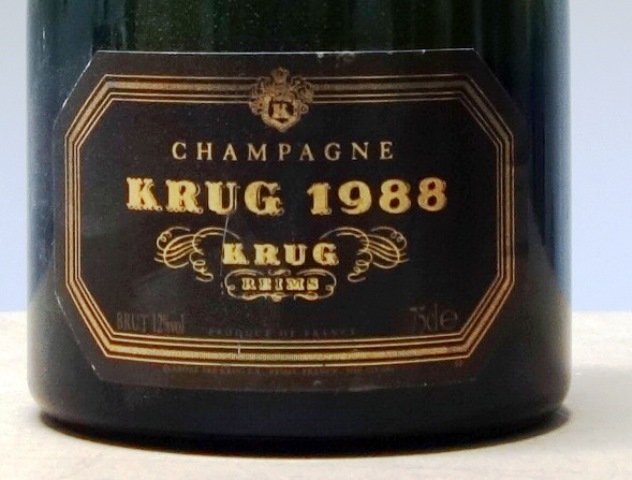 I still have the memory of the incredible energy of this exceptional champagne that will remain forever etched in my memory. Cette entrée a été publiée dans dîners de wine-dinners le 11 mars 2016 par François Audouze. Chaque jour, je reçois une quinzaine de mails qui m’offrent des vins à vendre. Ma passion étant boulimique, je lutte pour acheter le moins possible. Mais ces correspondants connaissent les vins qui vont me tenter. 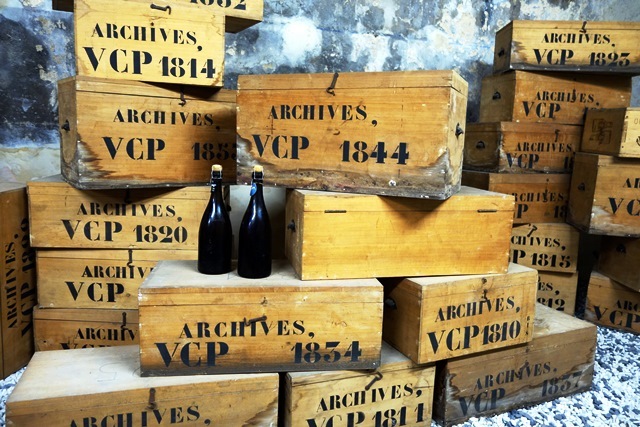 Un mail offre deux vins mythiques : Dom Pérignon 1934 et Salon 1948. 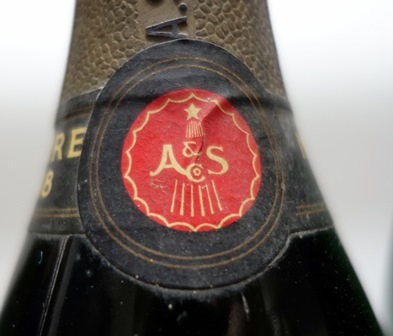 Des Dom Pérignon des années trente, il n’en existe quasiment pas à la vente, et le Salon 1948 est d’une année dont je n’ai jamais vu la moindre offre. Dans le mail, les prix proposés placent ces champagnes au niveau tarifaire des Romanée Conti d’années moyennes. Comme les champagnes très anciens ont un gros facteur d’incertitude, ces prix sont inacceptables pour moi. 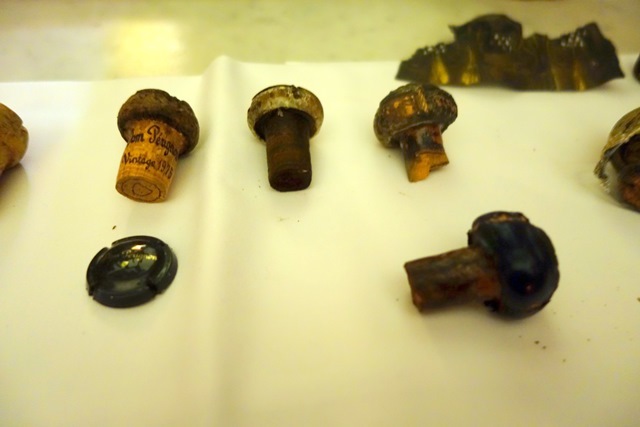 Mais laisser passer ces bouteilles dont les photos sont belles, ce serait une erreur. J’appelle mon ami Tomo et je lui propose que nous achetions ces deux bouteilles ensemble, avec l’idée que nous dînions tous les deux pour les partager. Tomo accepte. 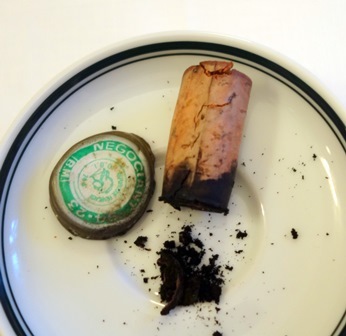 Le temps passe et, nous souvenant du repas avec Les Gaudichots 1929 du Domaine de la Romanée Conti où nous avions convié Aubert de Villaine, l’idée très naturelle est de demander à Richard Geoffroy de Dom Pérignon et à Didier Depond des Champagnes Salon Delamotte de se joindre à nous. Une date est trouvée qui convient à ces deux personnages aux agendas surchargés. 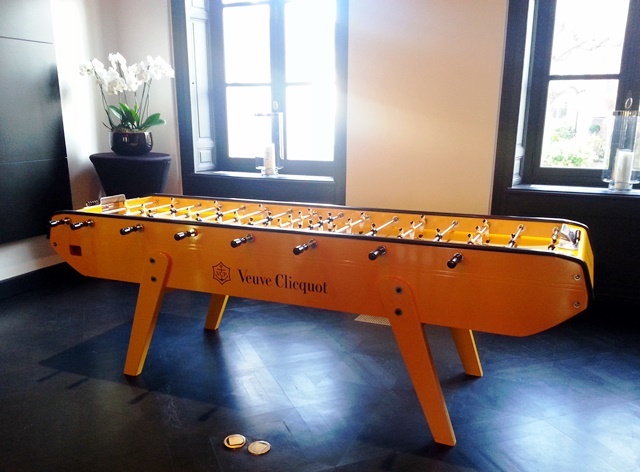 Peter, un ami écossais qui n’avait pas pu venir au 196ème dîner à Veuve Clicquot souhaitait me revoir pour partager de grands champagnes et Florent, un ami lyonnais souhaite aussi partager de grands vins. Notre groupe de six se forme, et comme cela se passe souvent, la générosité tourne à l’excès au point que nous aurons neuf bouteilles plus trois magnums ce qui fait un équivalent de 15 bouteilles pour 6, soit 2,5 bouteilles par convive. C’est tout sauf rationnel, mais comment refuser ? Délibérément je réduis la liste que je soumets à Jean-Marie Ancher du restaurant Taillevent où se tiendra le dîner, dans l’exquis salon chinois. 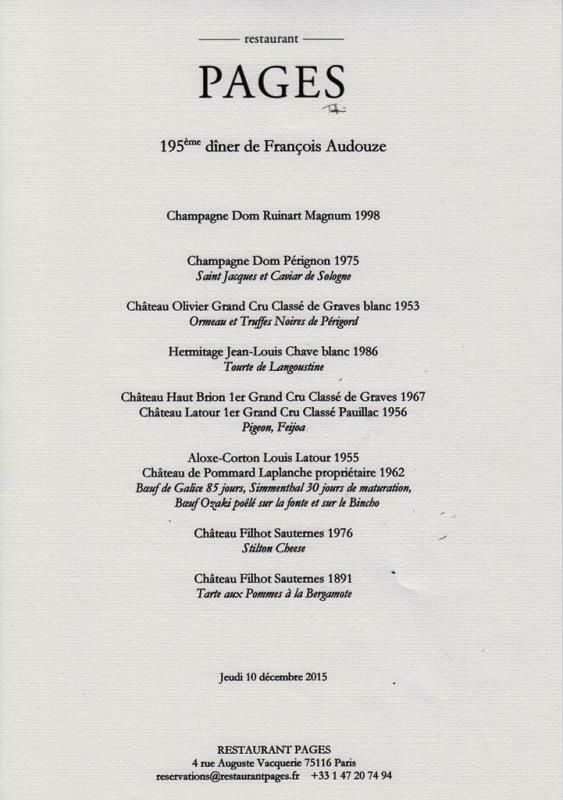 Faire un menu pour un dîner de champagnes est chose peu aisée, et faire un ordre de service cohérent n’est pas simple. Le résultat se montrera probant. Les trois premiers champagnes sont assez jeunes (tout est relatif) car nous aurons une huître et du caviar, qui s’entendent mieux avec des champagnes jeunes. Sur la sole, nous aurons les champagnes les plus vieux. 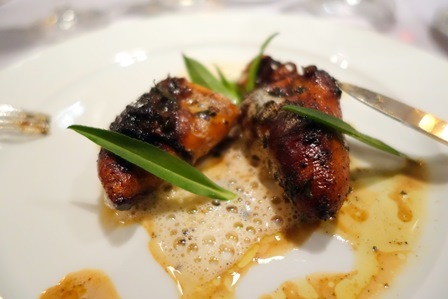 Sur la volaille les deux vedettes qui sont à l’origine du dîner seront servies. Et le repas se continuera avec les autres ajouts. Les trois premiers champagnes sont ouverts à 18h30 et les autres sont ouverts au moment du service. Une grève des étudiants et des cheminots nous fait craindre des défections, mais un ange veille sur ce repas. Les six sont présents et toutes les bouteilles sont servies à la température idéale. 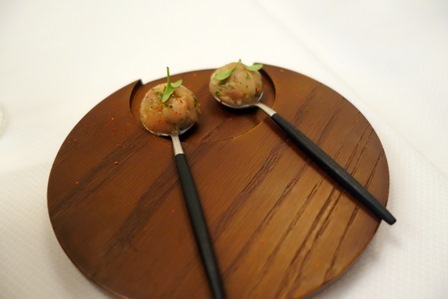 Le menu composé par Alain Solivérès et Jean-Marie Ancher est : copeaux de jambon Bellota / amuse-bouche : huître Gillardeau en gelée d’eau de mer / cresson de fontaine et caviar / sole en filets, champignons de Paris / volaille fermière au foie gras et truffe noire / chaource, Brie de Meaux, Coulommiers / mangue, et sésame noir. 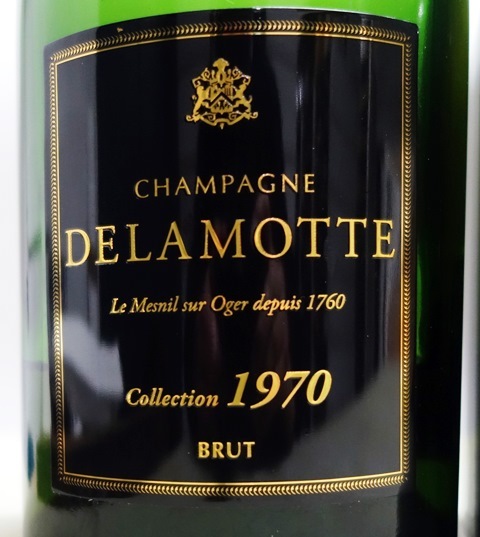 Nous sommes déjà trois à 19 heures aussi cédons-nous à la tentation du Champagne Delamotte Collection magnum 1970. Sa couleur est légèrement ambrée, le nez est discret mais de belle promesse. J’aime beaucoup l’image de Didier Depond qui dit que ce vin évoque les blés d’été, écrasés de soleil. Ce vin est fait de 50% chardonnay et 50% de pinot. 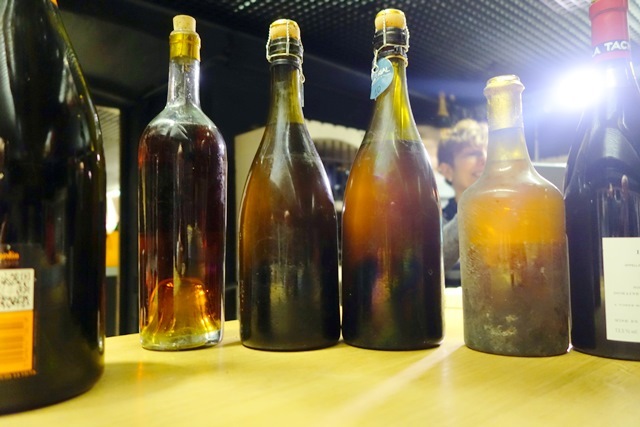 Il a déjà passé la barrière des vins jeunes pour montrer une belle patine de vin « ancien ». Il est agréablement gastronomique. 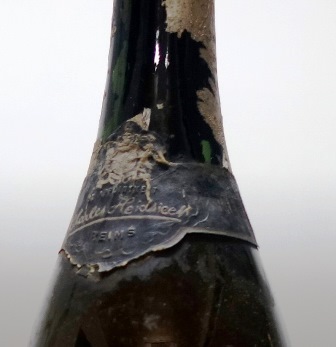 Le Champagne Dom Pérignon P3 magnum 1975 a un nez tonitruant, tellement jeune qu’il sent le soufre ! Ce bambin de quarante ans est d’une jeunesse folle. Contrairement au P3 (qui signifie troisième plénitude) 1982 que nous avons bu récemment, il n’y a aucune marque laissée par le dosage et je retrouve avec un infini plaisir qu’un P3 sait, lui aussi, avoir le charme romantique d’un Dom Pérignon. Nous sommes pleinement face à un beau Dom Pérignon. Il est charmeur, un peu dosé mais pas trop et surtout sans trace. On est bien. 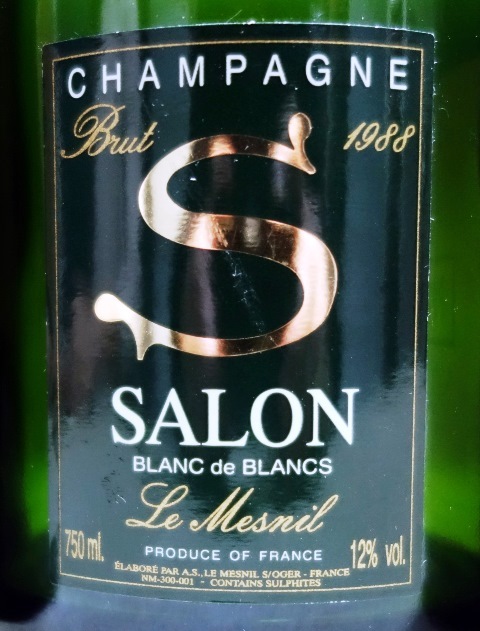 Le Champagne Salon 1988 nous offre ampleur, puissance et précision. Il est légèrement ambré avec des traces à peine sensibles d’évolution. Ce vin est un guerrier et se situe à l’opposé du Dom Pérignon. Le quel préférer ? Il faut aimer les deux. Ce Salon se place dans ma mémoire parmi les plus grands Salon 1988 que j’aie bus, venant directement de la cave de Salon. Les goûts et préférences divergent autour de table. 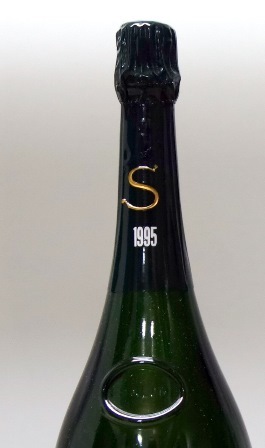 Pour moi le Salon 1988 crée la meilleure vibration avec l’huître délicieuse, dont la gelée crée le trait d’union, et c’est le Dom Pérignon qui s’accorde mieux au caviar bulgare de très grande qualité. Si la crème de cresson est délicieuse, elle a tendance à étouffer le caviar si l’on en prend trop. 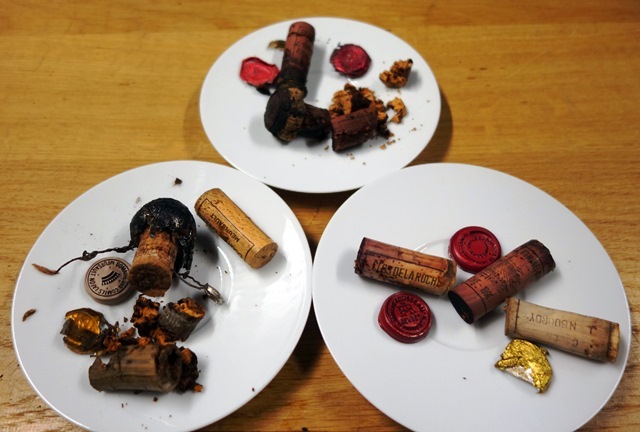 Les trois vins anciens sont servis ensemble. 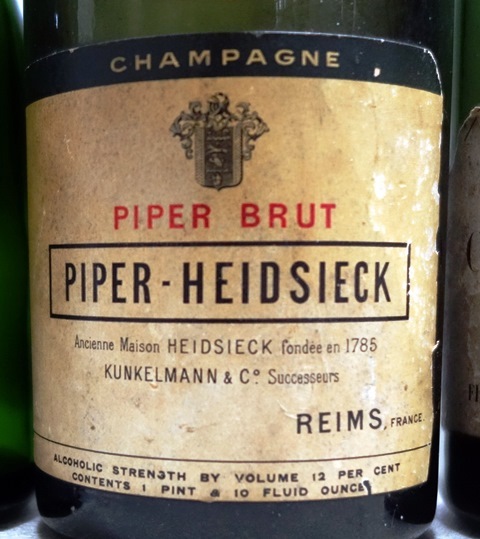 Le Champagne Piper-Heidsieck Piper Brut 1921a une couleur beaucoup trop foncée et terreuse. Si nous n’avions que lui à boire, nous nous pencherions sur ses messages, qui existent. Mais le programme est si chargé que nous ne nous attardons pas. 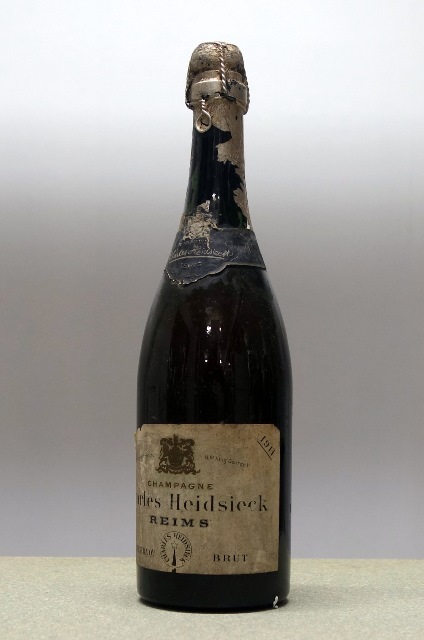 Le Champagne Charles Heidsieck 1911 a lui aussi une couleur foncée mais un peu moins que celle du 1921. Et contrairement au vin précédent, le message est plus joyeux. Je vois des évocations d’agrumes fort sympathiques. Bien sûr le vin est fatigué, mais plaisant. 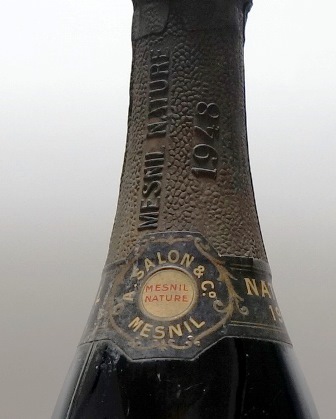 Nos sourires s’élargissent dès que nous voyons la couleur du Champagne Moët 1911 versé dans nos verres. Elle est claire comme celle d’un vin jeune. L’habillage de la bouteille nous donne l’impression d’avoir été réalisé dans les années 40. Il ne s’agirait donc pas d’un dégorgement d’origine, sauf si l’habillage s’était fait sans rebouchage. Le parfum est superbe et élégant et le vin est tout simplement divin. C’est une merveille d’accomplissement comme si toutes les complexités étaient assemblées par miracle. C’est un John Wayne, sûr de lui, serein, qui joue avec facilité. Ce vin est comme une évidence, à la persistance aromatique infinie. Arrivent maintenant ensemble les deux points de départ de ce dîner. Richard Geoffroy nous signale que la cape qui recouvre le bouchon d’un plastique tiré, est cohérente avec ce millésime. 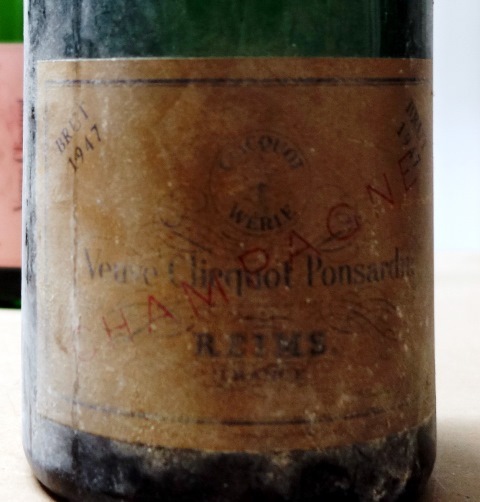 Le Champagne Dom Pérignon 1934 est d’une jeunesse incroyable au point que Peter doute de son authenticité. Il suffit de lui montrer le bouchon pour qu’il constate qu’il est impossible d’avoir construit un faux avec un tel bouchon qui a vraiment 80 ans. Et Richard, plein d’humour dit : « c’est curieux que lorsqu’un vin est parfait, on dise qu’il s’agit d’un faux ». 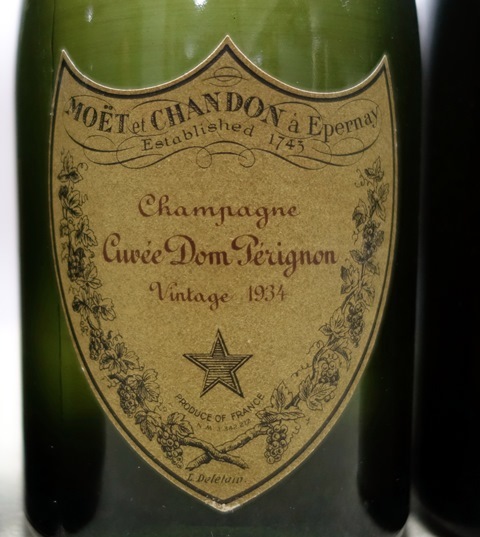 Ce Dom Pérignon a tout pour lui, le charme, la complexité et des notes florales ou fruitées qui partent dans toutes les directions. 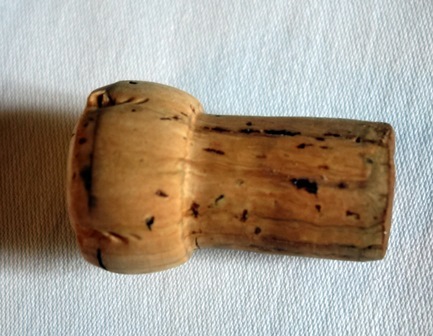 Ce vin incroyable me conforte dans ma préférence pour les champagnes au dégorgement d’origine, que je trouve beaucoup plus porteurs d’émotion que les récemment dégorgés, plus vifs et différents. Didier Depond s’extasie devant la beauté de la bouteille de Champagne Salon 1948. 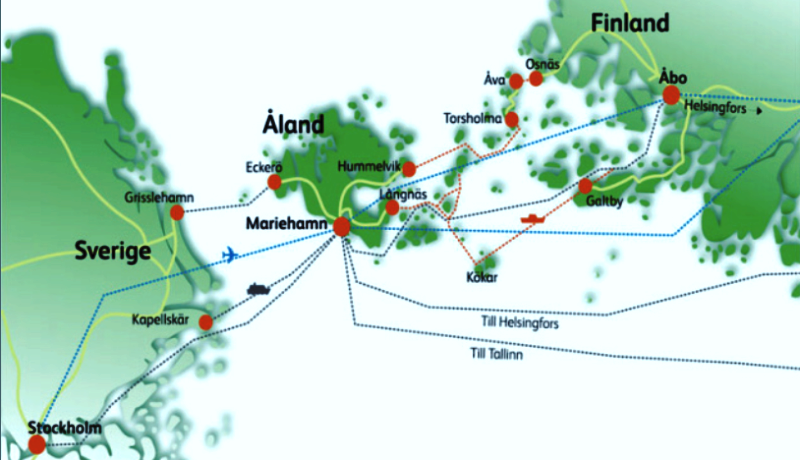 Elle n’a pas d’étiquette, mais la couronne circulaire autour du bas de la cape donne les indications utiles. L’année est embossée dans la cape aux couleurs d’or devenu gris avec le temps. Didier n’a jamais vu une telle bouteille et n’a jamais bu de Salon 1948. Et maintenant arrive une surprise inouïe. La couleur du vin est très claire, comme celle du Dom Pérignon ce qui confirme que Tomo et moi avons fait un bel achat. Mais ce vin est incroyable de tension et de force y compris alcoolique. 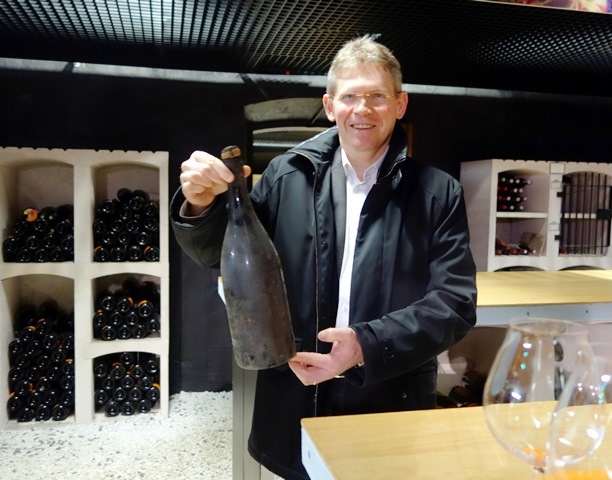 Comme il est impossible que cette bouteille soit fausse, Peter voit bien que malgré l’âge de plus de 65 ans, âge de la retraite, des champagnes peuvent avoir une vivacité exceptionnelle. Mais où est la surprise ? La surprise est que ce 1948 est beaucoup plus puissant que le Salon 1988 qui est pourtant d’une année guerrière. 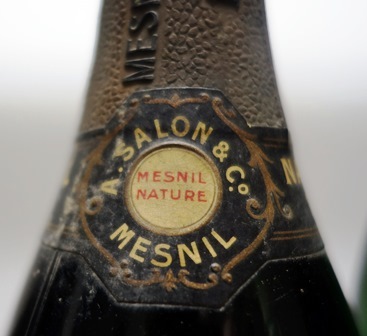 Alors, nous sommes médusés, d’autant plus que l’année 1948 n’a pas laissé une trace majeure dans l’histoire du champagne. On comprend alors pourquoi Salon, qui ne millésimait que les années exceptionnelles, ait choisi contre toute attente de faire ce 1948 éblouissant. 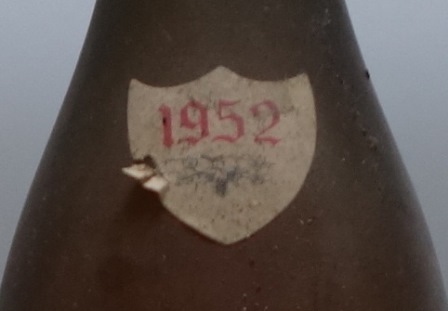 Voilà donc un bel achat avec un Dom Pérignon 1934 dans le charme et la complexité et un Salon 1948 dans la force brillante, la richesse et une tension exceptionnelle. Ce dîner est béni des dieux. 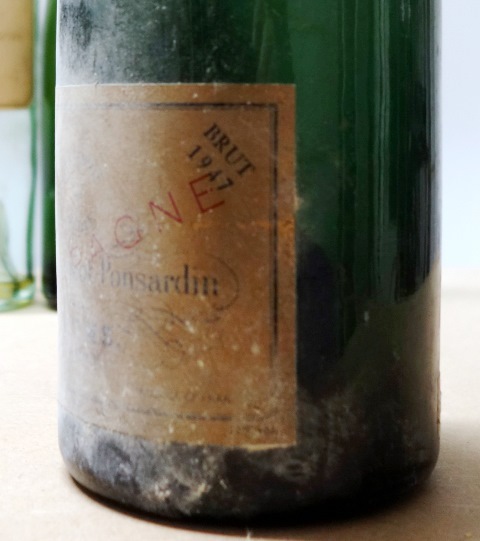 Le Champagne Moët & Chandon Grand Vintage Collection magnum 1962, contrairement à ce que je viens de déclarer ci-dessus, donne sa pleine justification aux dégorgements tardifs. Car ce vin dégorgé il y a moins de deux mois est d’une jeunesse folle. J’ai toujours adoré ce millésime que je considère comme un des plus grands. 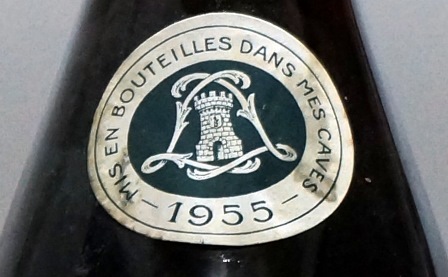 Et cette bouteille venant directement de la cave de Moët est l’idéal de ce que peut offrir Moët : un vin gouleyant, fluide, jeune, incroyablement jeune et de plaisir. Il est même particulièrement joyeux. A partir de maintenant, nous allons faire du hors-piste par rapport au programme que j’avais mis au point avec Jean-Marie Ancher, car sont servis des vins ajoutés par les folles générosités. 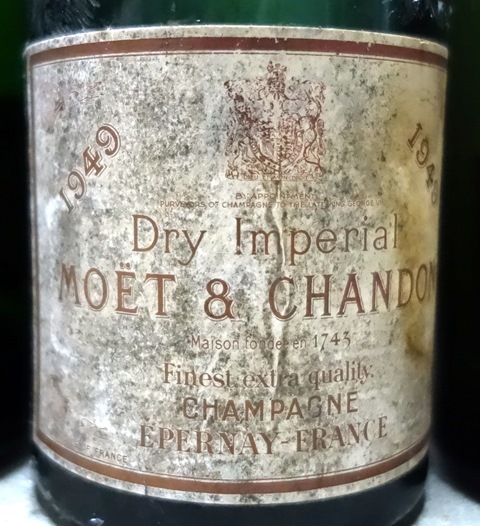 Le Champagne Moët & Chandon Dry 1949 est une merveille. Il est bien sûr très dosé, mais ça ne se sent pas. Au contraire on est bien. Il nous fait sentir à quel point 1949 est une grande année. 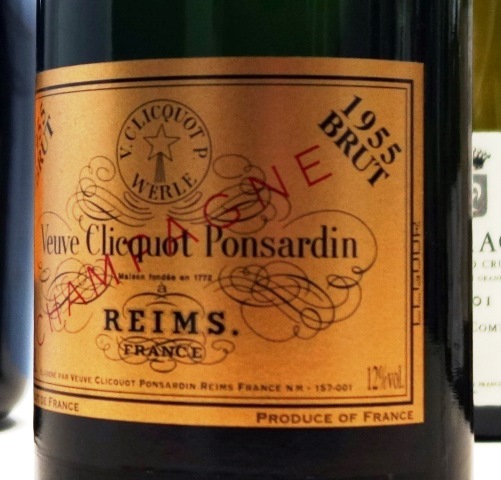 Le Champagne Veuve Clicquot Ponsardin Brut 1929 est d’un habillage récent avec une contre-étiquette qui indique que le vin a été spécialement dégorgé pour une personne désignée et nommée, mais sans indication de date. On sent particulièrement le dosage de ce joli vin très doux, gracieux, qui comme le vin précédent fait sentir la noblesse de son année. Avec ces deux vins très dosés, nous sommes sur l’Olympe du champagne. 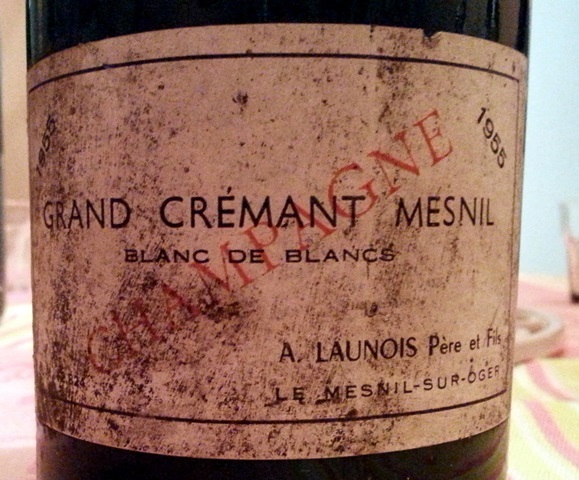 Le Grand Crémant Mesnil blanc de blancs A. Launois Père & Fils 1955 a un nom qui m’était totalement inconnu. 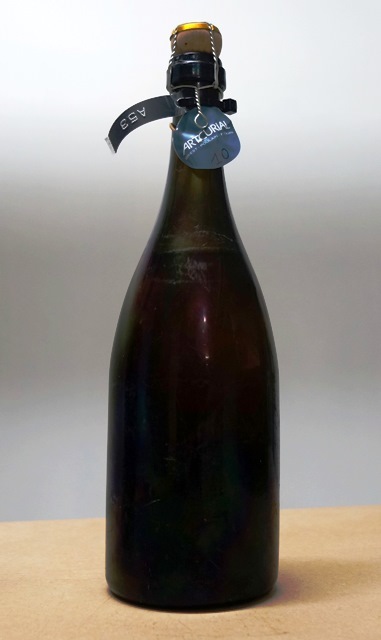 Qu’est-ce qu’un « Grand Crémant » ? Je suis assez subjugué par la vivacité et l’incroyable caractère de vin inhabituel. Il est racé et s’exprime comme un coup de fouet. On ne lui rendra pas les honneurs qu’il mérite car il est déjà bien tard. Que dire de cette folie ? 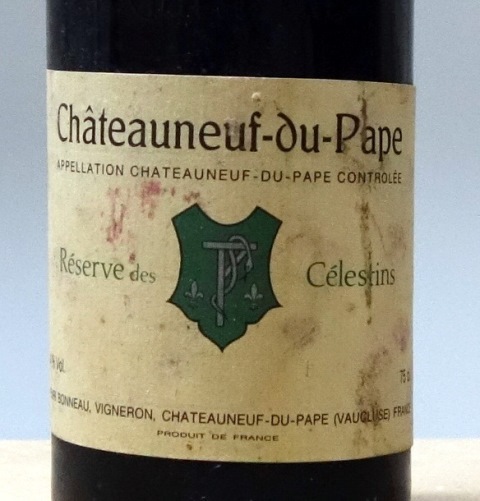 La première remarque est la qualité exceptionnelle des vins que nous avons partagés car à part le Piper 1921 et la petite faiblesse du Charles Heidsieck 1911 tous les autres sont au sommet de leur art. 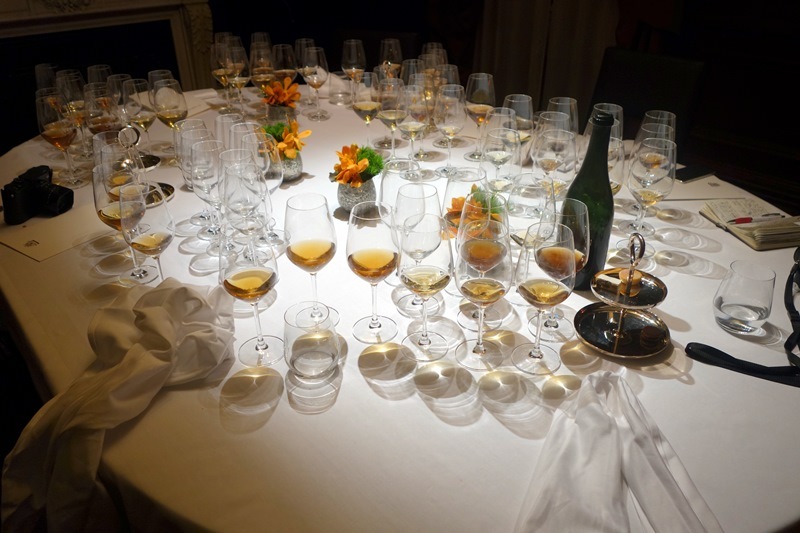 Si je devais faire un classement ce serait : 1 – Moët 1911, 2 – Dom Pérignon 1934 ex-aequo avec Salon 1948, 4 – Moët 1962, 5 – Moët Dry 1949, 6 – Grand Cramant Launois 1955, 7 – Veuve Clicquot 1929. Les quatre premiers sont au sommet de la hiérarchie des champagnes. 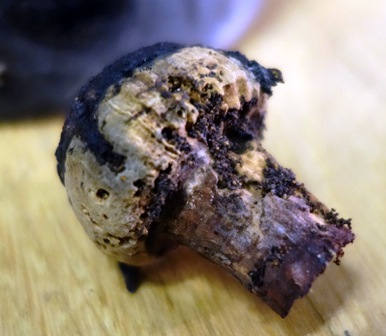 Les deux vignerons, Didier et Richard, ont été impressionnés par la beauté des bouteilles et cela les fait réfléchir sur le fait que le design actuel des bouteilles n’a plus la même élégance. Le menu a été superbement adapté. L’huître et le caviar étaient idéaux pour les plus jeunes, la sole parfaite pour les plus vieux. 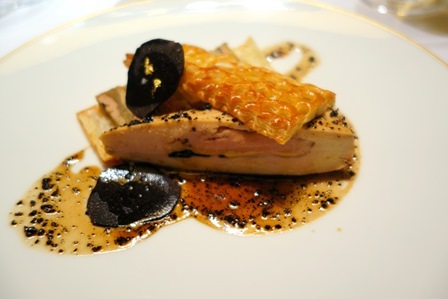 Le service du Taillevent est exceptionnel. Nous avons été accompagnés tout au long du repas par un service des vins irréprochable. Pour faire des dîners aussi complexes, c’est Taillevent qui s’impose. 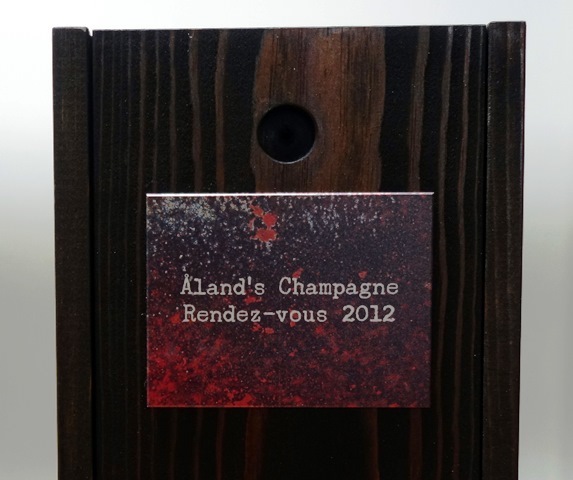 A la fin du repas, nous étions tous sous le coup de cet événement rare, où tous les champagnes ont donné ce que l’on pouvait espérer de meilleur. 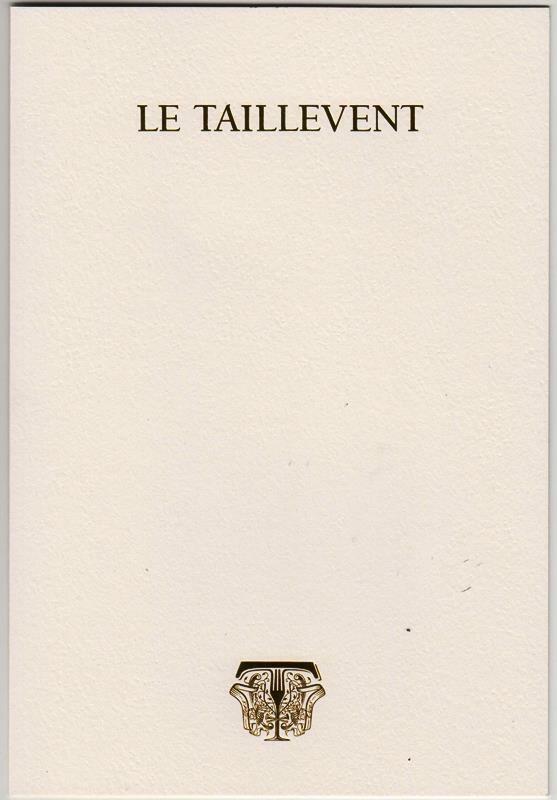 C’était le Salon 1948 qui m’avait poussé à réaliser son achat avec Tomo. J’ai encore en mémoire l’incroyable énergie de ce champagne exceptionnel, qui restera à jamais gravée dans ma mémoire. Ce dîner approche. Voici sa présentation faite en anglais. Il y a déjà des inscrits. Me contacter pour plus de renseignements. La date sera fixée en fonction des réponses de possibilités des inscrits. 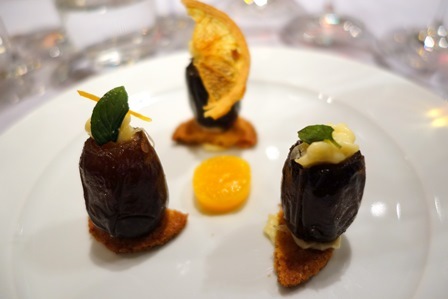 Cette entrée a été publiée dans dîners de wine-dinners le 13 février 2016 par François Audouze. 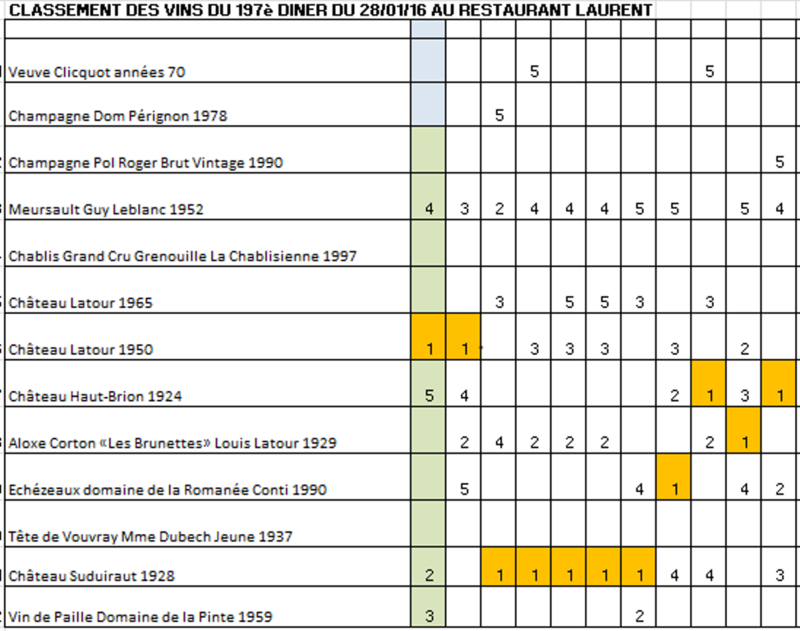 Le 197ème dîner de wine-dinners se tient au restaurant Laurent. Philippe Bourguignon, l’emblématique directeur et Patrick Lair chef sommelier sont partis ensemble à la retraite au 1er janvier de cette année. J’ai choisi de faire ce dîner en cette maison que j’apprécie, pour faire un petit clin d’œil à ces deux personnes attachantes que je n’ai pas eu l’occasion de saluer et de remercier au moment de leur départ. Nous serons onze dont quatre femmes, avec neuf habitués et deux nouveaux. Les horizons sont variés, dont avocats, informaticien, ingénieur, médecin, sénatrice, restauratrice et architecte. Je me présente au restaurant vers 16h30 pour ouvrir les vins. Daniel, le fidèle sommelier m’apporte les vins qui étaient en cave du restaurant depuis une semaine. 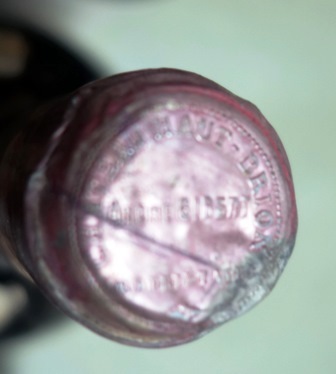 Le bouchon du Haut-Brion 1924 colle au verre et le tirebouchon ne retire que des miettes. Il faut s’y reprendre à plusieurs fois pour qu’il sorte et je constate que si le bouchon s’est émietté, c’est parce que le cylindre intérieur du goulot est étranglé en un endroit, interdisant que l’on lève le bouchon sans le déchirer. Il faut dire que la bouteille au cul très profond me semble beaucoup plus ancienne que 1924. 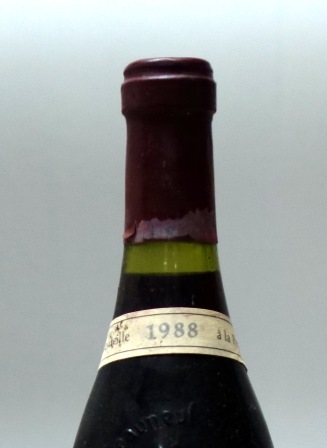 L’odeur qui m’inquiète le plus est celle de l’Echézeaux Domaine de la Romanée Conti 1990. Il y a de la cire sèche dans cette odeur qui n’est pas une odeur de bouchon. Le Suduiraut 1928 exhale un parfum encore serré dont je pense qu’il va s’élargir. 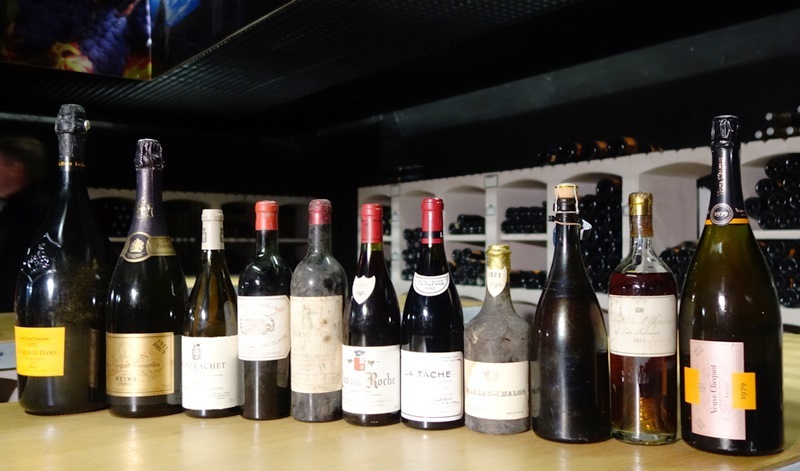 Un des plus fidèles membres de l’académie des vins anciens rêvait de venir à l’un de mes dîners. C’est chose faite ce soir. 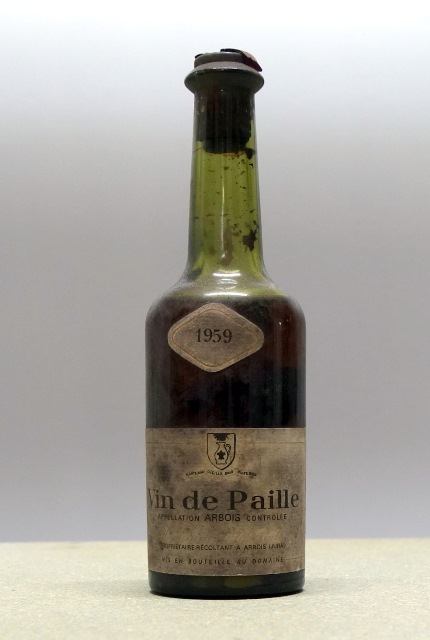 Il avait souhaité arriver très en avance pour que nous goûtions sa « madeleine de Proust », le vin qui lui a fait découvrir et aimer les vins anciens. 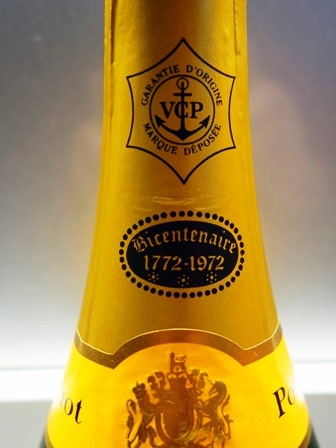 Il découvre un Champagne Veuve Clicquot Brut sans année à l’étiquette orange, dont la cape est marquée de l’inscription : « bicentenaire 1772-1972 » exactement comme le Veuve-Clicquot 1973 que j’ai bu tout récemment qui comporte la même mention, mais sur un fond de ciel étoilé. 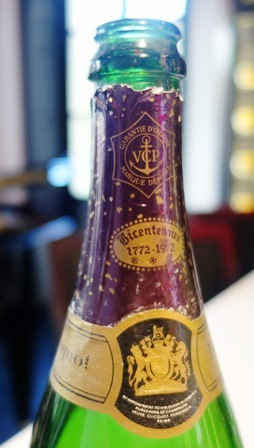 Daniel ouvre le champagne et nous goûtons un merveilleux champagne ancien, certainement des années 70, avec une patine joyeuse de beau vin ancien. Ce vin est un régal. Nous décidons que les premiers arrivants du dîner auront le plaisir d’en goûter un peu. 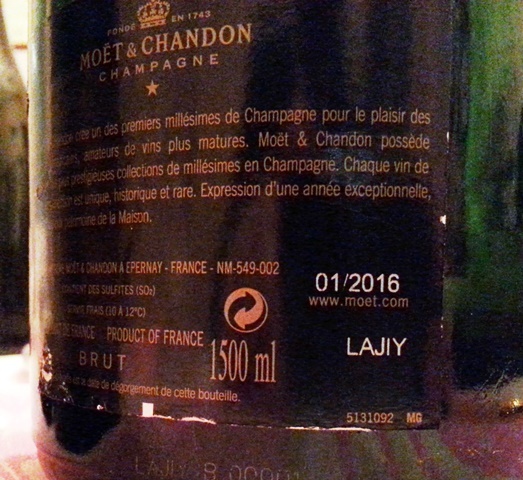 Ce champagne évolué aux notes légèrement fumées allant vers le thé et les fruits bruns est noble. Il me plait autant que le 1973 bu il y a peu de jours. 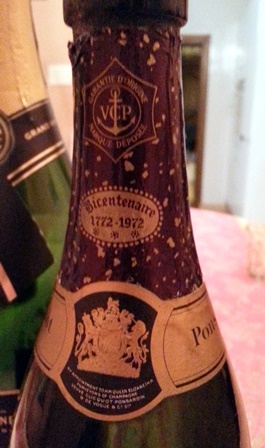 L’apéritif se prend avec le Champagne Dom Pérignon 1978. 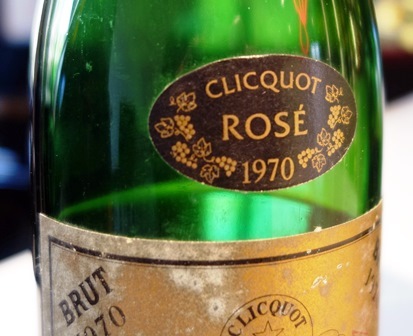 Je suis très favorablement impressionné par ce champagne qui joue dans la cour des grands. 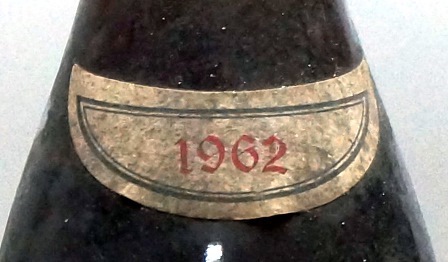 Un ami le situe plus dans la lignée des sublimes Dom Pérignon des années 60. Je trouve qu’il n’a rien à envier aux Dom Pérignon d’années plus célèbres. C’est un grand champagne follement romantique, jouant sur sa grâce féminine. 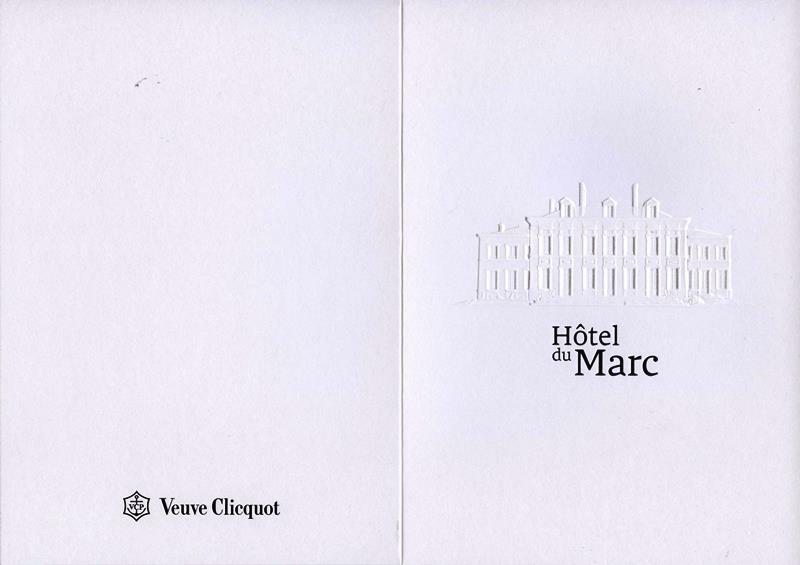 Alors qu’on le sent contemporain du Veuve Clicquot de mon ami, le Dom Pérignon est dans un romantisme gracile quand le Veuve Clicquot est pénétrant et fort. 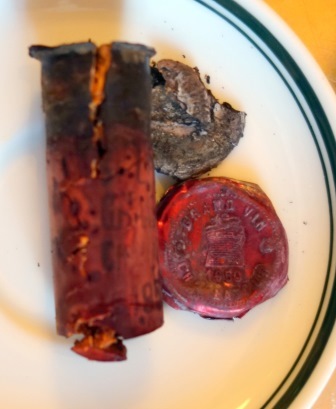 Mon cœur penche vers le Dom Pérignon. 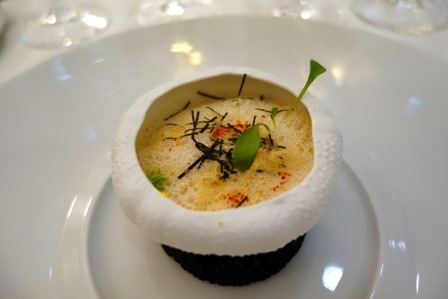 Le menu créé par Alain Pégouret est ainsi composé : pâtes sèches de blé dur farcies de gambas, crème légère au parmesan / crémeux d’œuf aux langues d’oursins, corail au naturel / pigeon à peine fumé et rôti en cocotte, pommes soufflées « Laurent » / selle et carré d’agneau de lait des Pyrénées rôtis, moussaka d’aubergine / mangue rôtie en croûte de cacao, parfait glacé praliné. 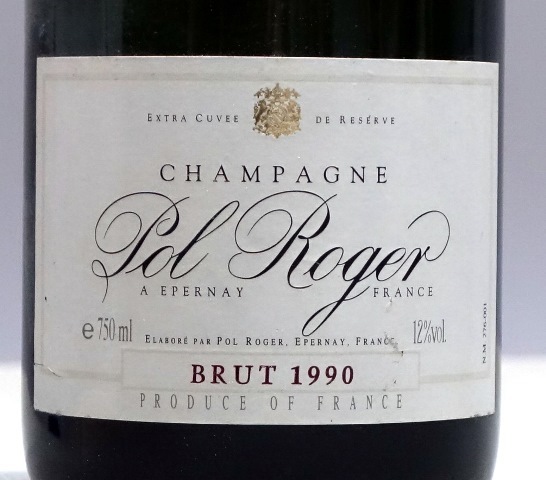 Le Champagne Pol Roger Brut Vintage 1990 est comme le Veuve Clicquot très conquérant. Plus jeune il est dans des gammes de goûts que l’on connaît et crée moins de surprise. Orthodoxe, il est de haute qualité. Les pâtes sèches constituent un plat qui offre beaucoup trop de saveurs pour avoir sa place dans l’un de mes dîners. 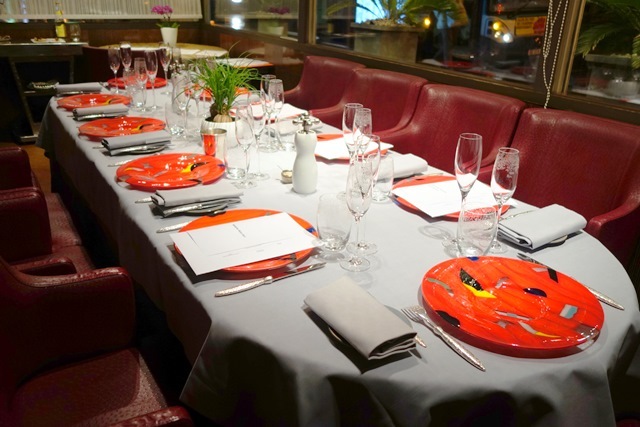 Alors que je me félicite toujours des prestations du restaurant Laurent, qui est très souvent le siège de mes dîners, un problème est apparu qui mérite analyse et remède. 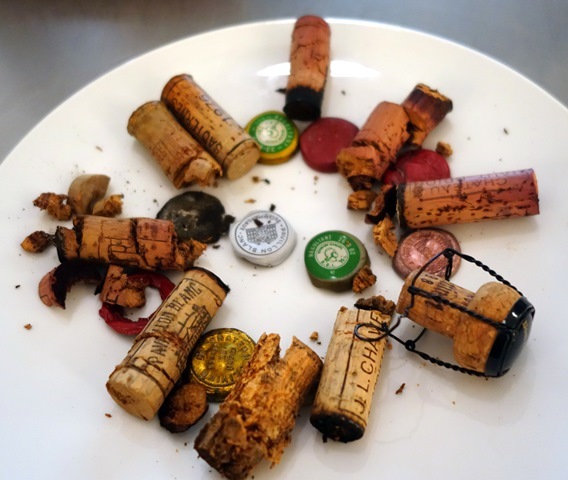 Suivant les ouvertures des vins autours de 17 heures, Daniel a mis les blancs dans la cave du jour des blancs et les rouges dans la cave du jour des rouges, deux meubles à la température normalement contrôlée. Or les blancs sont arrivés beaucoup trop froids, et les rouges beaucoup trop froids, au point d’être resserrés, ce qui a nui à leurs performances. 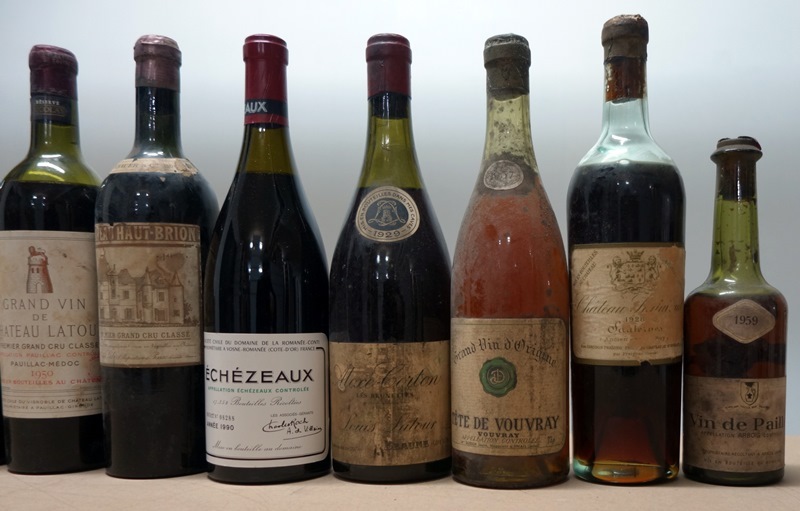 Les vins s’en sont sortis avec les honneurs mais auraient pu être beaucoup plus chaleureux et dans le cas de l’Aloxe-Corton 1929 dont j’attendais beaucoup, j’ai senti que les saveurs avaient mis le frein à main, resserrées et donc incomplètes. Malgré cela, nous avons tous apprécié ces vins de haute qualité. 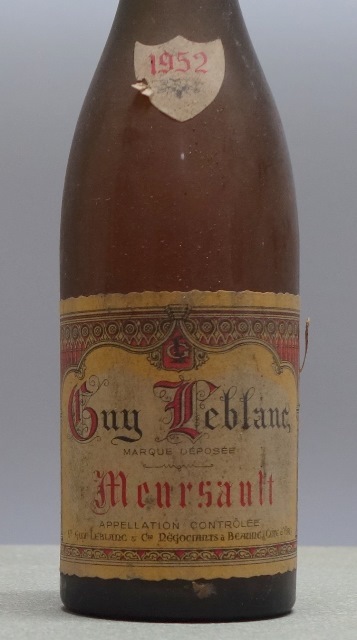 Le Meursault Guy Leblanc 1952 est particulièrement cher à mon cœur. 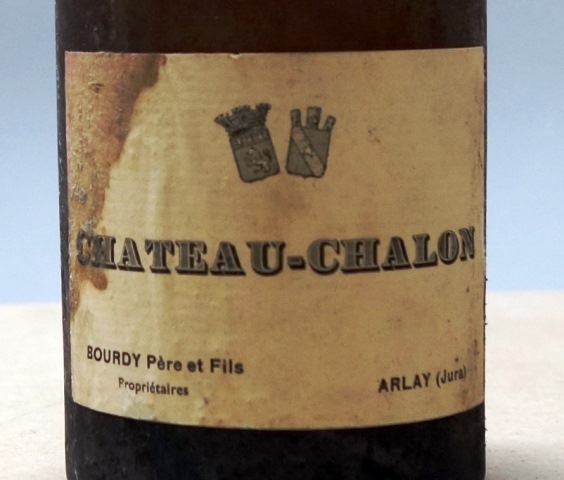 Dans ma cave fondée ex nihilo il y a quarante-cinq ans, il y a peut-être une trentaine de vins seulement qui proviennent de mon grand-père. Ce meursault en fait partie. Depuis plus de trente ans, il m’aguichait et me tentait. Il trouve sa justification aujourd’hui. 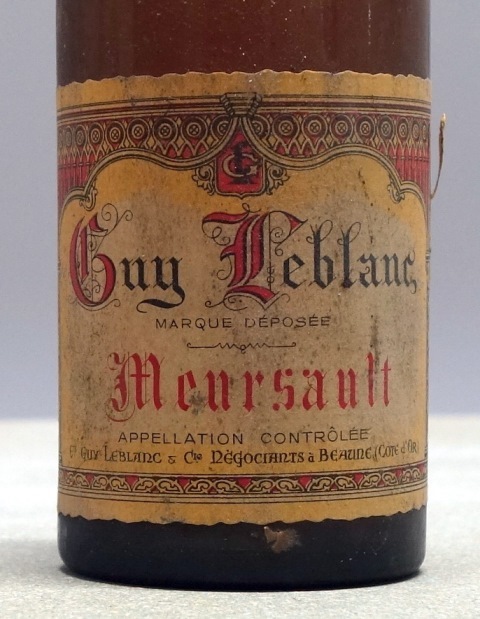 A l’ouverture, son parfum était magique, avec des petits fruits rouges aigrelets ce qui est inhabituel pour un meursault. Maintenant, son parfum est magique au point qu’on pourrait se contenter de sentir le vin. Ce parfum est d’une personnalité folle. 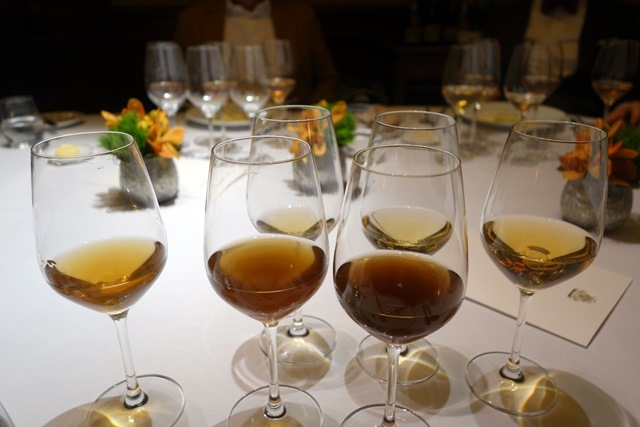 Le vin est d’un bel ambre doré et s’il est évolué, il est d’un charme de fruits d’automne absolument entraînant. On n’est pas à proprement parler dans le territoire des meursaults, mais la gourmandise est là au point que ce vin obtiendra dix votes sur onze participants votants, ce qui est le plus grand nombre de votes exprimés pour un vin du dîner. 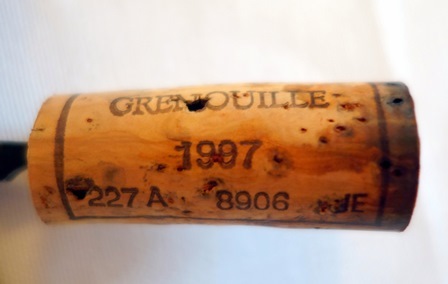 Fort curieusement, le Chablis Grand Cru Grenouille La Chablisienne 1997 est presque aussi ambré que le meursault ce qui est anormal et l’on voit bien que le meursault paraît plus jeune que le chablis qui a manifestement une évolution qu’il ne devrait pas avoir. Il n’est pas mauvais mais il n’a en rien les caractéristiques d’un grand cru. 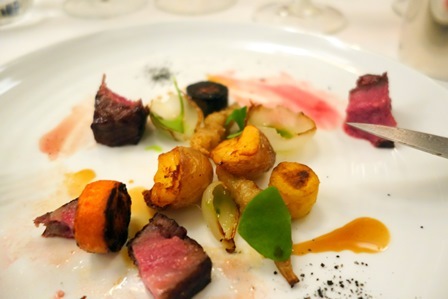 Le crémeux d’œuf aux langues d’oursins est un plat merveilleux qui met en valeur les vins blancs et leur convient parfaitement. Nous avons maintenant trois bordeaux rouges pour accompagner le pigeon. Je suis impressionné et mes amis aussi par le fait qu’ils sont tous les trois dans un état exceptionnel. 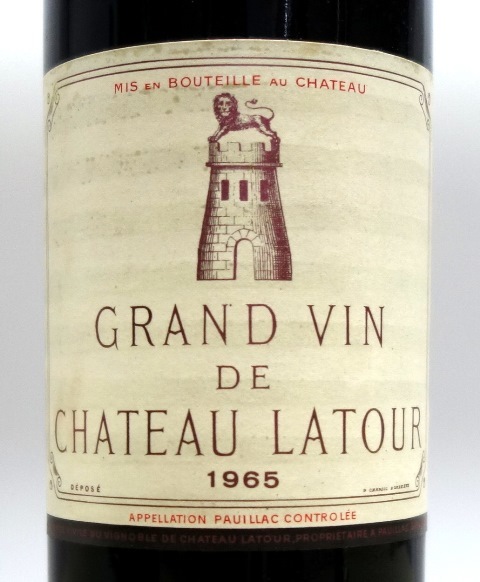 Le Château Latour 1965 est une divine surprise. D’une année particulièrement faible, il brille, vif, cinglant, riche et profond, incisif. 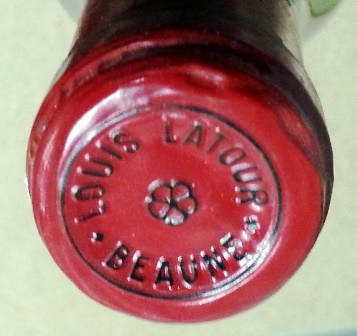 C’est un grand Latour et je suis vraiment surpris. 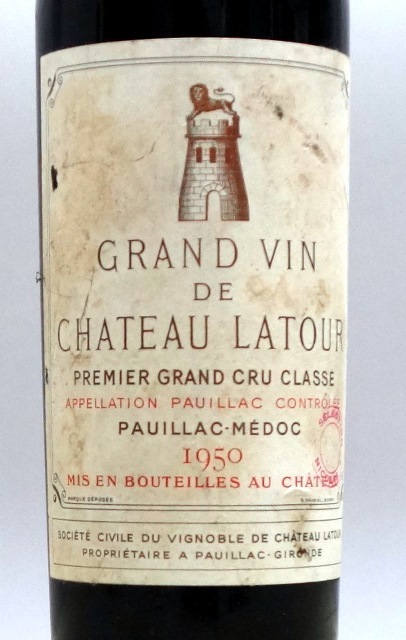 Le Château Latour 1950 est beaucoup plus riche et opulent que le précédent mais ne l’écrase pas de sa noblesse. 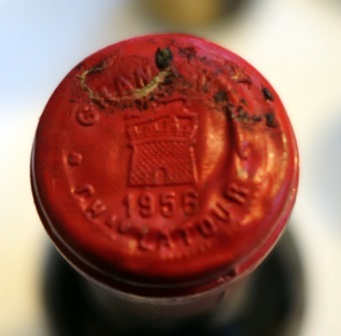 Il offre une autre facette de Latour, le 1965 plus cinglant et le 1950 plus complexe et rayonnant. 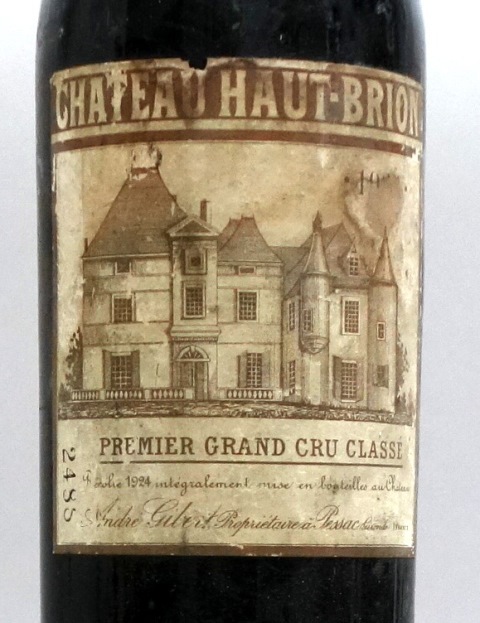 Le Château Haut-Brion 1924 est lui aussi une brillante surprise. 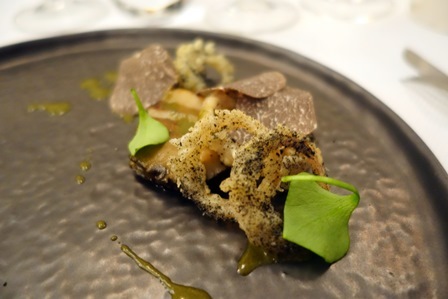 Il est riche, évoque merveilleusement la truffe et sa mâche est gourmande. Je n’attendais pas autant d’un 1924. Je ne lui ai pas rendu l’honneur qu’il méritait dans mon vote, car il est exceptionnellement gourmand et riche, d’une trame et d’un grain magnifique. Tout le monde ressent que cette triplette est d’un niveau rare. Le pigeon s’est bien trouvé avec les trois vins. 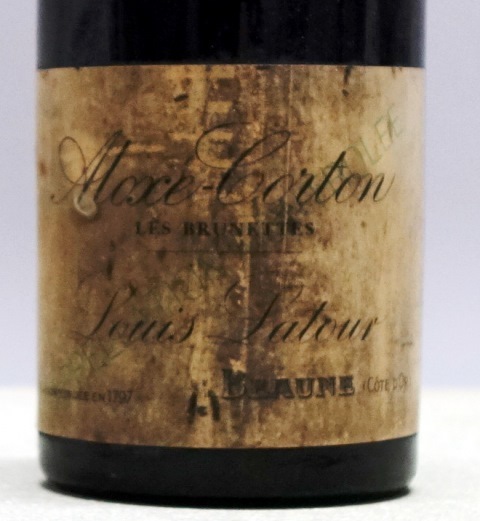 C’est avec l’Aloxe Corton «Les Brunettes» Louis Latour 1929 que je ressens le plus l’effet d’une température trop froide qui a rétréci les vins. On sent bien sûr à quel point il est brillant et à l’ouverture c’est sur lui que je comptais pour être au firmament. Dépité je ne l’ai même pas mis dans mon classement alors qu’il finit deuxième au classement qui synthétise les votes des onze convives. 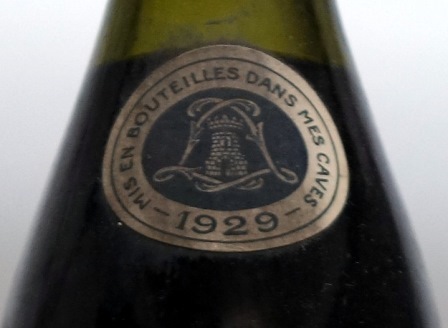 C’est la majestueuse année 1929 qui donne de l’ampleur à ce vin bourguignon triomphant. 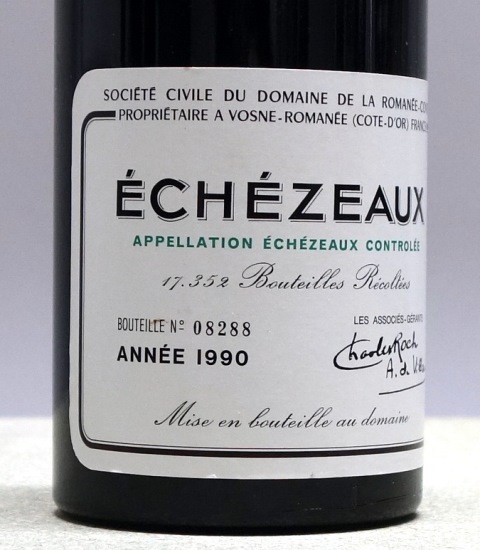 A côté de lui, l’Echézeaux domaine de la Romanée Conti 1990 dont je craignais l’odeur à l’ouverture a encore un parfum poussiéreux mais qui n’a aucune influence sur le goût. Et je suis même étonné au contraire de l’ampleur de ses fruits rouges généreux. On sent le sel caractéristique des vins du domaine et la rose n’est plutôt qu’une autosuggestion. Le vin me rassure, il est brillant et d’une force que je n’attendais pas à ce niveau. 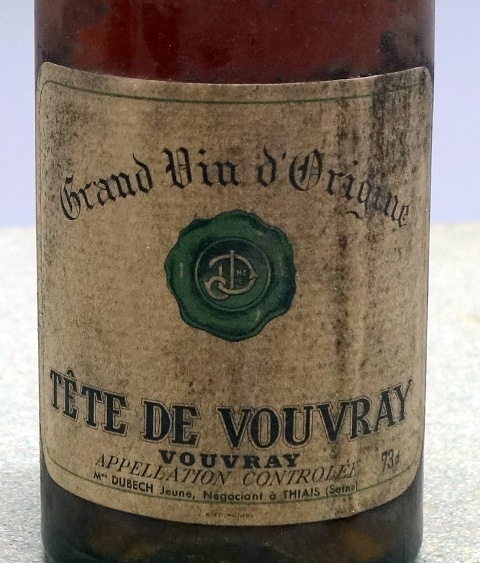 Le Tête de Vouvray Mme Dubech Jeune 1937 a une jolie couleur légèrement ambrée et le vin est sec et a très probablement toujours été sec. Il est donc à contremploi sur le dessert et c’est bien dommage car mis en situation, il serait brillant. 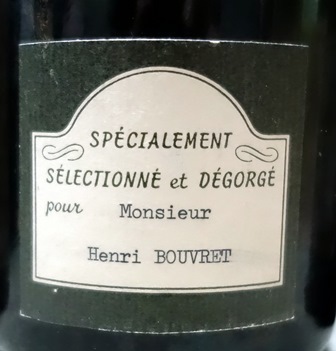 C’est un beau vouvray sec mais hors sujet ce soir. Le Château Suduiraut 1928 a une couleur tellement sombre de chocolat noir que certains convives se demandent si c’est normal. Dès qu’ils sentent le vin et le boivent, les doutes disparaissent tant ce Suduiraut est royal. Certains qui lisent mes bulletins assidument découvrent l’accord sauternes et mangue et sont subjugués par sa pertinence. 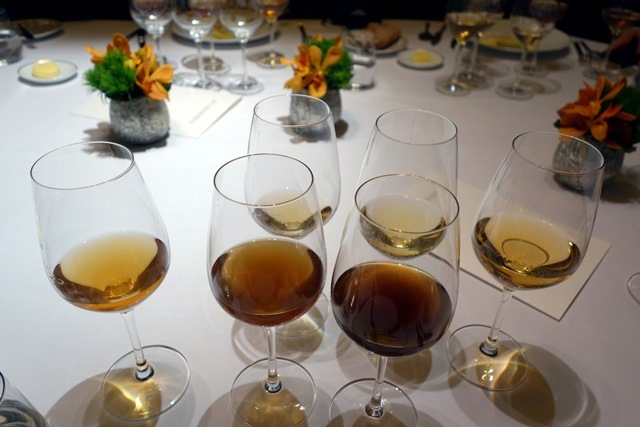 Ce vin est riche, puissant, déborde de fruits exotiques mais aussi de caramel et de miel. C’est une merveille. 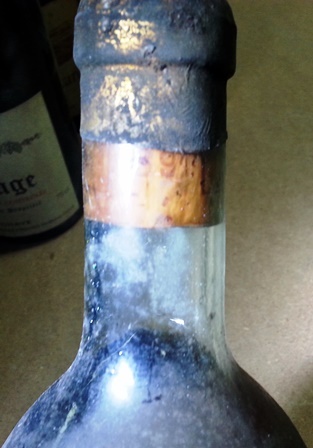 Le vin un peu trouble n’est pas le meilleur des Suduiraut 1928 que j’ai bus aussi est-ce la raison pour laquelle je ne l’ai pas classé premier alors qu’il le mériterait. 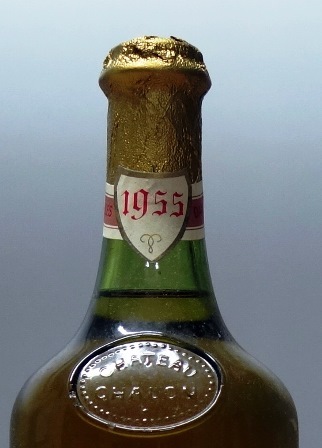 J’ai ajouté au programme une très jolie demi-bouteille de Vin de Paille Domaine de la Pinte 1959. La devise sur l’étiquette est amusante : « plante beau, cueille bon, pinte bien ». Le vin m’étonne car il exprime un alcool inhabituel pour les vins de paille. Mais il est tellement bon, gourmand et joyeux que je l’ai inclus dans mon vote. On dirait un vin de paille qui a fauté avec un marc. 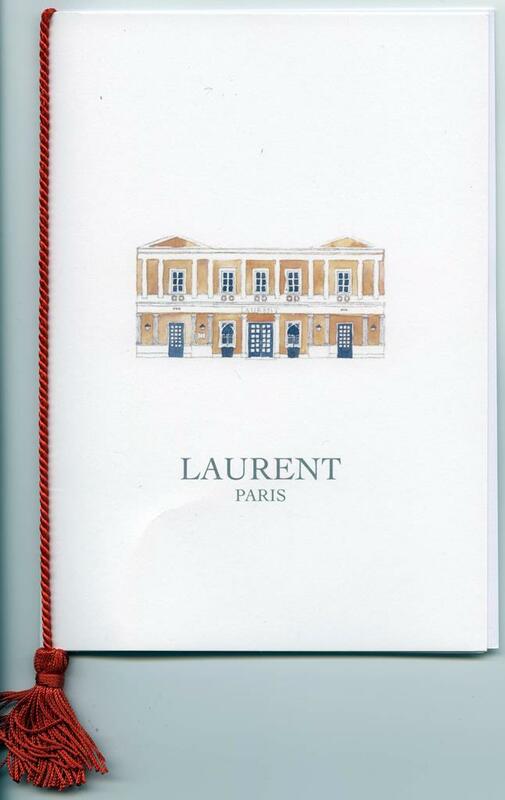 Il est délicieux sur les légendaires palmiers du Laurent. Jamais il n’aura été aussi difficile de voter pour les vins tant les prétendants aux bonnes places ont été nombreux. De ce fait au lieu de voter pour quatre vins, nous avons voté pour les cinq préférés de chacun. 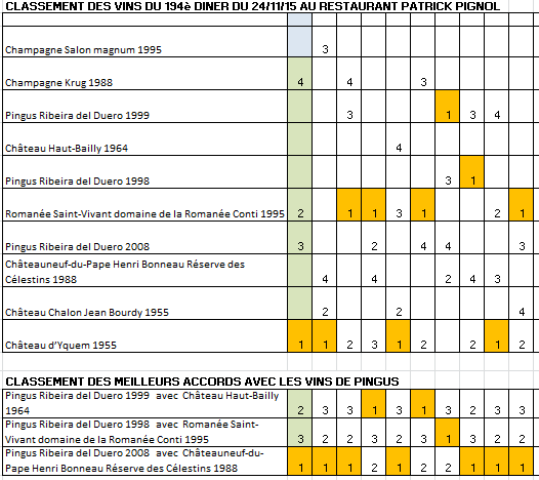 Sur les treize vins puisque fort opportunément quelqu’un a voté pour le Veuve Clicquot, onze figurent dans les votes ce qui est remarquable et les deux oubliés le sont pour des raisons logiques : le chablis ne figure pas parce qu’il est anormalement évolué et le vouvray, parce qu’il est sec et donc mal placé dans le déroulement du repas. 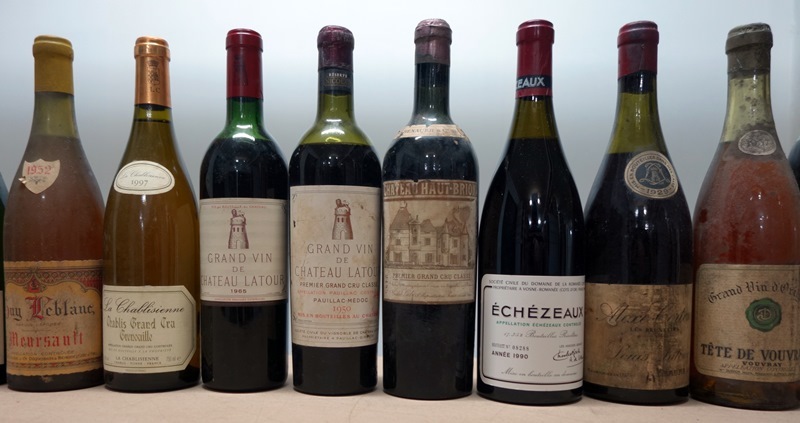 Cinq vins ont eu les honneurs d’être nommés premiers, le Suduiraut 1928 cinq fois, le Latour 1950 deux fois comme le Haut-Brion 1924, l’Aloxe-Corton 1928 comme l’Echézeaux 1990 étant nommés une fois premier. 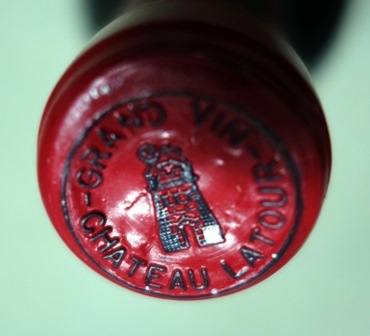 Le vote du consensus serait : 1 – Château Suduiraut 1928, 2 – Aloxe Corton «Les Brunettes» Louis Latour 1929, 3 – Château Latour 1950, 4 – Meursault Guy Leblanc 1952, 5 – Château Haut-Brion 1924. 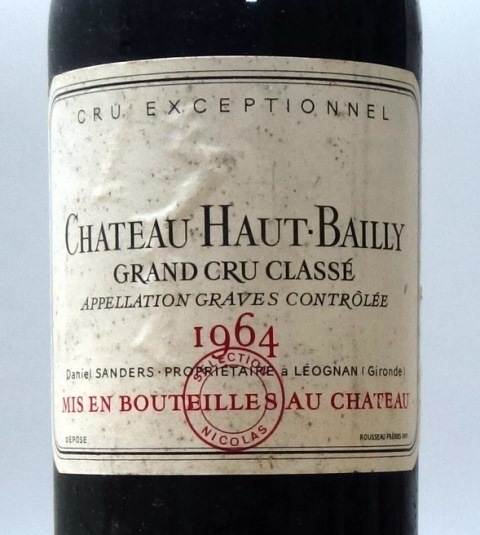 Mon vote est : 1 – Château Latour 1950, 2 – Château Suduiraut 1928, 3 – Vin de Paille Domaine de la Pinte 1959 , 4 – Meursault Guy Leblanc 1952, 5 – Château Haut-Brion 1924. Après coup, je pense que je n’ai pas rendu l’hommage que méritait le Haut-Brion 1924. Mais les votes se font dans l’instant et la spontanéité. On ne les réécrit pas après. 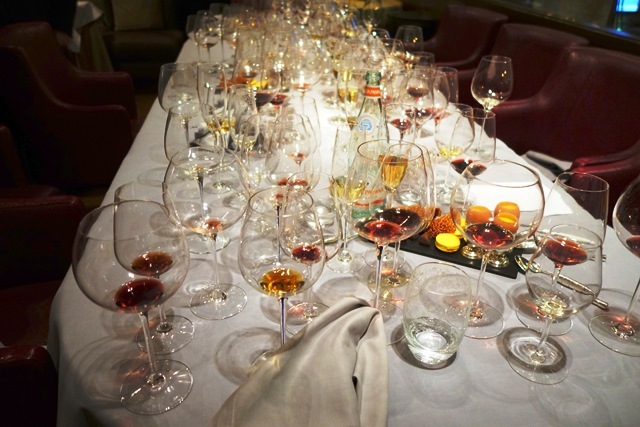 Que retenir de ce dîner ? Le problème des températures de service est important et doit être regardé pour l’avenir. L’entrée ne correspond pas à ce qui est nécessaire pour ces dîners : une lisibilité complète et une cohérence des goûts d’un plat. Voilà pour le négatif, largement compensé par le positif : un service impeccable, une cuisine sensible. A notre table l’atmosphère fut enjouée, les moments de rire nombreux. J’ai été impressionné par le fait que les cinq rouges se sont présentés à un niveau qualitatif exceptionnel. Ce dîner fait partie des souvenirs que l’on chérit. 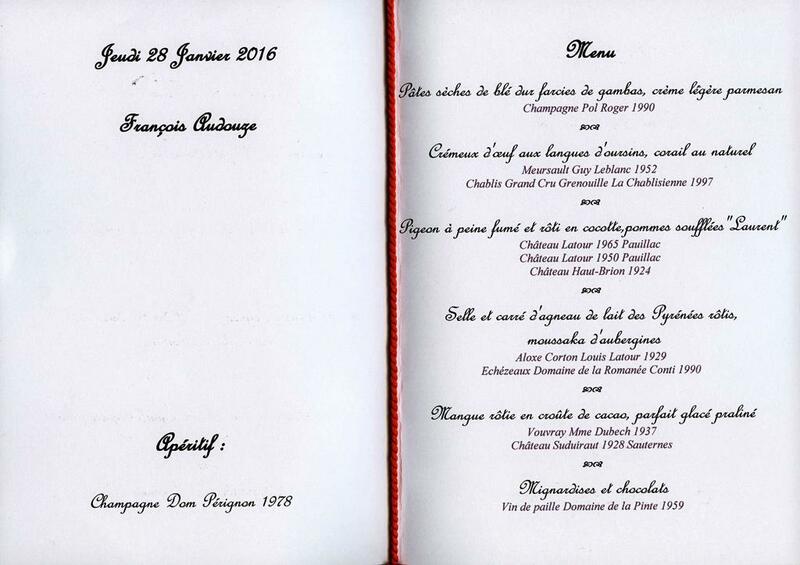 Cette entrée a été publiée dans dîners de wine-dinners le 29 janvier 2016 par François Audouze. 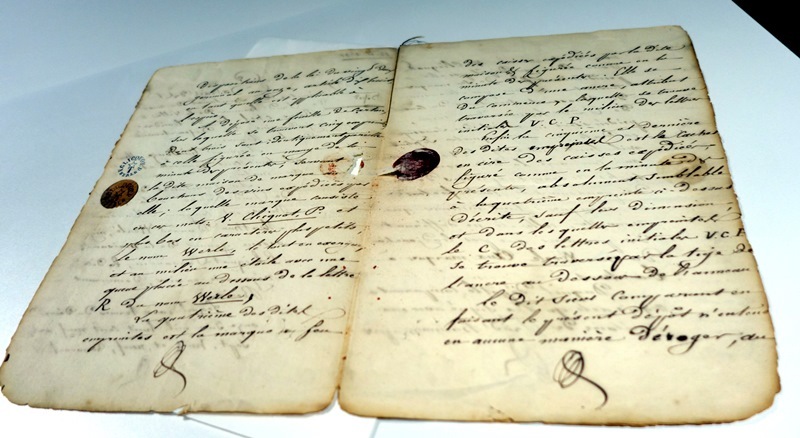 Isabelle Bachelard, qui avait assisté à la présentation de Pingus au restaurant de Lavinia, le célèbre « marchand de vins », a fait un article sur Pingus où le dîner de confrontation de Pingus avec des vins anciens est cité. 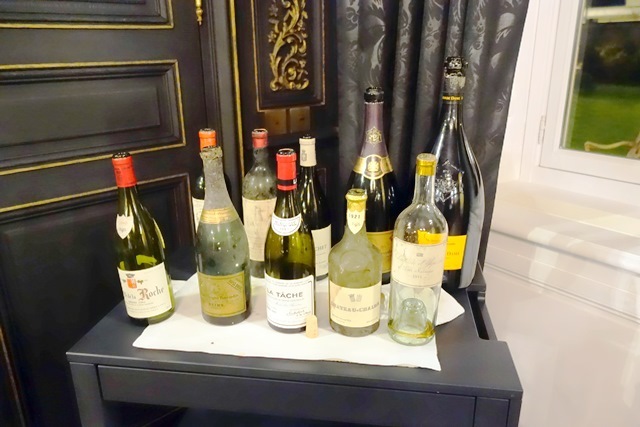 Cette entrée a été publiée dans dîners de wine-dinners le 18 décembre 2015 par François Audouze. 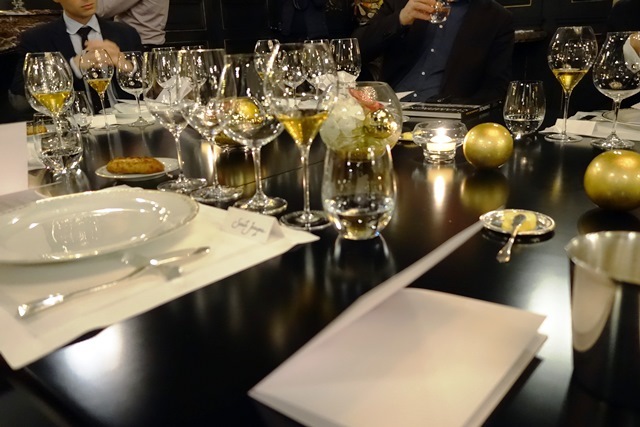 Le 196ème dîner de wine-dinners se tient à l’hôtel du Marc, demeure de réception de la maison de champagne Veuve Clicquot Ponsardin, au centre de Reims. 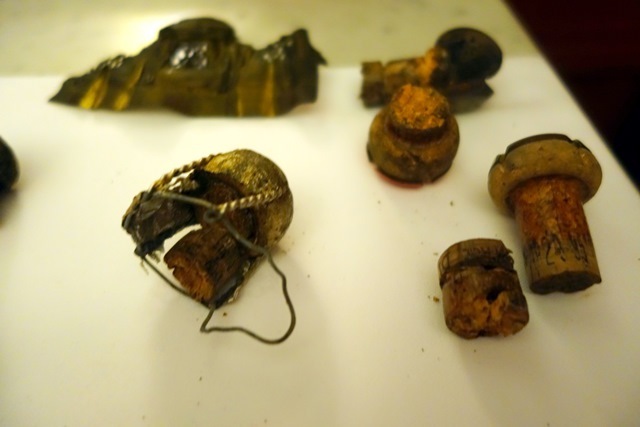 La raison du choix de ce lieu est que je vais ouvrir l’une des bouteilles de la mer Baltique que j’ai acquises lors d’une vente aux enchères en 2012, bouteille trouvée par 48 mètres de profondeur en 2010 et datée d’avant 1840. 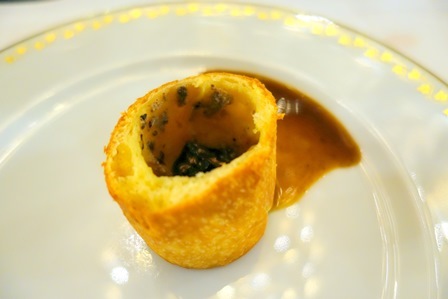 Les bouteilles du dîner ont été livrées il y a trois semaines lorsque je suis venu à l’hôtel du Marc pour mettre au point le menu du dîner avec le chef Christophe Pannetier. 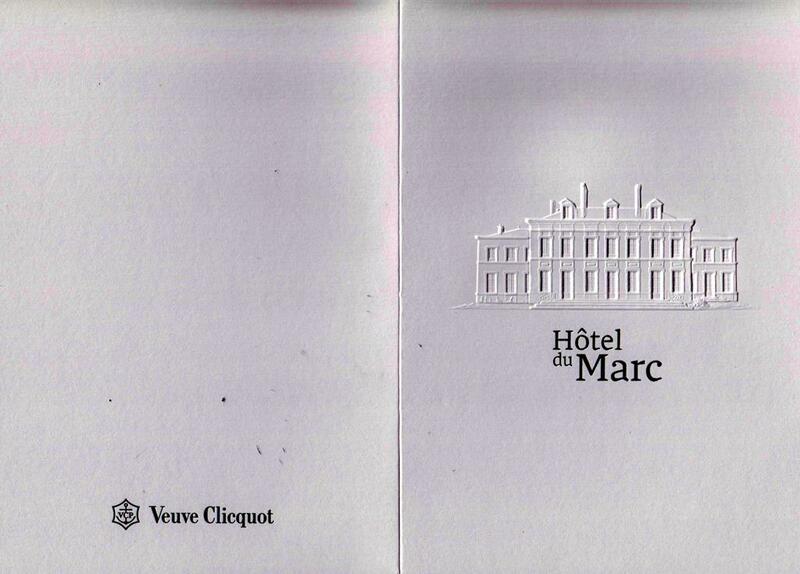 J’arrive en début d’après-midi à l’hôtel du Marc pour accueillir les premiers invités. 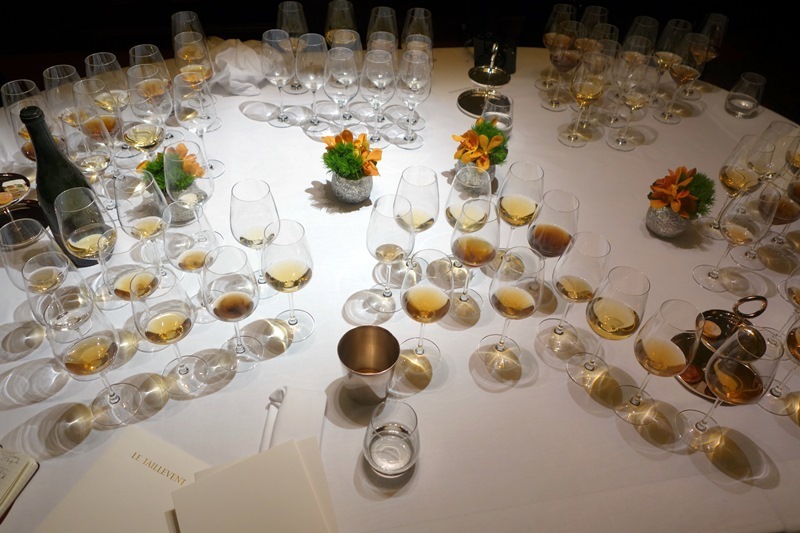 Notre table sera cosmopolite puisqu’il y aura deux américaines, de Boston et de Miami, deux américains, de San Diego et de la Napa Valley, un lituanien, une finlandaise, un japonais et quatre français dont un cadre de direction de la division Moët Hennessy du groupe LVMH et nôtre hôte, Dominique Demarville, chef de cave de Veuve Clicquot. Nous aurions pu compter aussi un anglais et un mauricien qui furent empêchés au dernier moment. Les activités des uns et des autres sont extrêmement diverses, le corps médical ayant trois représentants, la restauration ou l’hôtellerie deux, une Master of Wine, un journaliste, un homme d’affaires, etc. Nous prenons possession de nos chambres, nous prenons un café dans le salon de réception de l’hôtel du Marc, des photographes arrivent, et lorsque Dominique Demarville nous rejoint, nous descendons tous en cave pour assister à l’importante opération qui est l’ouverture des vins. Avec Dominique nous déterminons combien de temps à l’avance il faudra ouvrir les champagnes. 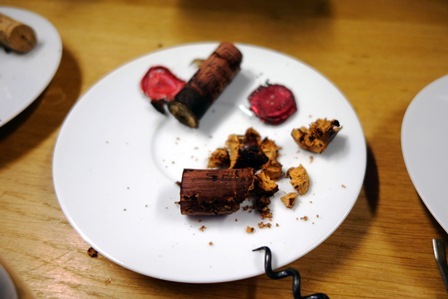 Nicolas le sympathique et efficace sommelier a disposé en cave les bouteilles sur une table de telle façon que nous puissions tous prendre des photos des vins. 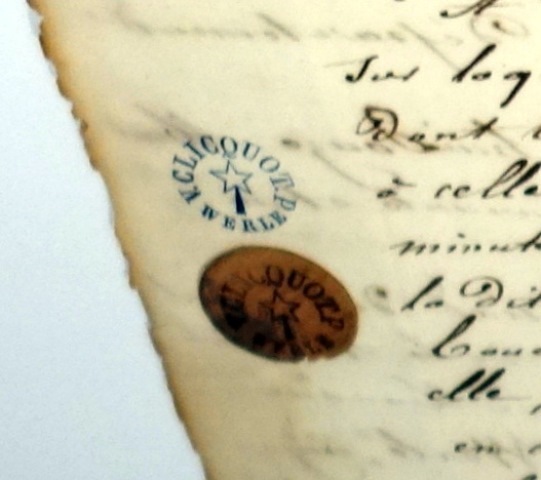 Dominique Demarville se souvient qu’il y a trois semaines il avait été décidé d’ajouter au programme un magnum sans étiquette et sans signe distinctif sauf une poussière qui indique un âge avancé. En pleine discussion sur les heures d’ouverture Dominique touche le bouchon de cette bouteille qui lui reste dans la main. Il n’y aura donc aucun dilemme pour l’heure d’ouverture de celle-ci. Dominique la sent et déclare la bouteille morte. Je la sens aussi et j’exprime un espoir car le parfum est délicat. On me propose de goûter un peu de ce liquide rouge foncé et force est de constater que c’est du vinaigre. On lui laissera quand même une chance de se reconstituer pour le dîner et Dominique pense déjà à ce qu’il pourrait ajouter au dîner alors qu’il y a beaucoup de vins. 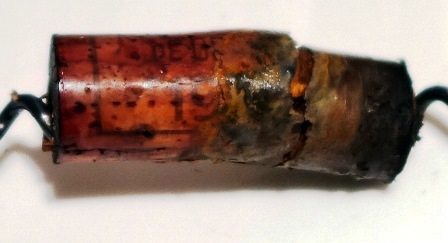 Pour la bouteille de la Baltique, je recommande une ouverture au dernier moment car elle avait été rebouchée lors de sa sortie de l’eau en 2010 avec un bouchon neuf. J’ai peur d’un évanouissement si on ouvre trop longtemps en avance. Dominique approuve ce choix. Il est temps d’ouvrir les autres vins. 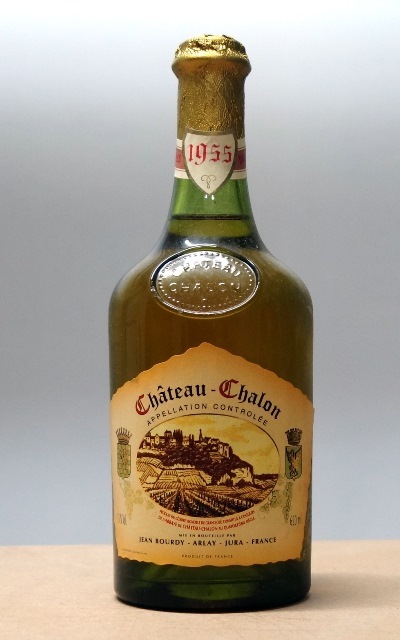 Ce qui est particulièrement gratifiant pour moi, c’est que les parfums de tous les vins que j’ai apportés sont magnifiques, les plus beaux étant ceux du Château Chalon 1921, de l’Yquem 1911 et du Clos de la Roche 1990. Le parfum de La Tâche 1990 est un peu discret mais pur. Certains bouchons ont résisté, certains se sont brisés en menus morceaux, mais tous sont sortis sans la moindre chute de copeaux dans la bouteille. L’ambiance en cave est celle de passionnés qui sont avides de savoir comment se comporteront les vins. Nous allons nous changer car à 18 heures commencera la présentation du dîner. 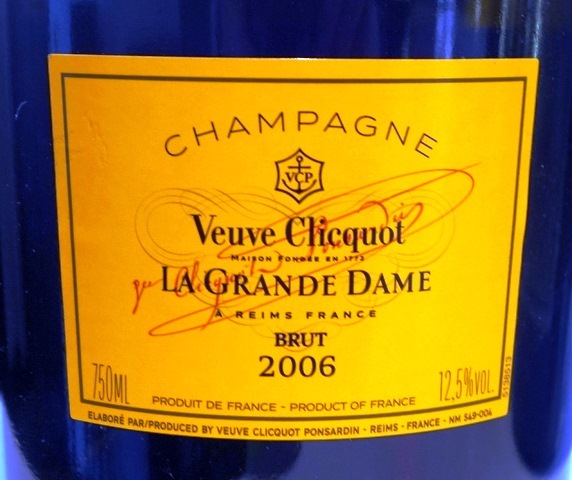 En attendant ceux qui s’habillent, Nicolas nous verse un Champagne Veuve Clicquot Carte Jaune base 2009 qui est particulièrement agréable à boire, vif, fait de citron et de miel. C’est une belle mise en bouche. 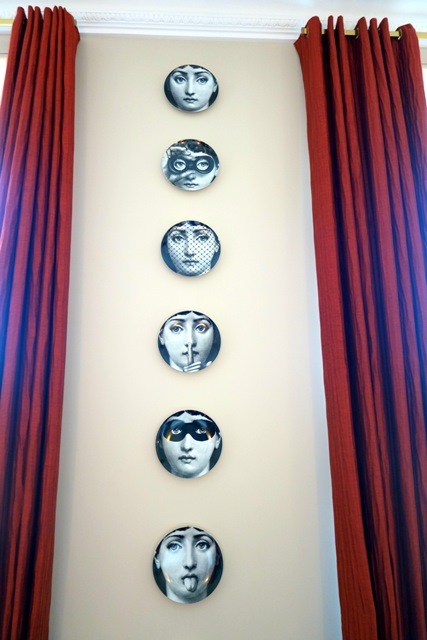 Nous sommes maintenant dans le grand bar à la décoration très avant-gardiste. deux écrans posés sur deux murs opposés permettent de suivre la présentation de mes dîners, quelques statistiques sur ce que j’ai bu et la présentation du dîner de ce soir. 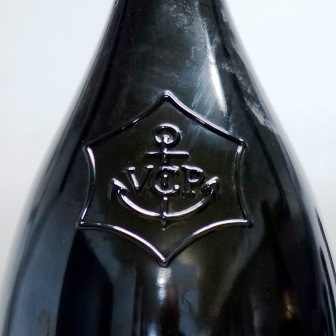 Après cette introduction chacun se présente et Fabienne Moreau, l’historienne de Veuve Clicquot Ponsardin présente deux petits films sur la découverte des vins du bateau échoué en mer Baltique ainsi que les moyens pour dater le champagne que nous allons boire. 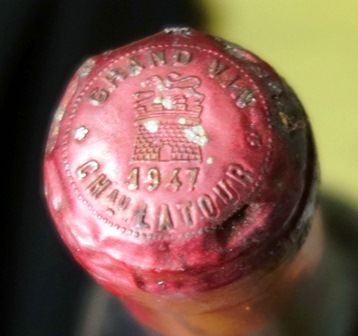 Avec des gants blancs elle découvre devant nous une archive du temps de madame veuve Clicquot qui montre que le miroir du bouchon (la face inférieure qui est au contact du vin) de la bouteille trouvée dans la Baltique est le même que celui des archives qui concernent la mise en bouteilles en 1841. 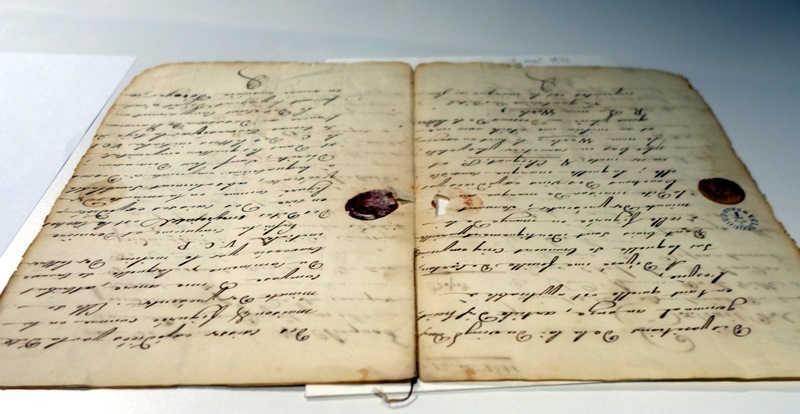 Ces précisions historiques avec les documents d’origine nous passionnent. 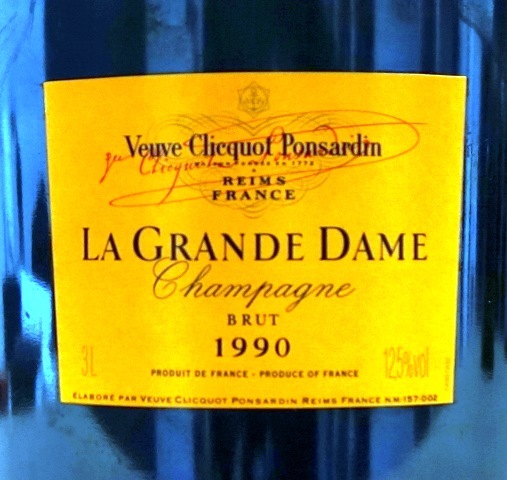 Pendant tous ces échanges, nous buvons un Champagne Veuve Clicquot Ponsardin La Grande Dame Jéroboam 1990. Le nez de ce vin est explosif. Une bombe de fragrances. En bouche le champagne est incroyablement tonique. Ça pulse ! Il est riche, intense profond, conquérant. C’est un champagne qui saura vieillir et l’on peut penser que malgré ses 25 ans, on le boit trop jeune. C’est sans doute l’effet du jéroboam. Tout en étant puissant il est facile à vivre et nous y revenons avec plaisir. 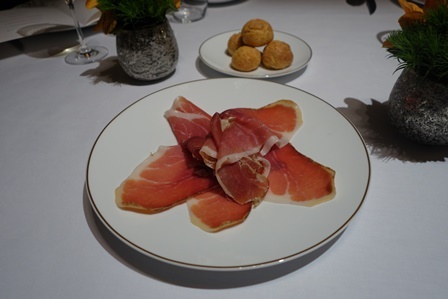 On nous apporte du jambon Pata Negra, des gougères au parmesan, des toasts au foie gras et c’est surtout avec des tartines à la truffe que le champagne prend son envol et montre à quel point il peut être brillant. 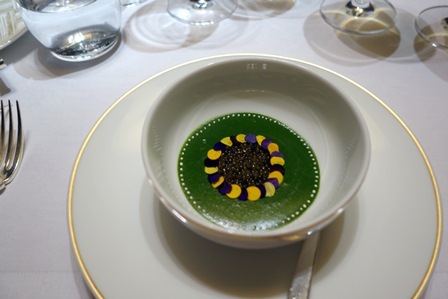 Le menu mis au point par le chef Christophe Pannetier est : Tiradito de Saint-Jacques au caviar de Sologne / Grosse langoustine saisie à la plancha, écume de mer / Homard bleu laqué aux sucs de carapaces / Pigeonneau de Racan, salsifis fondants / Noisettes de biche aux trompettes de la mort, pommes purée / Truffe en croûte briochée / Mangue dorée à la fleur de thé et fruits du mendiant. 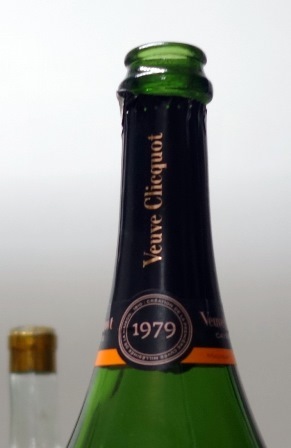 Le Champagne Veuve Clicquot Ponsardin Vintage magnum 1955 montre exactement ce que pourrait être la Grande Dame 1990 que nous venons de boire. Car tout en ce champagne est coordonné. Il a atteint une forme d’équilibre qui fait qu’il n’a pas d’âge tant il est cohérent. 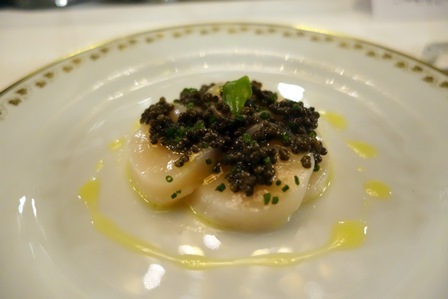 Il se marie à merveille avec le sucré de la coquille Saint-Jacques et le salé de l’excellent caviar. Alors que le chef a magnifiquement épuré sa cuisine, j’aurais volontiers enlevé le trait de jus de citron qui a un peu bridé le sucré, sans nuire vraiment à l’accord. La sérénité du champagne est enthousiasmante. 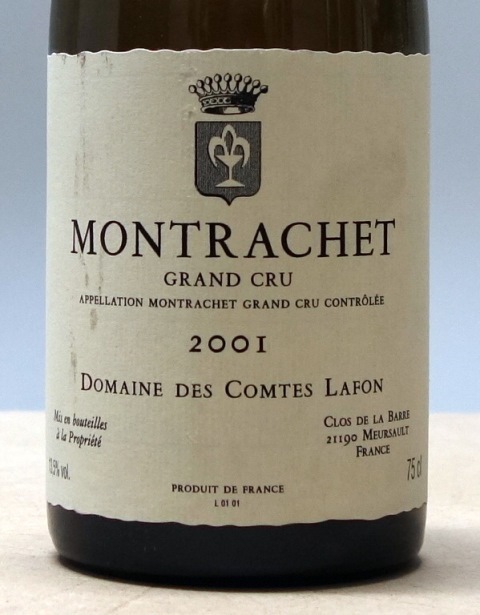 Le Montrachet Domaine des Comtes Lafon 2001 est l’opulence même. 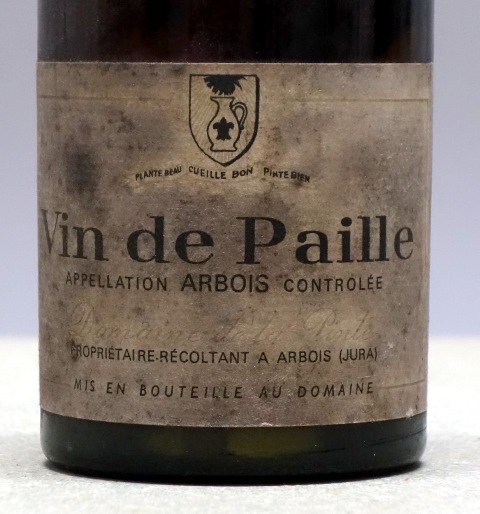 Ce vin est glorieux, à un niveau de perfection incroyable. Il est riche, il est grand, on ne sent même pas qu’il est jeune car il a apprivoisé sa jeunesse. 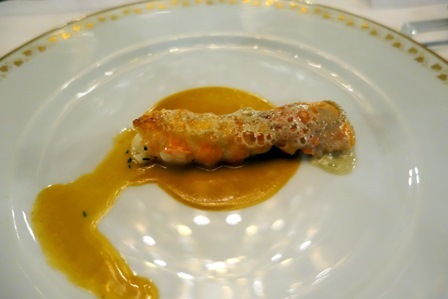 La langoustine est superbe et forme un accord de rêve car la sauce intense provoque et titille le vin. C’est un grand moment de gastronomie. 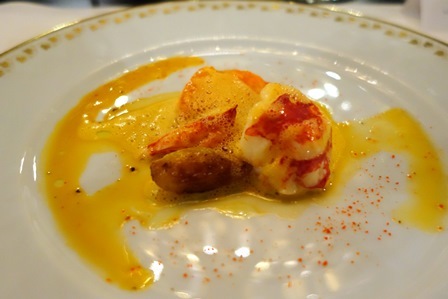 Le homard accompagne deux vins rouges et je vois l’étonnement de beaucoup devant un accord qui paraît improbable et osé et qui se révèle, une fois qu’on l’a essayé, d’une totale évidence. 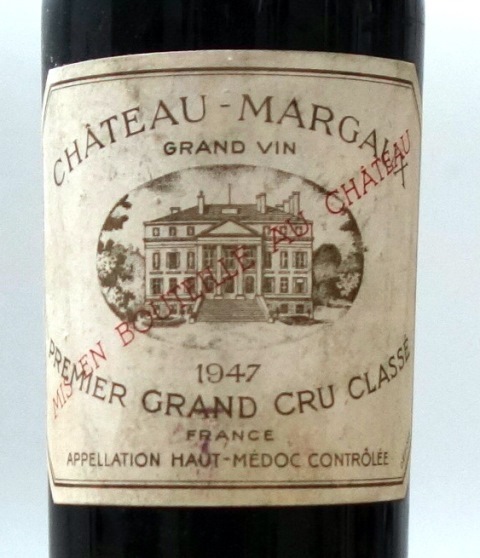 Le Château Margaux 1er Grand Cru Classé 1947 est d’une richesse extrême. 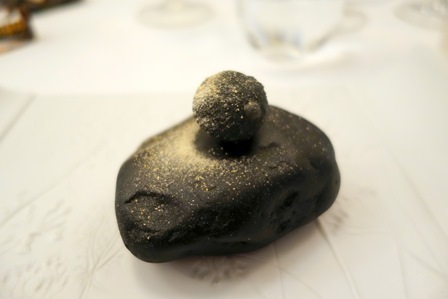 Ce vin, on dirait du plomb ou de la truffe. Il est riche et noble en même temps. 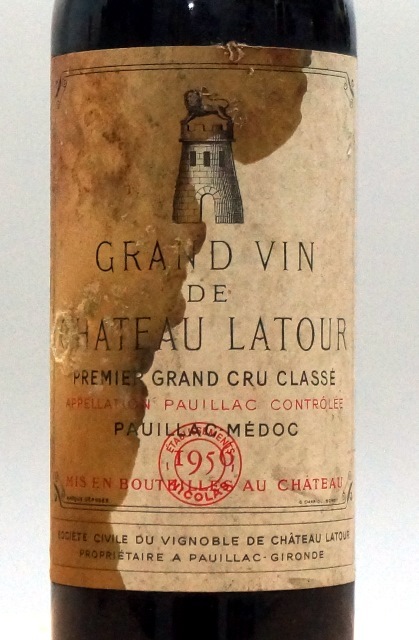 A côté de lui, le Château Latour 1er Grand Cru Classé 1947 à la couleur plus claire, fait plus romantique. 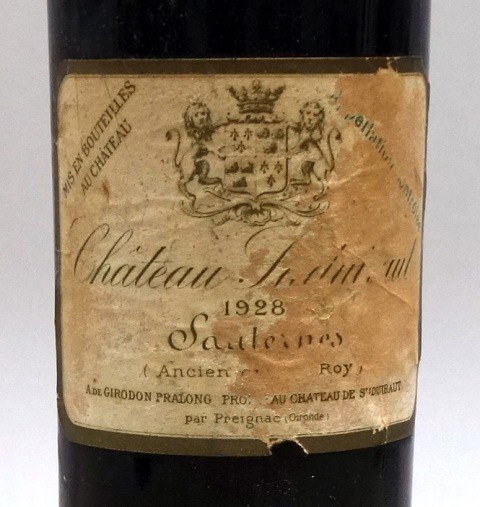 Alors qu’on dit souvent que Château Margaux est féminin, dans ce couple de deux 1947, c’est le Margaux qui est le mâle dominant. 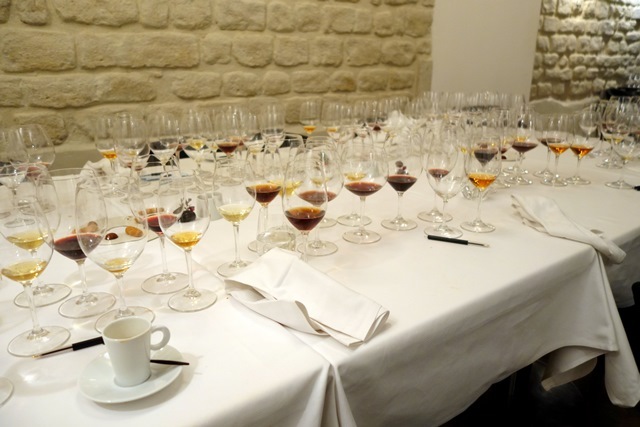 Les deux vins sont parfaits, déclinant de très belles complexités, le Margaux vers la truffe et le Latour vers des fruits rouges. Le corps du homard se marie avec le Margaux et les pinces avec le Latour. C’est la sauce renforcée aux carapaces pilées qui parachève l’accord avec les deux vins. Le pigeon est une merveille de force et de douceur. 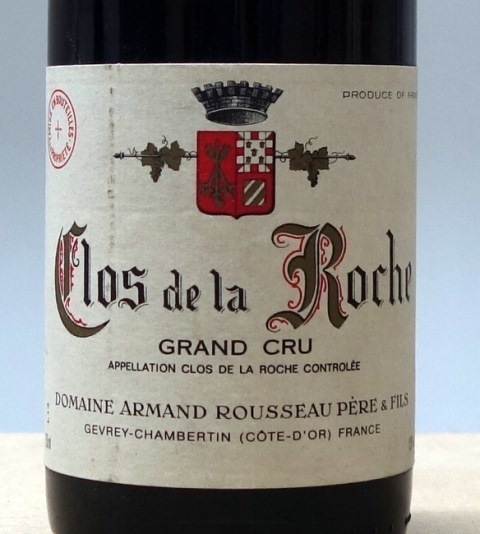 Le Clos de la Roche Domaine Armand Rousseau 1990 est tellement extraordinaire que je m’écrie : « le couple pigeon et Clos de la Roche est orgasmique ». Car il y a une séduction dans le vin qui est poussée au-delà de l’imaginable. 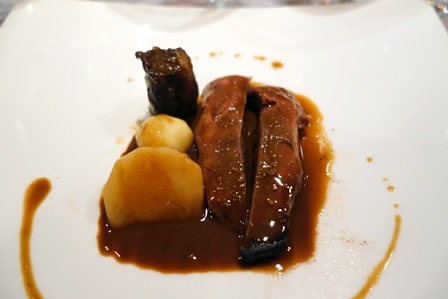 Le vin est suave, envoûtant, mais il est aussi pleinement bourguignon avec une jolie râpe. Je vis un moment d’extase avec un vin au charme infini. 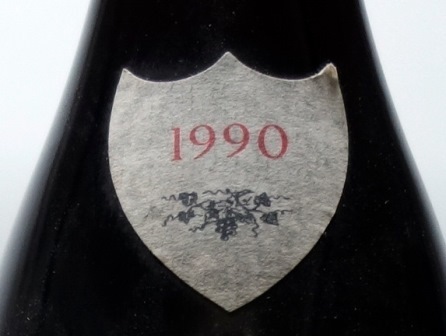 La Tâche Domaine de la Romanée Conti 1990 avait un nez un peu fermé à l’ouverture. Le nez est beau maintenant mais le vin ne se délivre pas vraiment. Il a tout ce qui fait de lui un vin de légende, mais comme le bernard-l’hermite, il se cache dans sa coquille. Certains convives adorent ce vin. J’en ai bu d’autres de ce millésime beaucoup plus expansifs. 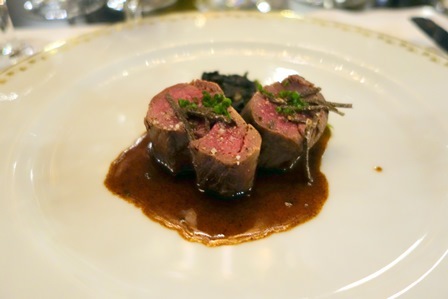 L’accord avec la biche est pertinent, le chef nous gratifiant d’une cuisine exemplaire. 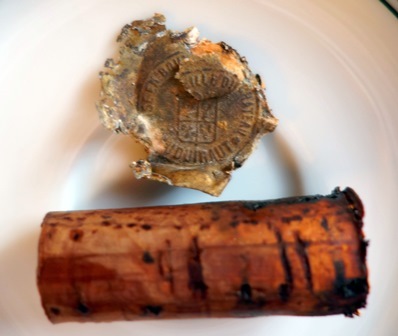 J’avais choisi de mettre ensemble sur la truffe le vin de la Baltique et le Château Chalon Maison Jean Bourdy 1921. 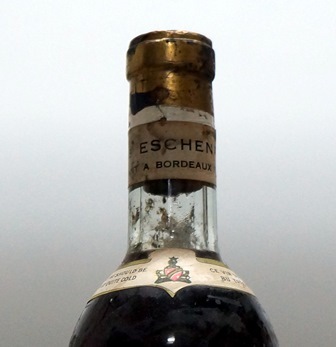 Ce vin qui avait un parfum éblouissant à l’ouverture l’est tout autant en bouche. C’est vin jaune triomphant, magique, royal. Sa complexité trouve un écho dans la truffe. J’ouvre maintenant le Champagne Veuve Clicquot Ponsardin # 1840 et je ne peux pas masquer ma grimace. Une épouvantable odeur d’étable envahit mes narines. Cette odeur tenace accompagnera notre dégustation au point qu’à un moment je demande qu’on change nos verres pour des verres évasés, pour que l’odeur soit moins concentrée, lorsqu’on approche ses lèvres du verre. Ai-je eu tort d’ouvrir le vin aussi tard ? Non, car l’odeur sera encore présente le lendemain matin dans le reste de la bouteille et sur le bouchon. 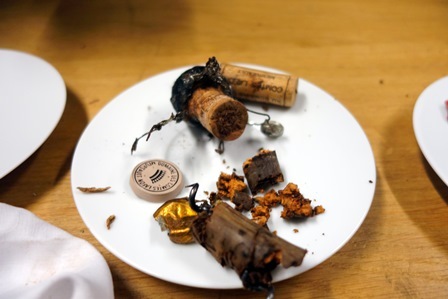 Si l’on fait abstraction de ce handicap, le vin en bouche est sucré, riche, avec beaucoup de complexité et une grande persistance aromatique. La sucrosité très présente est élégante. 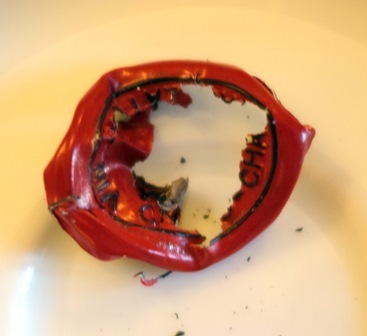 J’avais acheté cette bouteille sur la foi des affirmations d’un grand expert mondial du champagne qui avait goûté les vins au moment de leur rebouchage. L’odeur si intense était-elle présente au moment du rebouchage ? Je ne me prononcerai pas mais je suis déçu que le champagne ne corresponde pas aujourd’hui à la description qui en avait été faite il y a trois ans. Autour de moi, on est peut-être un peu moins sensible à l’odeur insistante et on se préoccupe plus du vin, dont la douceur est belle, la complexité s’ouvrant sur une belle longueur qui pourrait être raffinée. 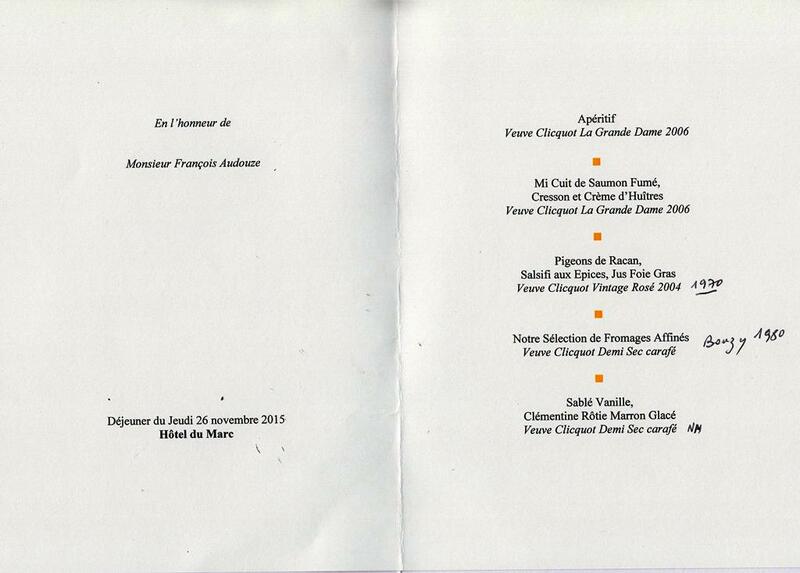 D’ailleurs, deux convives classeront ce vin comme premier dans leurs votes. Dominique Demarville avait fait monter le « vinaigre » inconnu. 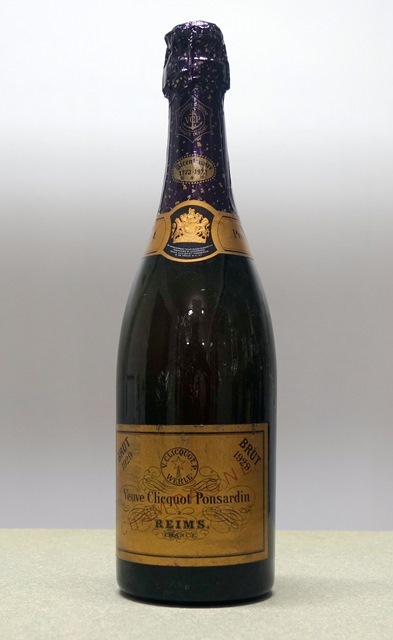 Je goûte à nouveau ce qui pourrait être un Bouzy rouge Veuve Clicquot Ponsardin années 1930. L’impression est beaucoup moins désagréable mais c’est encore un vinaigre qui ne justifie pas qu’on insiste. Dominique Demarville avait pensé remplacer le Bouzy par une autre bouteille. 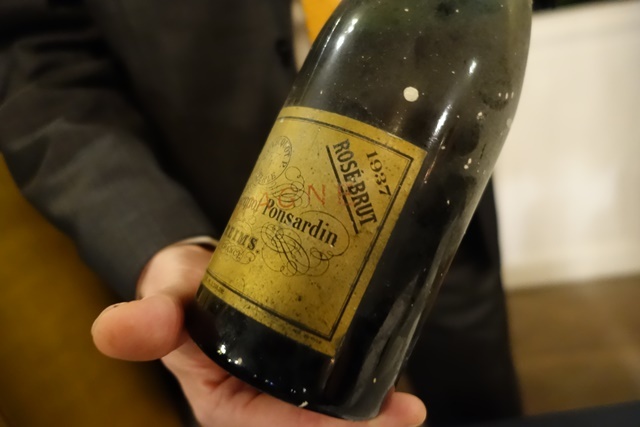 C’est un Champagne Veuve Clicquot Ponsardin Rosé magnum 1937 qui apparaît maintenant. Il est un peu abîmé par le temps, mais de façon sympathique. Il y a énormément de dépôt très noir, le rose est gris, mais le goût me plait car il y a encore une belle fraîcheur. On peut considérer que c’est un beau cadeau, car c’est une bouteille rare. 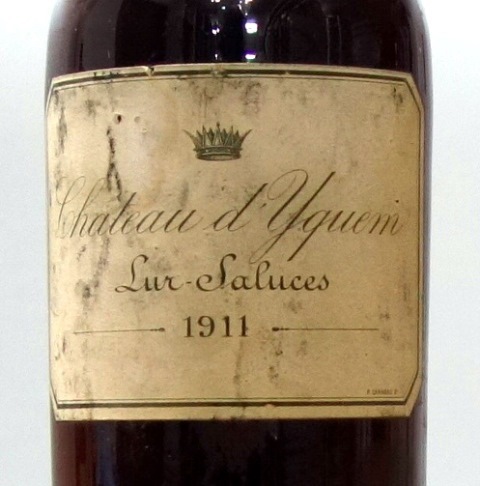 Après ces émotions, le Château d’Yquem 1911 est un soleil radieux. Ce vin illumine nos visages. Il est porteur de bonheur. Le nez est riche d’agrumes subtils, pénétrants. En bouche on sent que le vin a mangé un peu de son sucre mais il reste suffisamment de doucereux. C’est sa complexité qui est époustouflante ainsi qu’une longueur qui n’en finit pas. 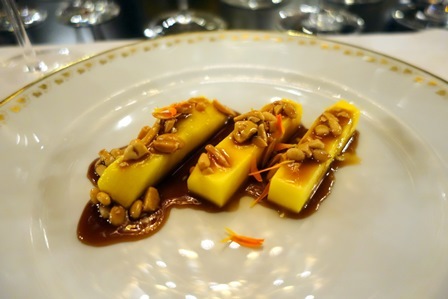 Le dessert est un peu trop sucré mais les ingrédients sont pertinents pour accompagner cet Yquem glorieux, un des tout grands dans l’histoire d’Yquem. Nous passons au salon pour nous raconter encore et sans fin nos émotions de ce dîner. 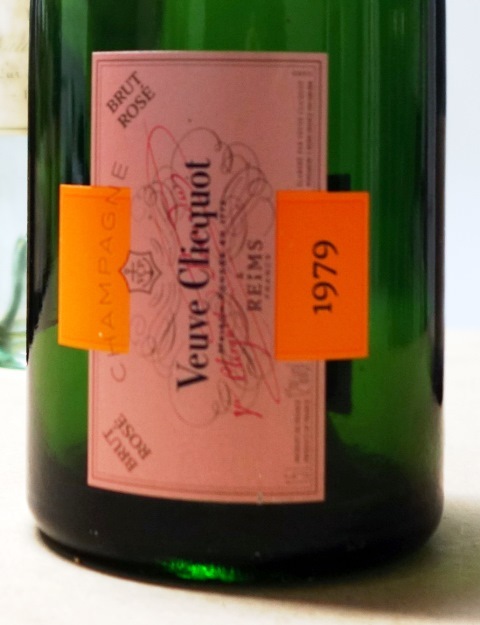 Le Champagne Veuve Clicquot Ponsardin Cave Privée rosé 1979 est le champagne idéal pour une fin de soirée. Il a du charme, une extrême vivacité, il est comme le gendre idéal. Mais Dominique Demarville n’a pas dit son dernier mot. 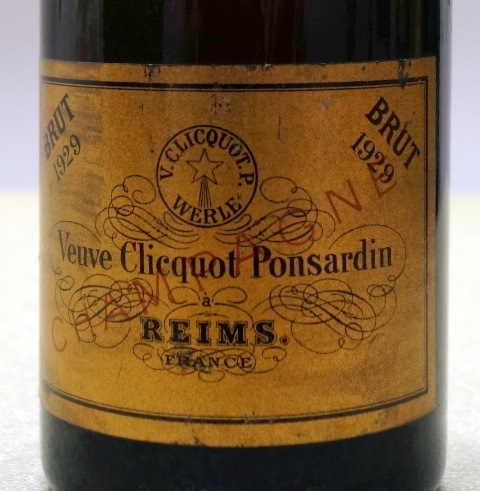 Il veut encore nous faire plaisir et va chercher en cave un Champagne Veuve Clicquot Ponsardin Vintage magnum 1947. Quel dommage que nous ayons déjà voté pendant que nous buvions le rosé, car tout le monde s’accorde à dire que ce dernier champagne devrait être le numéro un sur nos votes. Le nez du champagne est la perfection absolue. 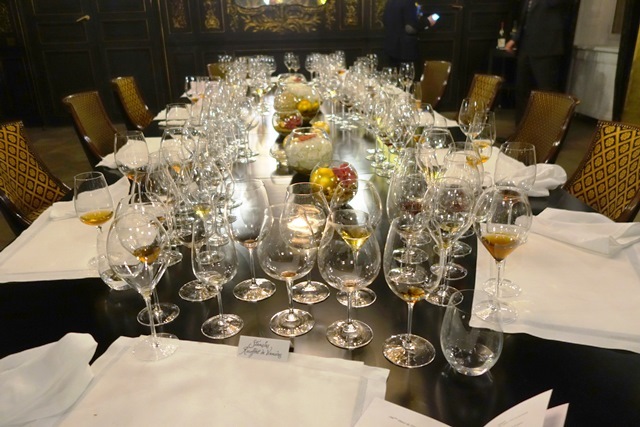 Il est difficile de concevoir qu’un parfum de champagne puisse être plus grand et en bouche ce vin est un accomplissement. Je serais bien en peine de le décrire tant il est la synthèse de ce qu’un champagne pourrait être. C’est un régal absolu à l’équilibre indestructible. Des propos qui s’échangent, je comprends que tout le monde est ravi et que la contreperformance du vin de la Baltique est oubliée. 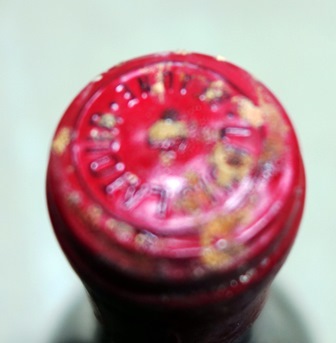 Nous sommes onze à voter pour nos quatre vins préférés au sein de douze vins puisque le dernier champagne de 1947 a été servi après nos votes. 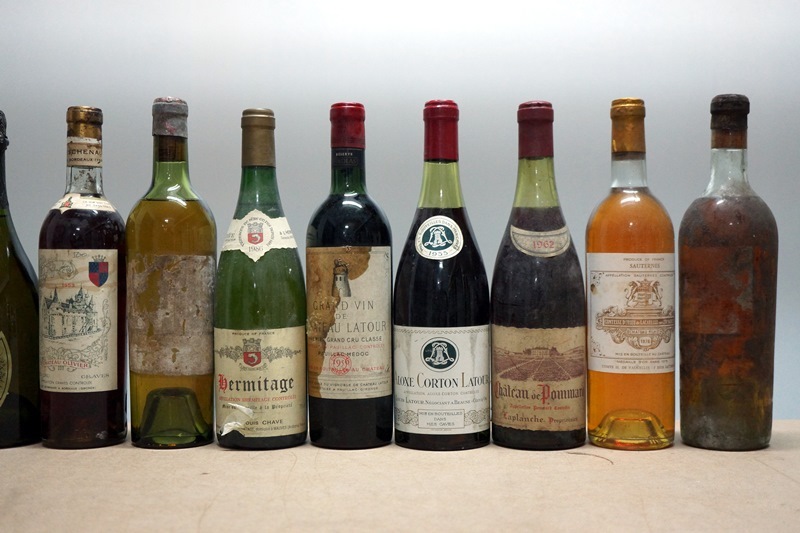 Six vins ont eu l’honneur d’être nommés premier dont le Clos de la Roche 1990 trois fois, le Château Margaux 1947, l’Yquem 1911 deux fois ainsi que le Veuve Clicquot 1840 aussi deux fois, deux convives étant plus sensibles au témoignage historique et au goût complexe perçu, et Latour 1947 et La Tâche 1990 nommés chacun une fois premier. 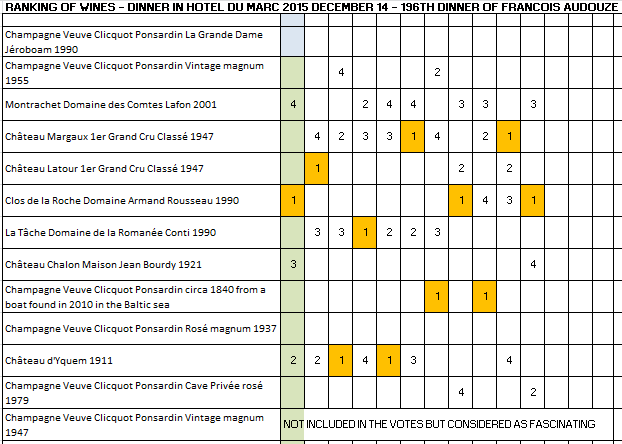 Le vote du consensus serait : (Champagne Veuve Clicquot Ponsardin Vintage magnum 1947 hors vote et hors catégorie), 1 – Château Margaux 1er Grand Cru Classé 1947, 2 – Château d’Yquem 1911, 3 – La Tâche Domaine de la Romanée Conti 1990, 4 – Clos de la Roche Domaine Armand Rousseau 1990, 5 – Montrachet Domaine des Comtes Lafon 2001. 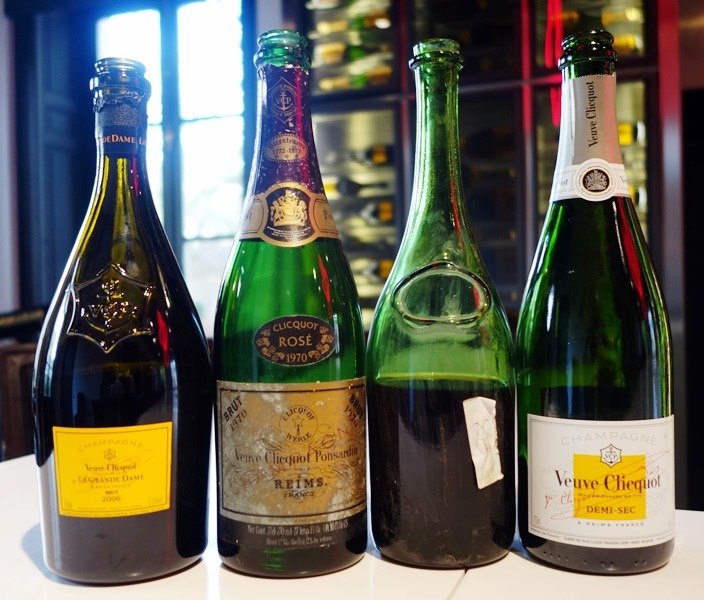 Mon vote est : (Champagne Veuve Clicquot Ponsardin Vintage magnum 1947 hors vote et hors catégorie), 1 – Clos de la Roche Domaine Armand Rousseau 1990, 2 – Château d’Yquem 1911, 3 – Château Chalon Maison Jean Bourdy 1921, 4 – Montrachet Domaine des Comtes Lafon 2001. 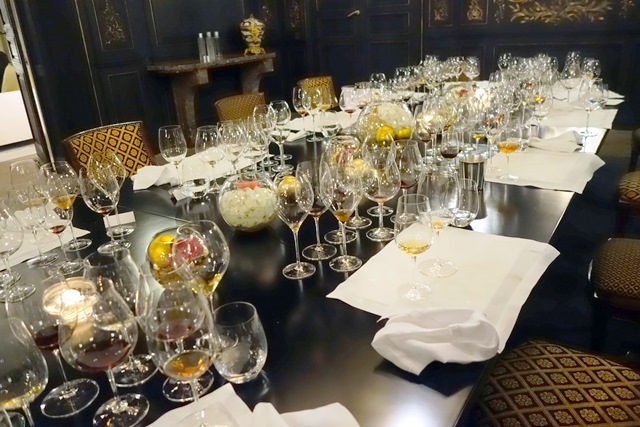 Que retenir de ce dîner ? Les convives s’étaient inscrits en grande partie pour le vin de la Baltique. Le dîner aurait pu être assombri par le défaut du vin. Il n’en fut rien. 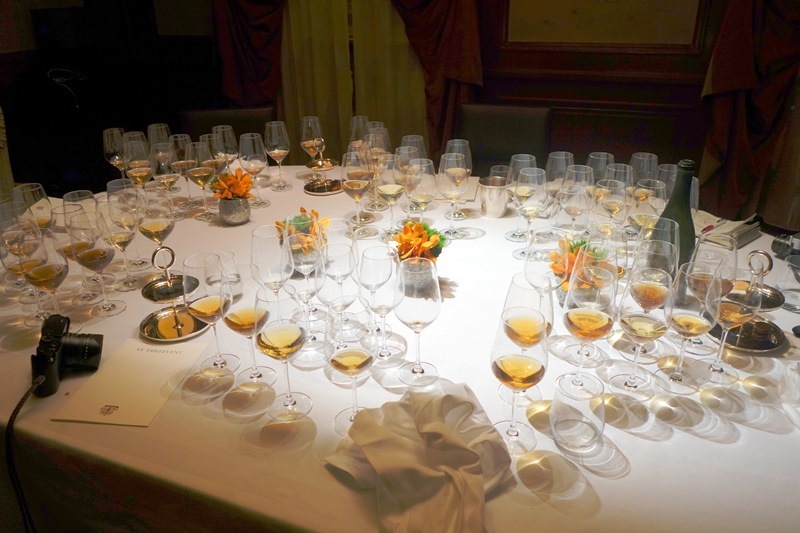 Car la générosité de Veuve Clicquot, via Dominique Demarville, l’exceptionnelle performance des autres vins et le talent magique du chef qui a réalisé des accords qui sont parmi les plus beaux que nous ayons eus dans ces dîners, ont contribué à faire de ce 196ème dîner un événement inoubliable. En rédigeant ce compte-rendu, ces moments de grâce absolue chantent dans ma tête. Ce dîner sera un très grand souvenir. 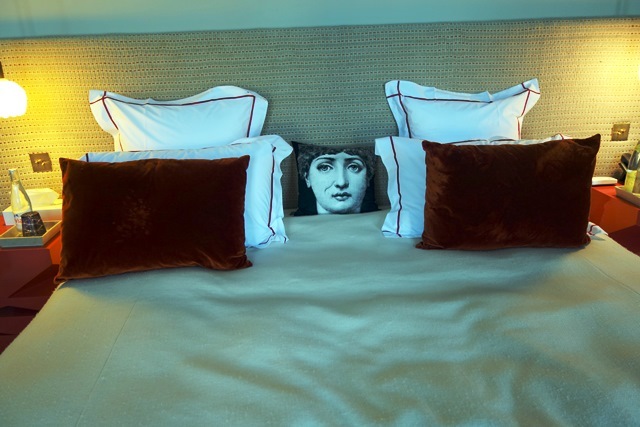 dans ma chambre, une impertinente jeune femme me fait des grimaces et s’installe sur mon lit ! 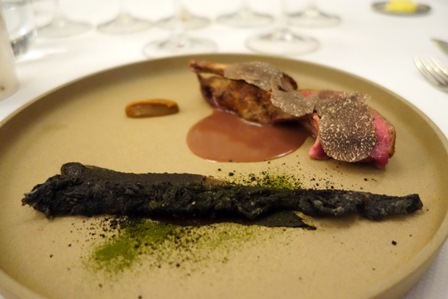 Cette entrée a été publiée dans dîners de wine-dinners le 14 décembre 2015 par François Audouze. 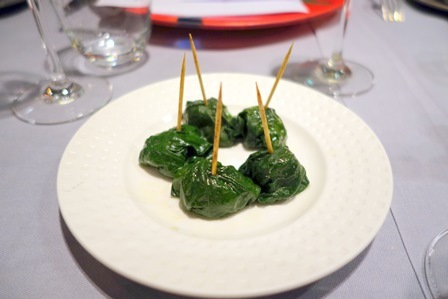 Le 195ème dîner de wine-dinners se tient au restaurant Pages. 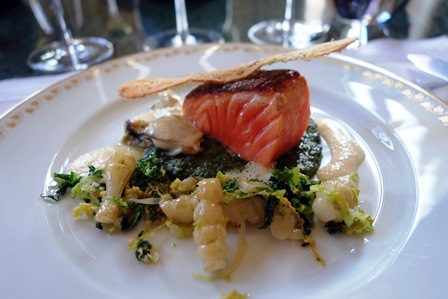 J’y ai organisé beaucoup de dîners privés, et c’est le premier dîner de wine-dinners en ce lieu que j’apprécie pour la cuisine élégante du chef Teshi. Nous nous sommes rencontrés il y a une semaine pour mettre au point le menu et l’adaptation des recettes aux vins. 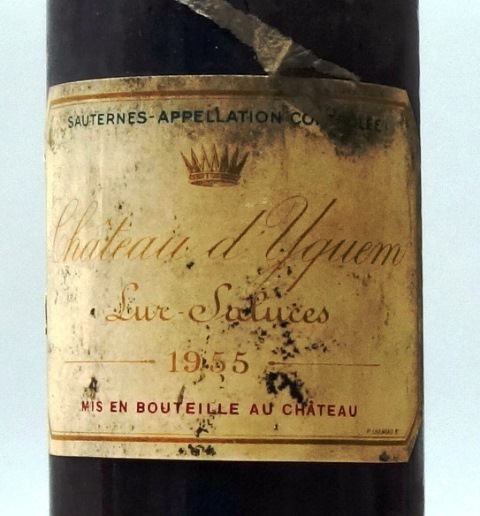 La première surprise à l’ouverture des vins à 16 heures, c’est le Château Olivier 1953. 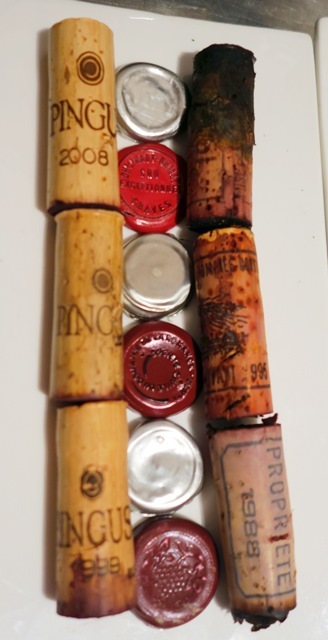 Je l’ai considéré comme un vin blanc, car sa capsule jaune d’or m’y incite mais vu à travers le verre blanc de la bouteille le vin paraît rosé ou bien un vin rouge qui serait légèrement dépigmenté. 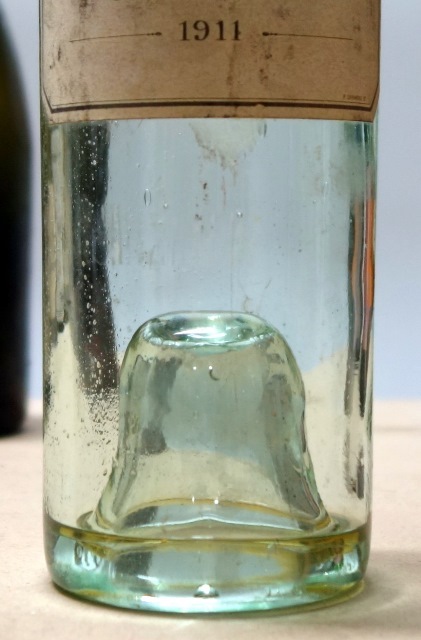 A l’ouverture le nez du vin indique un vin blanc évolué que certains diraient madérisé. Vincent, le directeur du bistrot 116, le restaurant qui jouxte Pages, qui le sent avec moi, dit qu’en fait c’est un vin différent. Et je pense déjà qu’il s’accordera avec l’ormeau que le chef Teshi prépare divinement. Il est à noter que le bouchon de l’Olivier, d’une porosité invraisemblable doit être extirpé au bilame, tant il colle à la paroi. 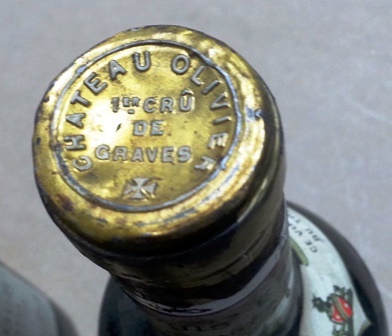 Sa médiocre qualité n’a pas empêché que le niveau soit dans le goulot, ce qui est remarquable pour un vin de 62 ans ! 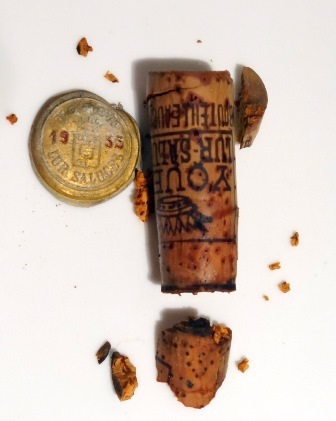 Les autres vins ne posent aucun problème et la grande inconnue est celle du Filhot 1891. 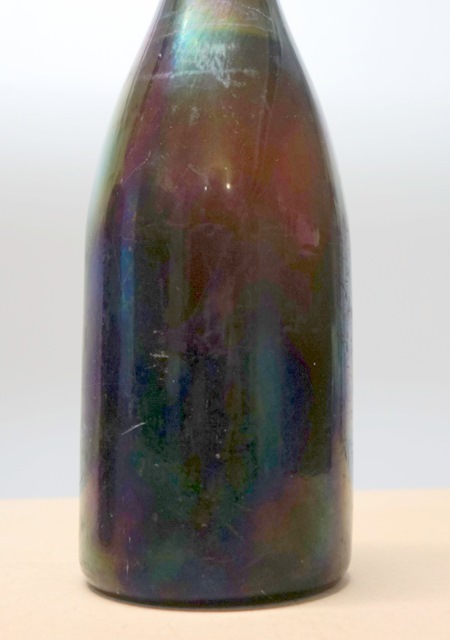 Comment va se présenter ce vin de 124 ans, dont la couleur à travers le verre blanc est d’un glorieux acajou clair ? 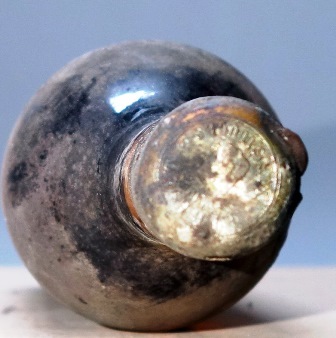 Le niveau est à deux millimètres sous la base du goulot, ce qui est incroyable pour un vin au bouchon d’origine. Le bouchon sort bien, le beau liège sent bon. Le parfum immédiat du vin est parfait. Ce parfum est un concentré de grâce avec des fruits d’une délicatesse extrême. On peut tout y trouver, pomme, groseille, coing, et beaucoup d’autres senteurs exotiques mais aussi de la rose. Ce qui est fascinant, c’est que cette odeur est éternelle. 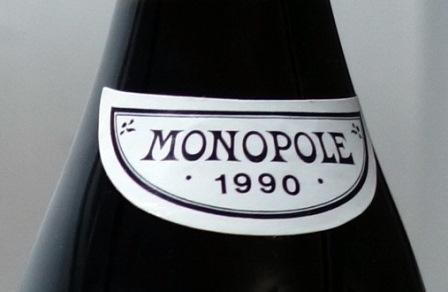 Il est impossible de dire que ce vin a la moindre fatigue. 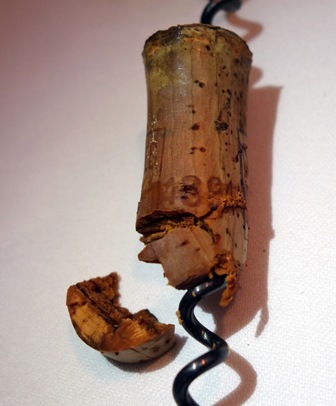 C’est la magie du vin et j’y vois la confirmation de ce que j’affirme sans cesse : le vin est éternel s’il n’est pas confronté aux défauts du bouchon. Je fais sentir ce 1891 à toute l’équipe de cuisine, y compris le chef pâtissier pour que l’on adoucisse la pomme prévue, afin que le Filhot puisse briller dans sa délicatesse. Il est 17 heures, j’ai trois heures devant moi, aussi vais-je au bistrot 116 pendant que notre table se dresse au restaurant Pages. On me propose une bière japonaise avec des fèves japonaises edamame. Ce sont des cosses qui ont deux ou trois fèves, saupoudrées de sel. On croque la cosse pour extraire avec ses dents les fèves et on ne mange pas la cosse. On ne mange que les fèves et le sel. Inutile de dire que rapidement on demande une autre bière. Vincent me dit que ces fèves sont un multiplicateur de son chiffre d’affaires. Ce soir nous devions être dix ou onze, la table ayant été organisée par un homme de la finance pour ses clients. Des défections de dernière minute portent le chiffre à huit, alors que toutes les bouteilles ont été ouvertes. 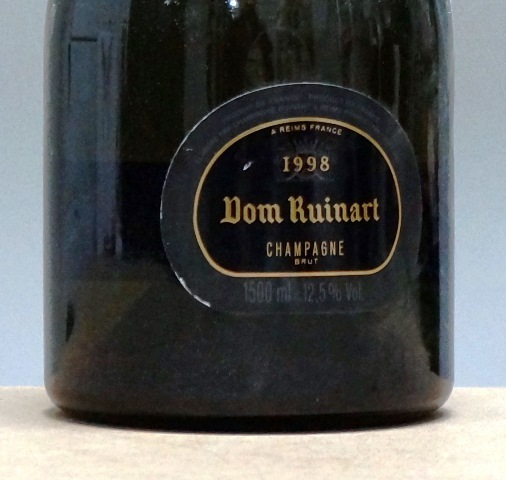 L’apéritif se prend avec le Champagne Dom Ruinart magnum 1998. 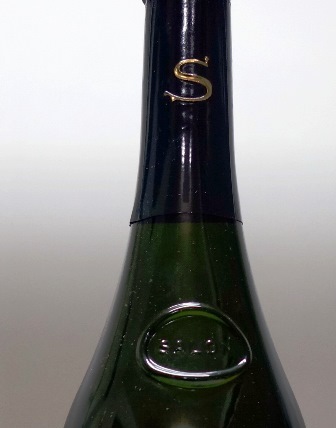 C’est un champagne confortable qui profite bien du format magnum, qui lui donne une belle ampleur. 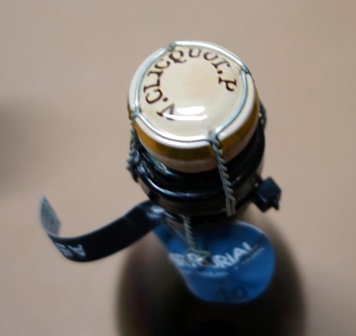 Agréable et consensuel, ce champagne gagnerait à être un peu plus canaille. 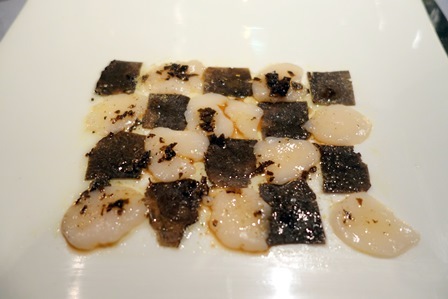 Le menu du chef Ryuji Teshima dit Teshi est ainsi composé : Saint Jacques et caviar de Sologne / Ormeau et truffes Noires du Périgord / Tourte de langoustine / Pigeon, Feijoa / Bœuf de Galice 85 jours, Simmenthal 30 jours de maturation, bœuf Ozaki poêlé sur la fonte et sur le Bincho / Stilton / Tarte aux pommes à la bergamote. 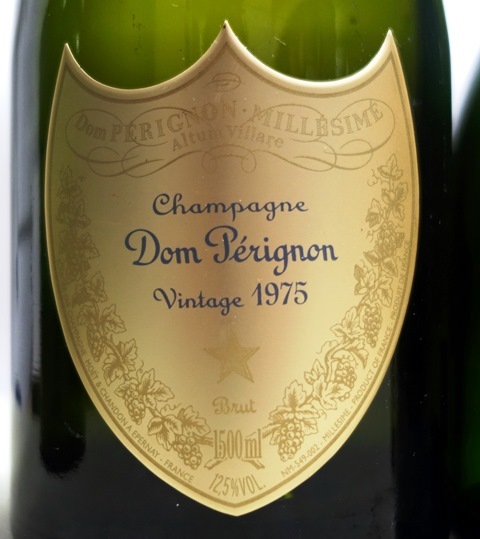 Le Champagne Dom Pérignon 1975 transforme les visages de mes convives. Nul n’attendait un champagne de quarante ans à ce niveau de charme et de séduction. Car il est sacrément séducteur le bougre ! 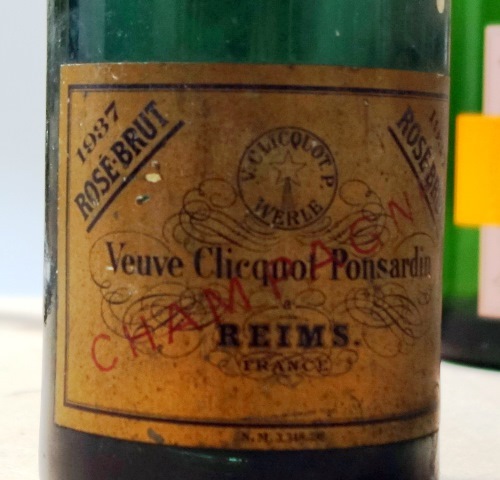 Le champagne est floral, avec de belles fleurs blanches et roses, mais il est aussi pénétrant, avec une longueur quasi infinie, faite de beaux fruits d’été et une vinosité vive. 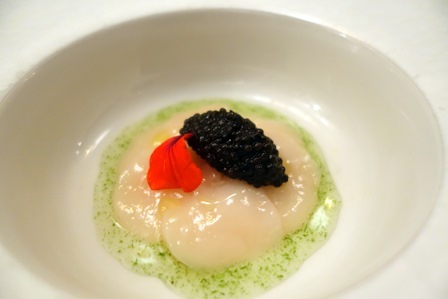 Avec la coquille crue au goût sucré, le champagne est picoté mais c’est surtout avec le caviar mêlé à la coquille que l’accord devient transcendantal. 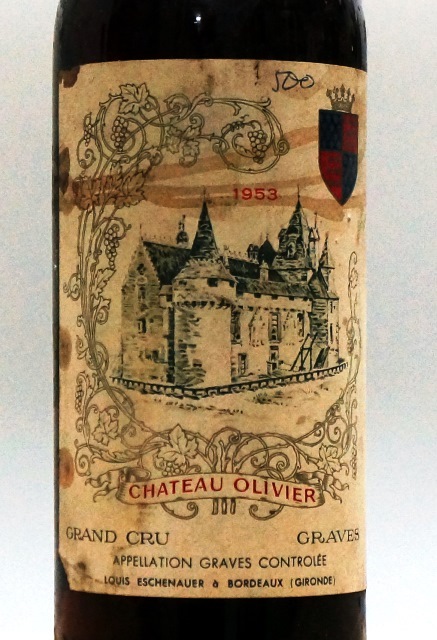 Le Château Olivier Grand Cru Classé de Graves blanc 1953 ne correspond à aucun repère. Il n’est pas madérisé, il serait plutôt fumé comme une infusion. 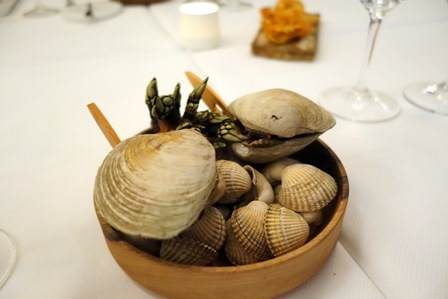 Ses saveurs sont charmantes déroutantes et avec la belle mâche de l’ormeau, l’accord se trouve merveilleusement bien. On est sur des infusions végétales et vineuses, sans acidité sensible. 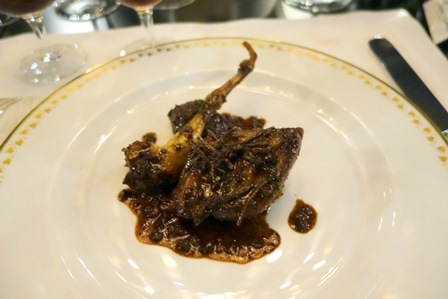 J’adore cet accord et la truffe n’apporte pas grand-chose au vin. C’est la douceur ferme de l’ormeau qui le fait briller. 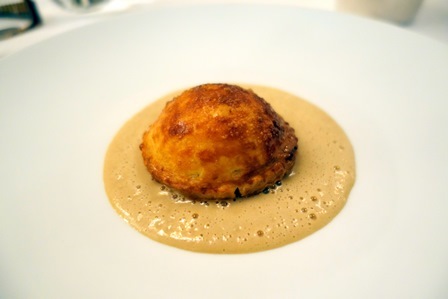 La tourte de langoustine est originale, avec une sauce faite avec les carapaces pilées, un peu comme une sauce Nantua légère. Deux vins l’accompagnent. 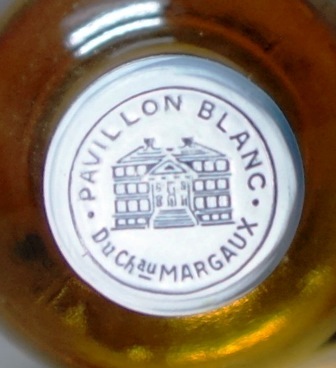 Le Pavillon Blanc de Château Margaux 1979 est d’un équilibre extrême. Nul ne pourrait lui donner d’âge. Sa couleur est d’un jaune citron mâtiné de jaune d’or, le nez est franc et direct et le goût est d’une grande plénitude, joliment citronné mais aussi blés d’or. Il est joyeux, et si l’on devait lui faire un reproche, c’est qu’il est trop « bon élève », celui qui récite bien ses leçons. 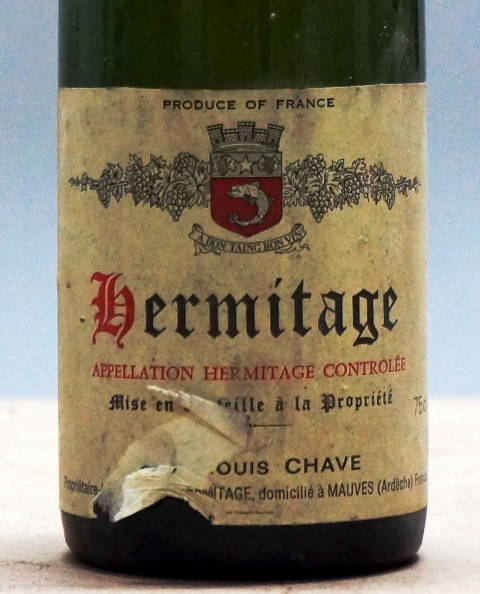 On en ferait volontiers son ordinaire mais à côté de lui l’Hermitage Jean-Louis Chave blanc 1986 est majestueux. Les trompettes de la renommée devraient chanter sa gloire car il est d’un accomplissement total. Il a la puissance, la longueur, l’équilibre et la complexité d’un grand vin. Il y ajoute une vibration extrême. Il emplit la bouche d’un liquide qui virevolte. Il y a la fluidité d’un cours d’eau de montagne, des allusions végétales, des vibrations de litchi. C’est surtout la sauce qui crée avec l’Hermitage un accord fusionnel majeur. Je suis conquis. Le pigeon est un bijou de finesse et de tendreté qui convient parfaitement aux deux bordeaux délicats. 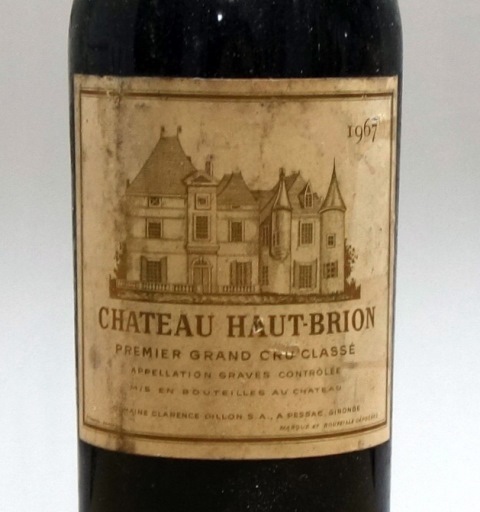 Le Château Haut Brion 1er Grand Cru Classé de Graves 1967 est d’un équilibre rare. Il est courtois, racé, et montre qu’il est grand. Il est tout velours et truffe. 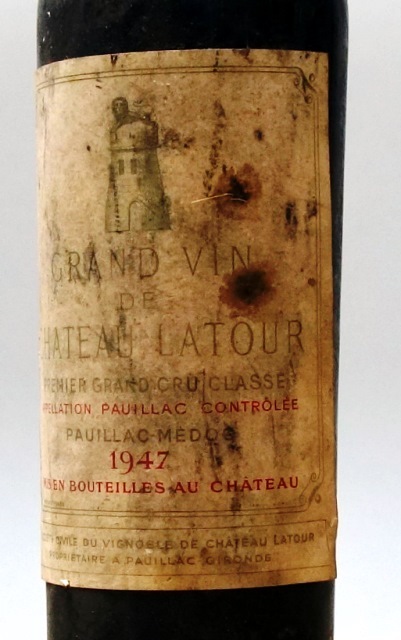 Le Château Latour 1er Grand Cru Classé Pauillac 1956 est manifestement un grand vin mais a moins d’équilibre que le Haut-Brion. Il y a aussi une petite acidité qui gêne le plaisir. 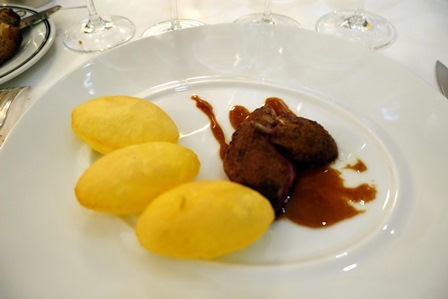 Les deux vins sont grandement avantagés par la chair fine et gourmande du pigeon. Les trois bœufs en dés de belle taille sont accompagnés de deux bourgognes dont les nez sont tout en douceur. C’est la grâce et la séduction. 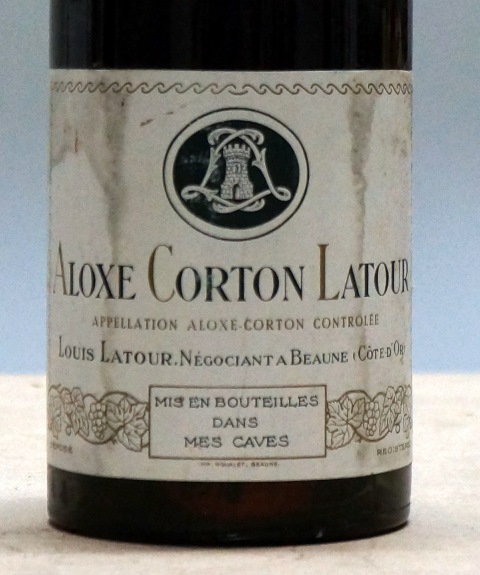 L’Aloxe-Corton Louis Latour 1955 est magnifique de générosité, d’aplomb et de subtilité. Ce vin n’a pas d’âge alors qu’il a soixante ans. Son équilibre et sa sérénité sont rares. 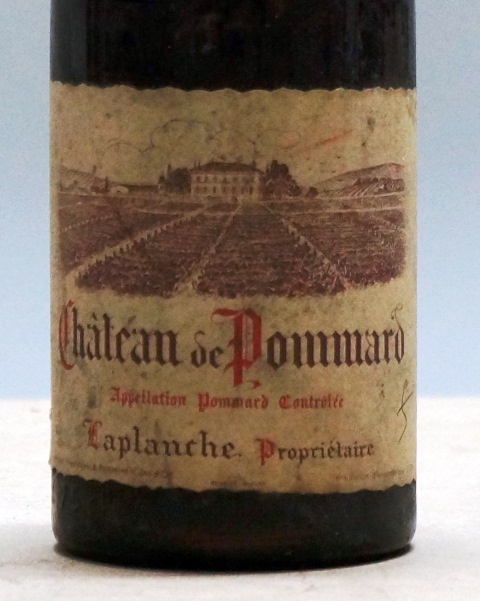 Comme pour les deux bordeaux le Château de Pommard Laplanche propriétaire 1962 est marqué par une acidité excessive, malgré un message délicat. C’est un beau bourgogne, féminin, mais la petite trace acide me gêne. Encore une fois la viande supporte bien les deux vins. 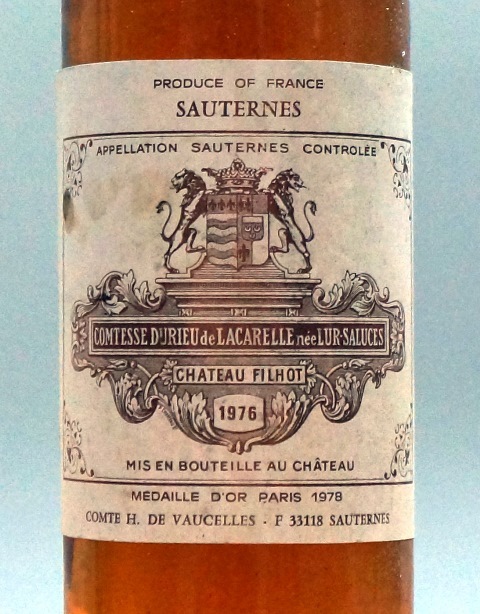 Alors que le Château Filhot Sauternes 1976 a 39 ans, l’âge du chef, je le perçois comme un gamin. Il a une belle puissance riche, goûteuse de fruits exotiques. 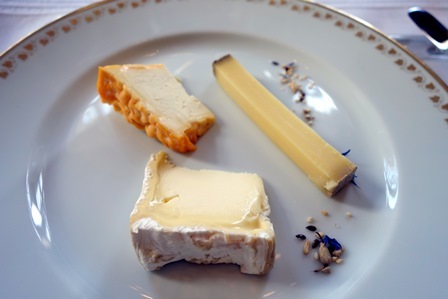 Avec le stilton, l’accord n’est que du bonheur. Vient maintenant le clou du dîner. 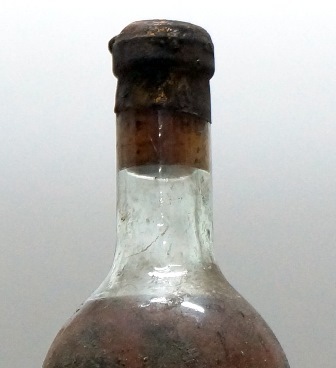 J’avais été impressionné à l’ouverture par le parfum élégant du Château Filhot Sauternes 1891. Ce parfum est toujours aussi délicat. Mais la grosse surprise est que le vin a mangé son sucre au point de paraître très sec. Or le parfum ne l’indiquait pas. Derrière la sécheresse, l’élégance et la subtilité sont là. On retrouve des fruits oranges et bruns mais comme en infusion. 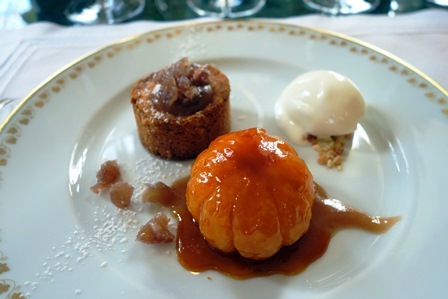 La longueur est belle et la tarte aux pommes se marie bien. 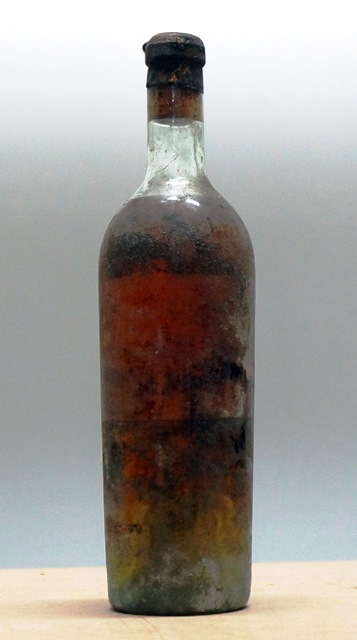 Boire ce vin de 124 ans demande du recueillement, car il y a des complexités qu’il faut aller découvrir, de rose, de tabac, d’un soupçon de miel et de légers zestes. 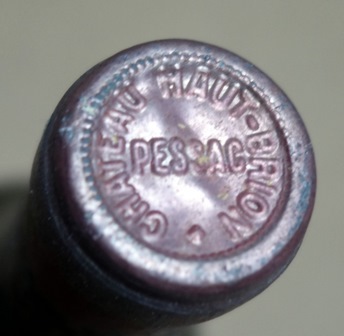 La magnifique couleur du vin est un régal. C’est un souvenir que garderont longtemps les convives. Nous sommes huit à voter pour nos quatre préférés parmi les onze vins. Neuf vins ont figuré dans au moins un vote et il y a une certaine logique à l’oubli de deux vins. 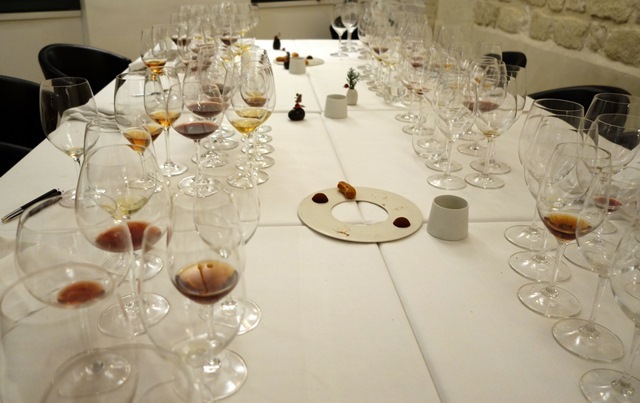 Ce sont les plus classiques et ceux qui ressemblent le plus à ce que l’on a l’habitude de boire, le Dom Ruinart 1998 et le Pavillon blanc de Château Margaux 1979. Ce n’est donc pas une sanction de leur valeur mais le fait qu’ils font moins voyager vers des saveurs inconnues. 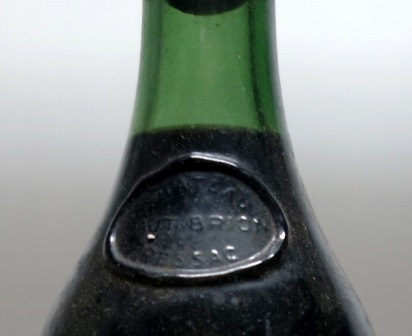 Quatre vins ont été nommés premiers, le Dom Pérignon quatre fois premier, l’Hermitage Chave deux fois et le Haut-Brion et le Filhot 1891 une fois chacun. 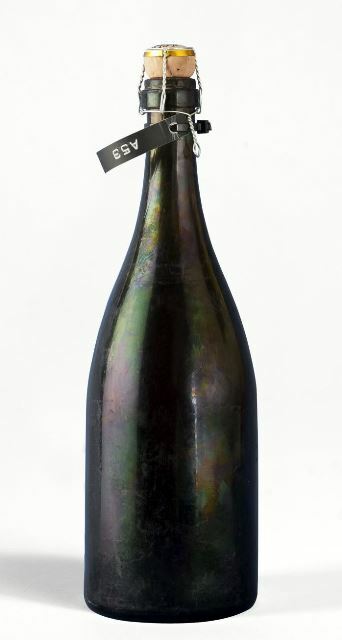 Le Dom Pérignon a figuré dans les huit votes et le Filhot 1891 dans six votes. 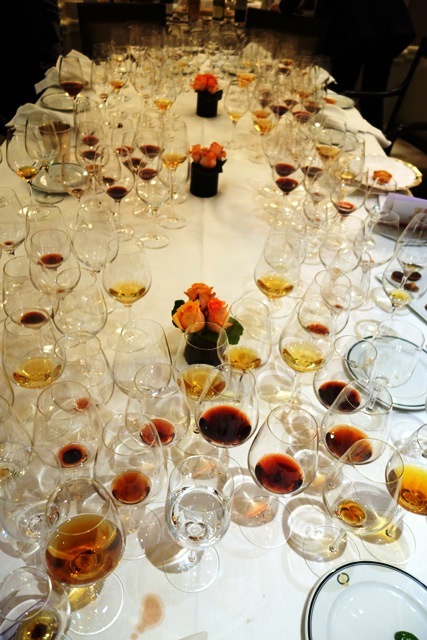 Le classement du consensus serait : 1 – Champagne Dom Pérignon 1975, 2 – Château Filhot Sauternes 1891, 3 – Hermitage Jean-Louis Chave blanc 1986, 4 – Aloxe-Corton Louis Latour 1955, 5 – Château Haut Brion 1er Grand Cru Classé de Graves 1967. 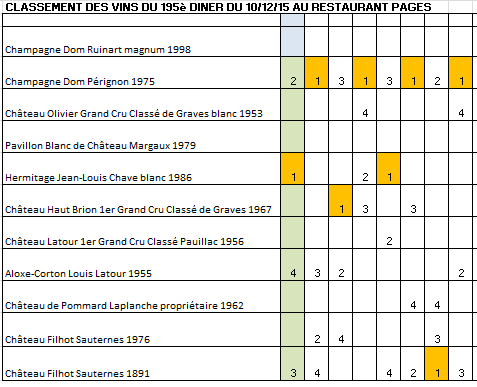 Mon classement est : 1 – Hermitage Jean-Louis Chave blanc 1986, 2 – Champagne Dom Pérignon 1975, 3 – Château Filhot Sauternes 1891, 4 – Aloxe-Corton Louis Latour 1955. L’exercice qu’a accompli le chef Teshi mérite les applaudissements. 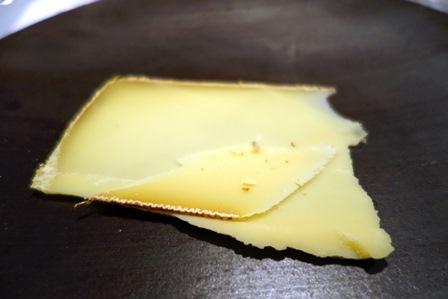 Il a abandonné pour un soir le style de sa cuisine habituelle pour se concentrer sur le produit de base du plat en épurant tous les à-côtés qui sont pourtant d’une rare cohérence dans ses menus. 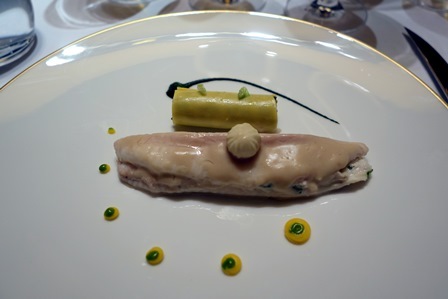 L’accord de la sauce de la tourte de langoustine avec l’Hermitage blanc 1986, l’accord de l’ormeau avec le Château Olivier 1953, l’accord du pigeon avec le Haut-Brion 1967 sont les trois plus beaux accords, suivis par le Dom Pérignon 1975 avec Saint-Jacques et caviar. Dans une atmosphère joyeuse, nous avons passé une excellente soirée épicée par un Filhot 1891 très émouvant. le vin entre le château Olivier et l’Hermitage n’a pas été inclus et n’était pas au programme. 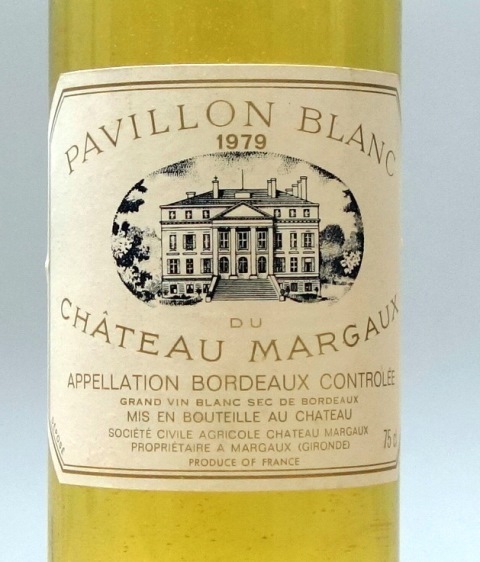 Il a été remplace par le Pavillon Blanc de Château Margaux 1979 non présent sur la photo de groupe. 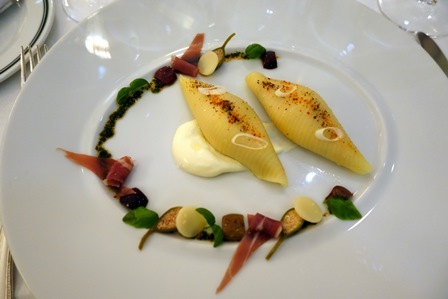 photos des plats. j’ai photographié les trois bœufs alors que j’avais mangé plus de la moitié du plat ! 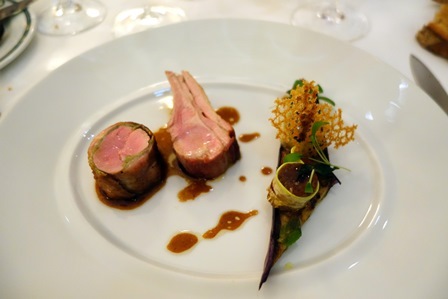 Cette entrée a été publiée dans dîners de wine-dinners le 10 décembre 2015 par François Audouze. 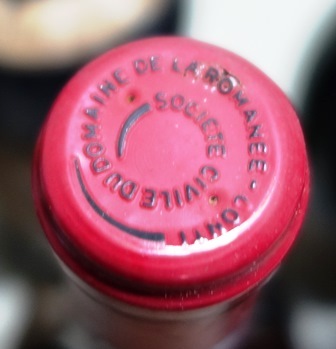 One of my wine suppliers offers me one day to acquire a bottle of 1929 Les Gaudichots Domaine de la Romanée Conti. 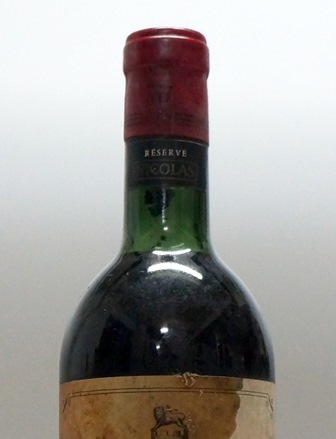 This bottle is a particular rarity, since wine is actually La Tâche but do not bear the name, and I dreamed of to find one someday, especially in this special year. The price seemed unattainable and unreasonable, but I did not want to miss this unique opportunity. So I talked about this wine with my friend Tomo, with which we open big bottles, asking him to share the cost and drinking together. 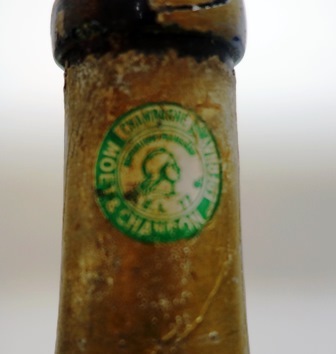 Tomo and I agreed and we purchased this bottle which I kept in my cellar. 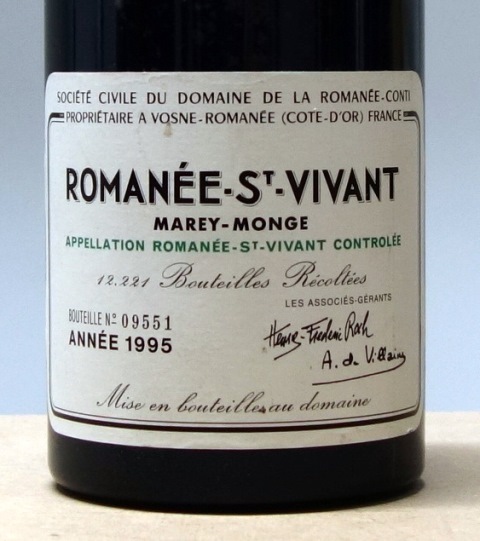 The idea of ​​drinking this wine with Aubert de Villaine, co-owner of Romanée Conti, was very natural, and when I met him, I told him about this bottle and he did not decline the proposal I have made. In the months that followed, I sent him messages which he did not respond. 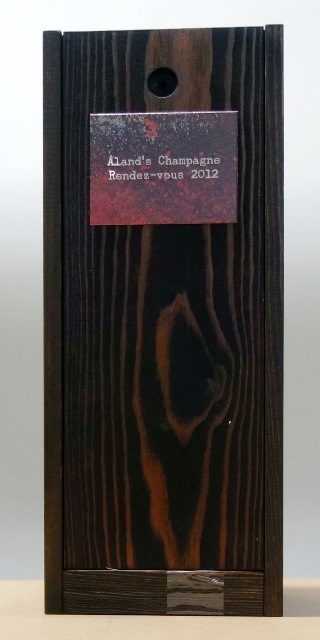 The case seemed closed, we would drink this bottle, Tomo and me. 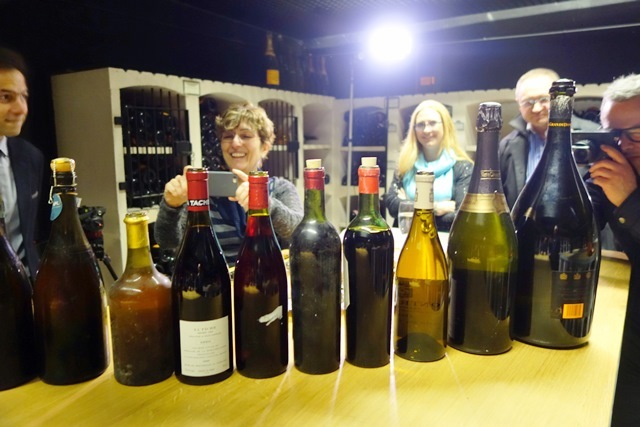 Moreover, a journalist who has directed many films about domains and winemakers is in the process of work on a film on Henri Jayer be released in 2016 to mark the tenth anniversary of the death of the famous winemaker. He calls me and asks me if it would be possible to film me commenting wine tasting of Henri Jayer. 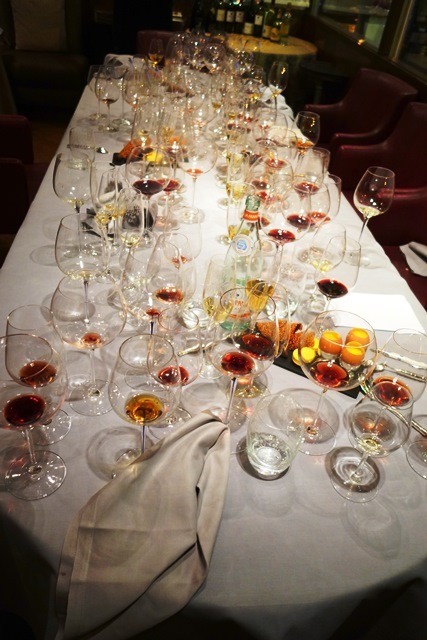 A few years ago, when Thomas Bravo-Maza made a film « The Four Seasons of Romanée-Conti, » he made me the same request and we found ourselves, Tomo and I filmed drinking two Romanée Conti, 1996 brought by Tomo and 1986 brought by me, and after the shooting made in restaurant Grand Véfour the morning, we finished the two bottles for lunch at this restaurant for our delight, after the departure of camera crews. The temptation was great to combine with Tomo to open two wines of Henri Jayer, in the spirit of equality and reciprocity, and at this occasion we would open The Gaudichots 1929. The date is taken. For conscience, I warn Aubert de Villaine from the date of our next lunch and a miracle happens only in westerns, since the US cavalry always arrives five minutes before the end of the film to save the hero threatened by Indians, Aubert de Villaine announced that he could join us. It will be at Taillevent, Aubert, Tomo and I, with our wives. 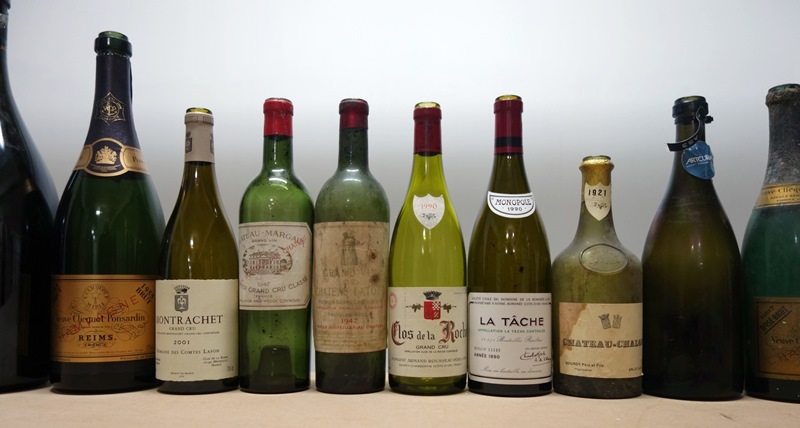 One Monday morning, at 10:30, I stand at Taillevent restaurant to open bottles for that lunch of six, Aubert de Villaine, my friend Tomo and I and our wives. Aubert warned me that he would come by train and would be at the restaurant at one pm. 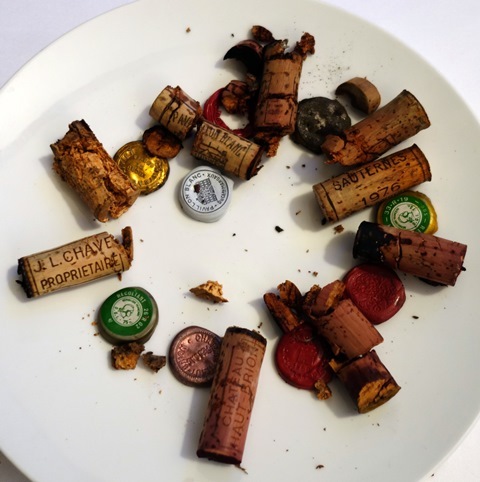 Laurent, reporter joined me at the same time because he will film the lunch with two patterns, the very rare bottle Gaudichots of Domaine de la Romanée Conti 1929, and two bottles of Henri Jayer Tomo and I brought. Aubert on his side had sent me a wine of the domain. Tomo has added a champagne for aperitif and I imitated him with a champagne for dessert. Laurent filmed me while I open the bottles. 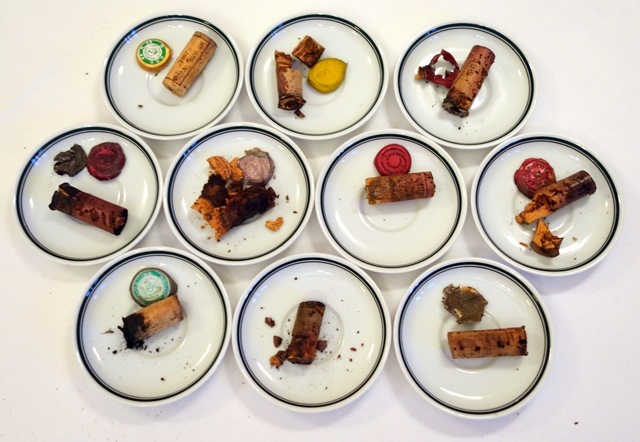 The wines of Henri Jayer are easy to forge, I inspect the beautiful caps that seem authentic and fragrances comfort me. 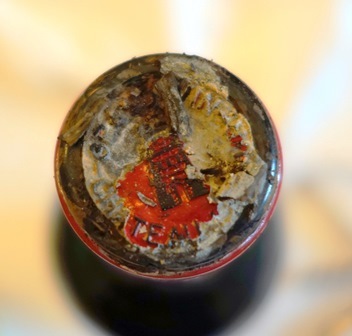 The cap on the Grand Echezeaux Domaine Romanée Conti 1979 is very tight in the neck and the bottle was refurbished in 2005. 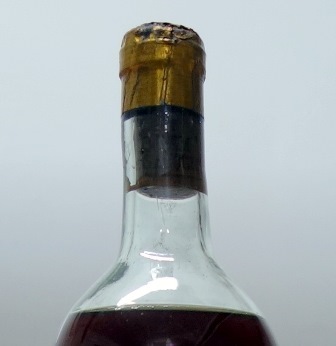 My attention is great when I open the bottle of Gaudichots 1929. 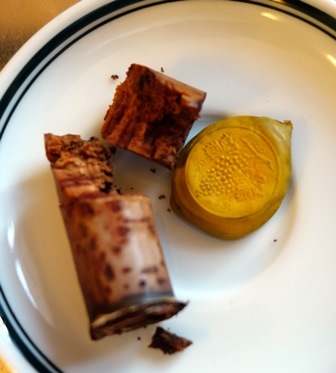 The cork is perfect, but comes around sheared four pieces. The perfume is reassuring. Phew, we’re having a big bottle. At noon, the Gardinier brothers gathered all the restaurant staff and their staff on the ground floor of the restaurant for a minute of silence related to the dramatic events that mourning Paris and Laurent and I join their group. The train of Aubert de Villaine is a few minutes late and like many people avoid public transportation, there is a tail that deters Aubert to take a taxi. So he arrives in an underground station and SMS asking me to guide him to find the Taillevent. As a precaution I went to meet him with Tomo and we walked on the Avenue Friedland. From far I see that he is alone. His wife is not with him while my wife and Tomo’s wife, dressed in a beautiful kimono, had come to share a meal with her. I am sad because I wanted a long time that our meetings with Aubert also associate his wife. Pity. 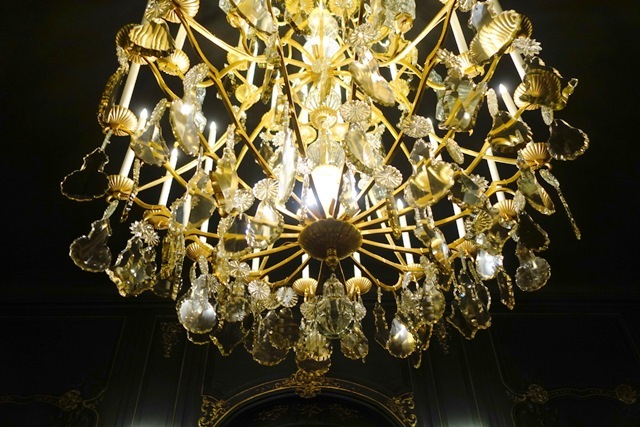 We are on the first floor in the beautiful lounge at the Guimet Chinese décor. 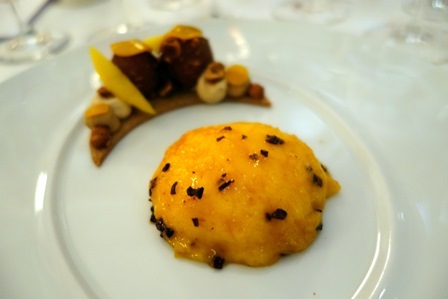 The set menu developed with Jean-Marie Ancher and Alain Solivérès is: Atlantic sea bass / mignon of veal, red beets, quince and potimaron / deer nuts, pepper / plum sauce, champagne and meringue. 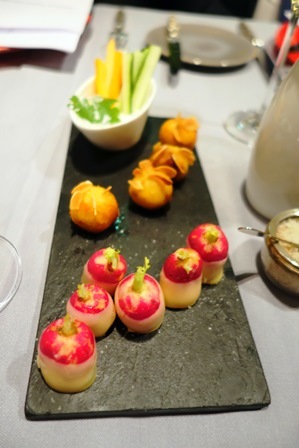 At the aperitif, delicious gougères, we drink a Champagne Krug Collection 1976 to the color of a light amber. 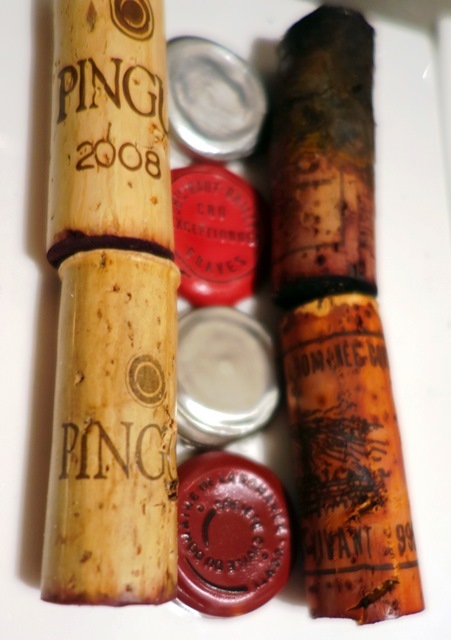 The nose is superb generosity and openness. In the mouth it is a wine of sun, the bubble is small but you do not mind. It already has a beautiful evolution towards bringing the serene maturity. 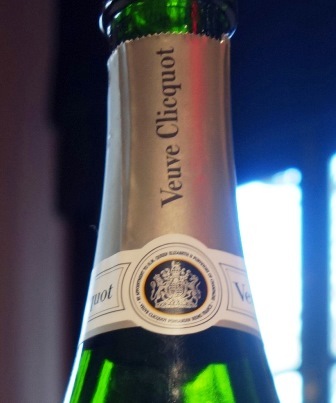 It is a great champagne especially by its complexity. Acidity is beautiful. The fruits are yellow with a peaceful lemon. Tomo who brought wonder if the wine is flawless. 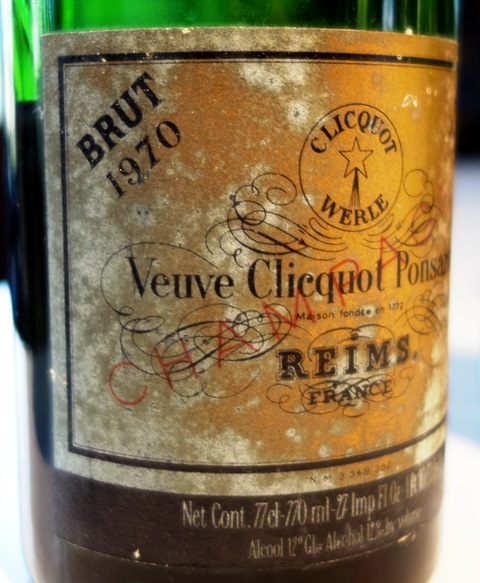 We agree on the fact that this is not a perfect bottle for that 1976 could be even greater, but it has lots of charm and personality. It lacks just a bit of radiation. This observation is at the margin. 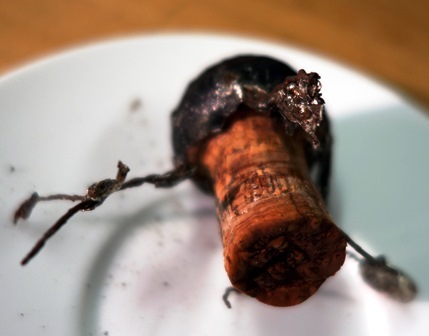 The appetizer, a lobster to Tarama salata smoked herring roe is delicious and vibrates the champagne. 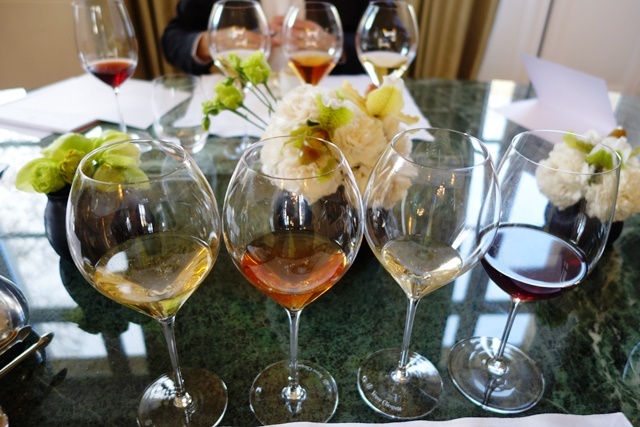 With line bar, we drink both wines of Henri Jayer that Laurent wants to include in his film and what is striking is that both wines are very different. 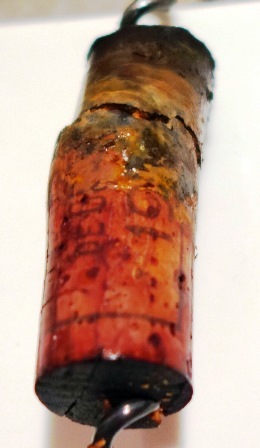 Vosne Romanée Cros The Parantoux Henri Jayer 1991 has an incredible personality. 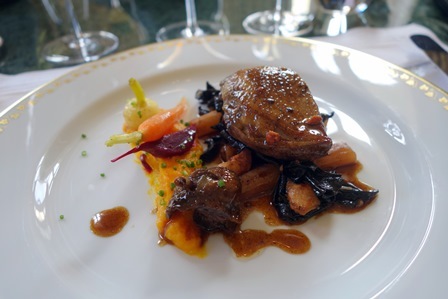 It is extremely bourguignon, with a nice salinity and has a remarkable tension. Its fruit is rather brown. This is one of the greatest wines of Jayer it was given me to drink. 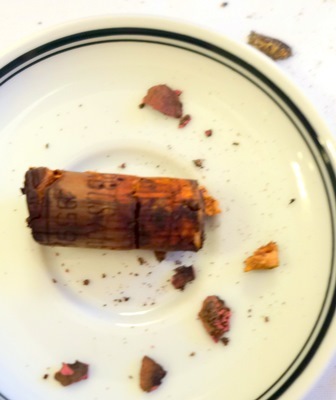 Beside him, Vosne Romanée Cros the Parantoux Henri Jayer 1995 a redder color than that of 1991 and its fruit on the palate is also more red. But it has much less vibration and emotion as 1991. Initially the difference persuasion is great. It will diminish and end of meals, 1995 has made some of the difference. Aubert lived in the same village that Henri Jayer and had long discussions with him over the whole or not whole stalking and other subjects, although they spoke little together at the time. He anecdotes that Laurent films with great interest. Grands Echezeaux Le Domaine de la Romanée Conti 1979 appears with cute calf. Its scent is compelling and conqueror. It is like a powerful breath. In the mouth the wine is booming. It has a rare power, but in the style of the area, ie it exposes more than is needed. I like salinity is discrete and rose petals. 1979. It is a beautiful success Pink fruit tart is just superb. What impresses is its power. 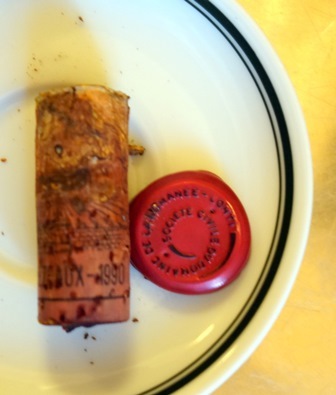 I had expected that Les Gaudichots Grand Premier Cru Domaine de la Romanée Conti 1929 that appear deer service but the temptation to taste the next wine from another area. Certainly in doing so, we no longer have two loves like Josephine Baker, but only one, the 1929. From the first contact, we know we are dealing with absolute perfection. 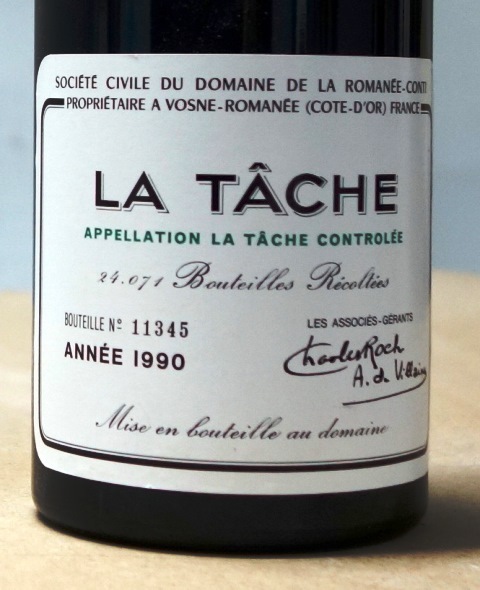 This wine reminds me fast enough La Tâche 1962 which is the most legendary vintage of La Tache. 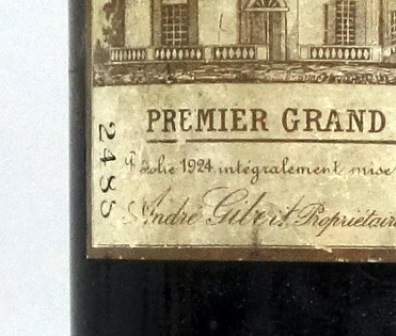 One can also think of préphylloxériques wines that are very rich as this one. 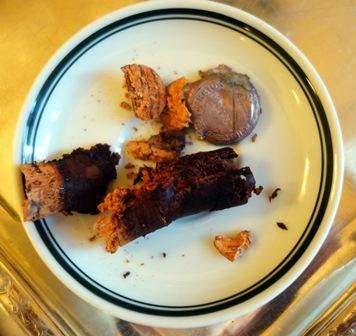 It has a density, grain and chews that are copies. 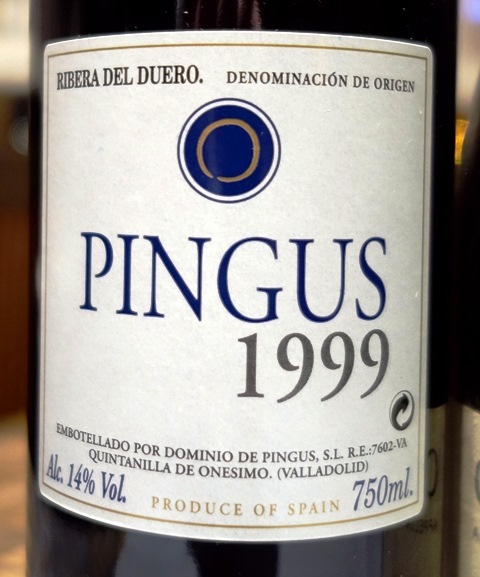 We are moved because this wine is at a level of rare perfection. It does not age and is confusing because it is likely that if you opened it in a hundred years, it would have the same balance. So Aubert tells us that there are times when words can no longer express what we feel and the wine imposes itself in our hearts and our memories. The final form, the richness, range, consistency make this wine an unforgettable example of the perfection of the wines of Domaine de la Romanée Conti. 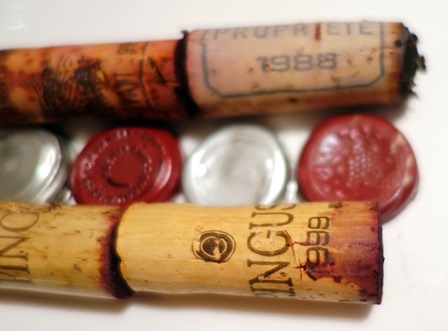 Without that everyone does not want to announce it, we are close to the great wines that we never have drunk. The enthusiasm is there. The frame where we see truffles and candied grapes melts into a block, an elusive rock that gives us a sense of perfection. 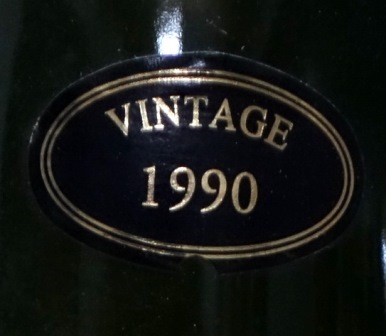 Return to the other wines is possible, especially the 1991, which is distinguished in a similar direction. 1979 is beginning of his quiet enthusiasm to become more gallant and it suits her. The 1995 gains in personality and in wealth. I brought a 1966 rosé Champagne Mumm who sadly died. Unpleasant nose and mouth. Jean-Marie Ancher always eager to please us exhume the cellar of Taillevent A. Jacquart Champagne rosé NV without disturbance to the color that has a cider acidity, also the end point will be given by the Armagnac Domain Cavaillon J. Lassis 1928 dame-jeanne who had already finished a previous meal in this place. 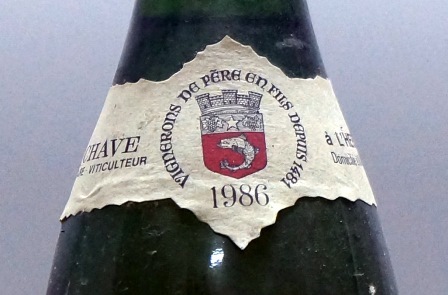 We had the chance to drink a 1929 wine legend who confirmed his legendary status, two wines of Henri Jayer that match the excellent reputation of this wine and champagne 1976 great level. The film was able, with Aubert de Villaine capture great moments and beautiful stories of the history of Burgundy wines, Tomo and I had the chance to share great wines with Aubert de Villaine. Only missing his wife would have met our wives. This is a good reason to start a dinner of this level by finding another excuse ! 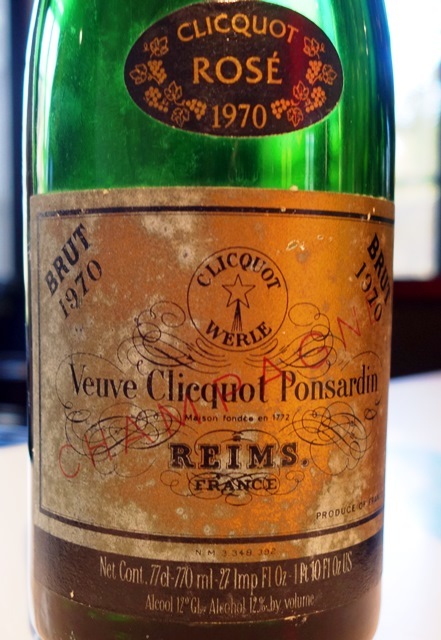 that match the excellent reputation of this wine and champagne 1976 great level. The film was able, with Aubert de Villaine capture great moments and beautiful stories of the history of Burgundy wines, Tomo and I had the chance to share great wines with Aubert de Villaine. Only missing his wife would have met our wives. This is a good reason to start a dinner of this level by finding another excuse !